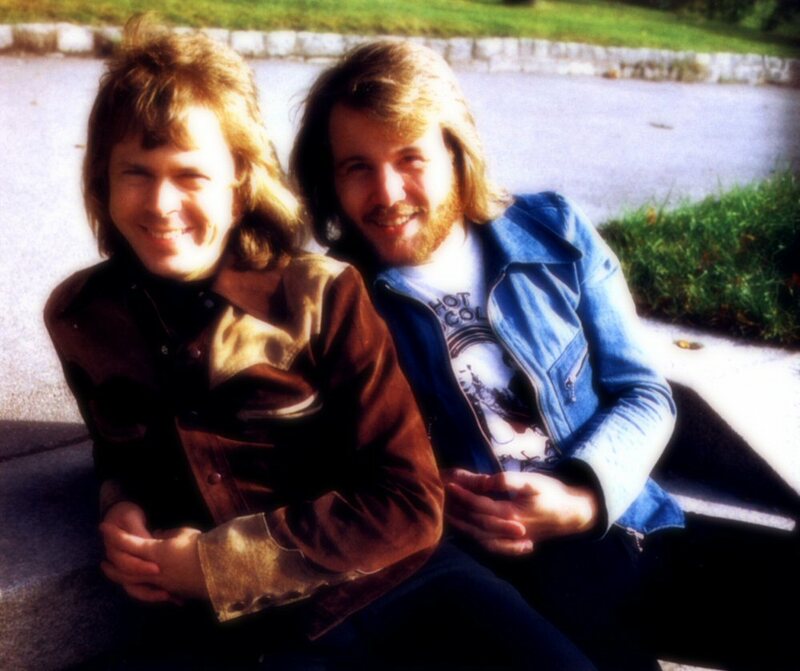 Björn and Benny met each other in the summer 1966 in Västervik and became friends. 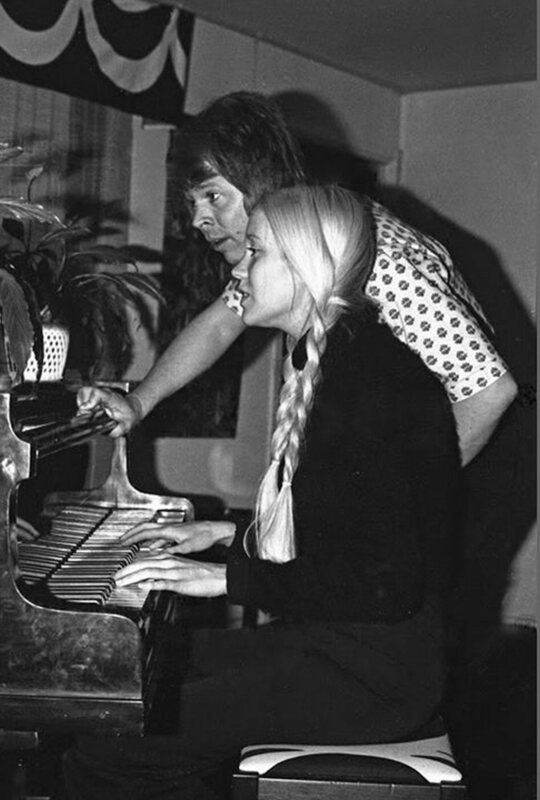 They started to write music together. 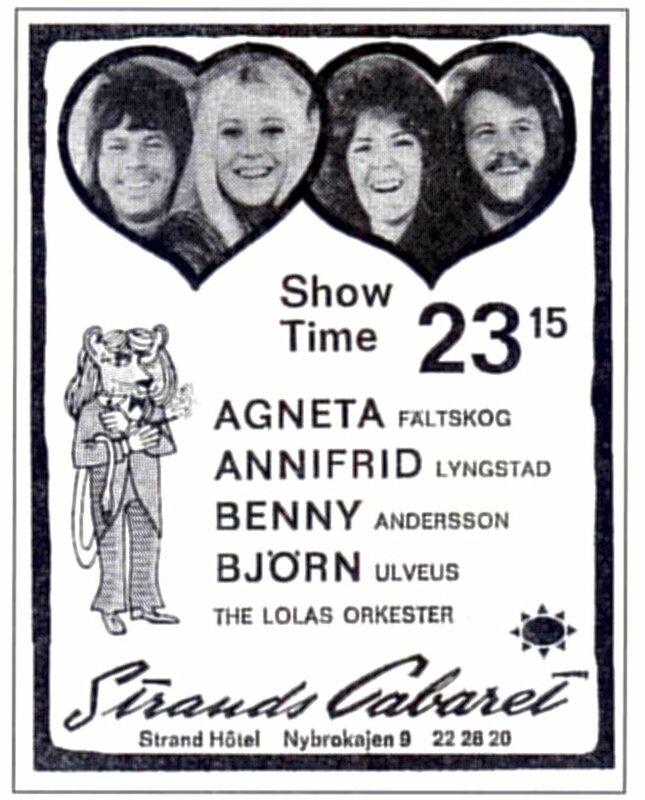 Some years later Björn met Agnetha Fältskog and Benny met Anni-Frid Lyngstad - that's how it started. 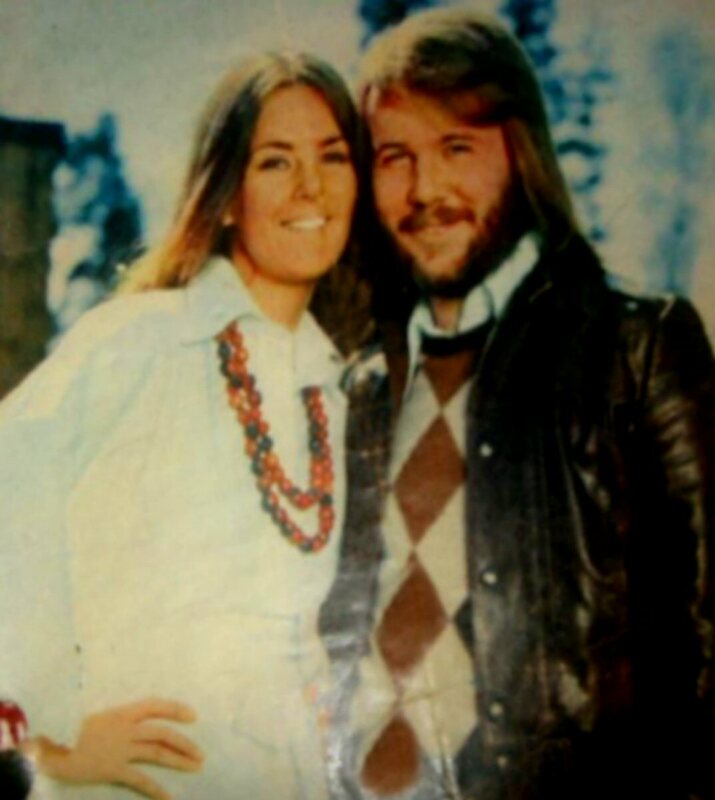 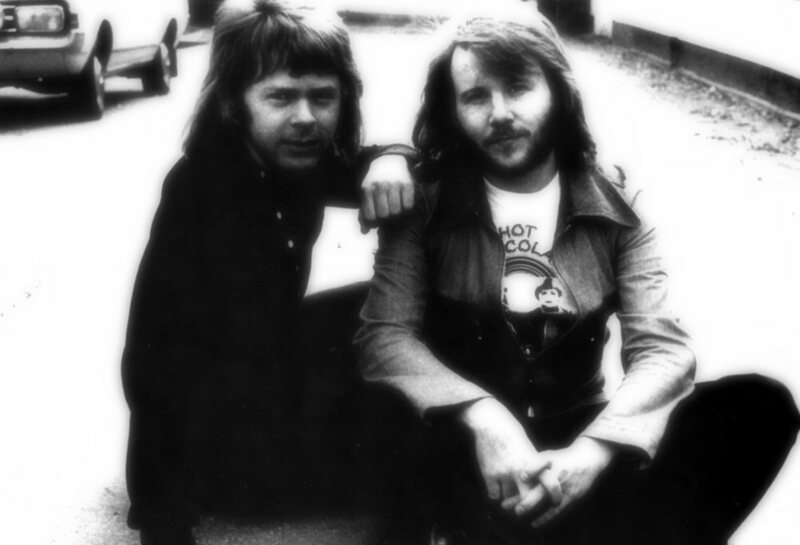 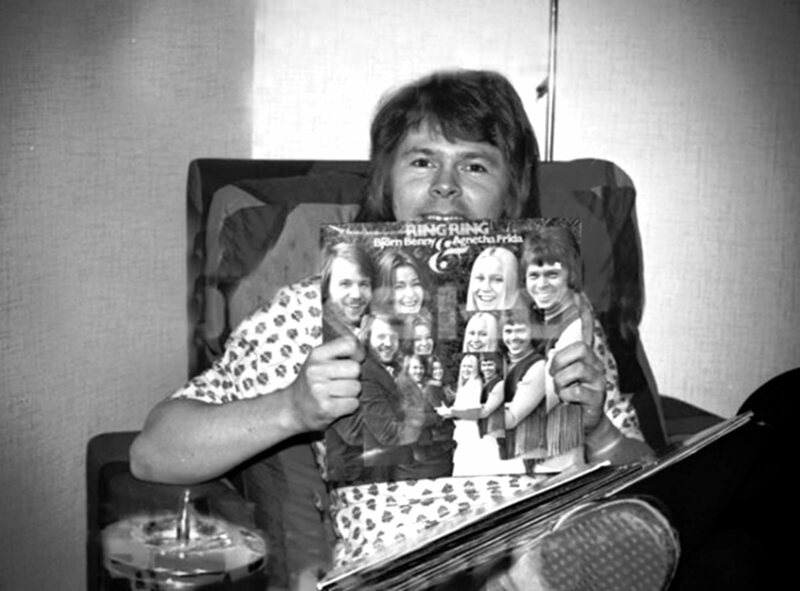 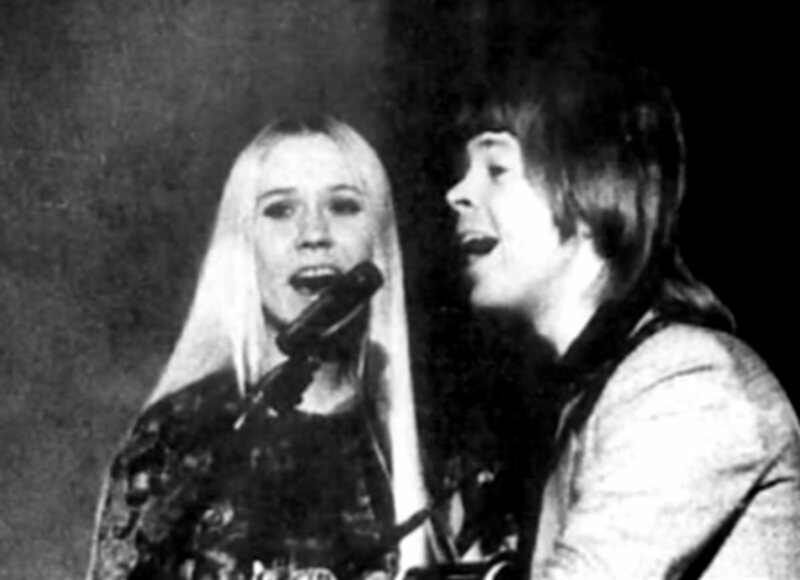 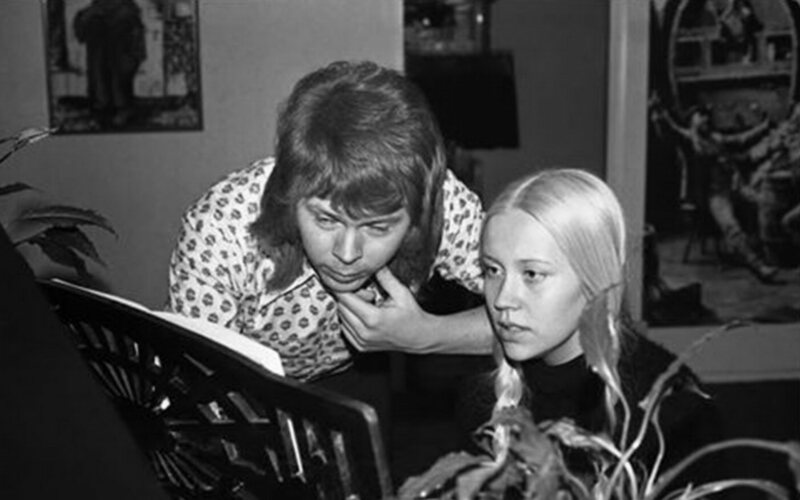 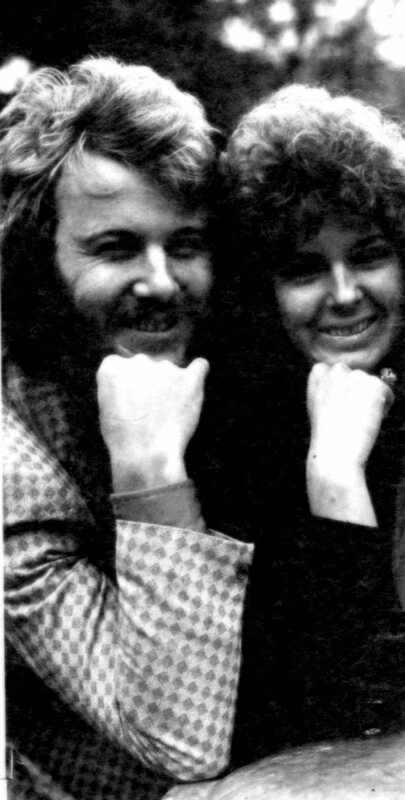 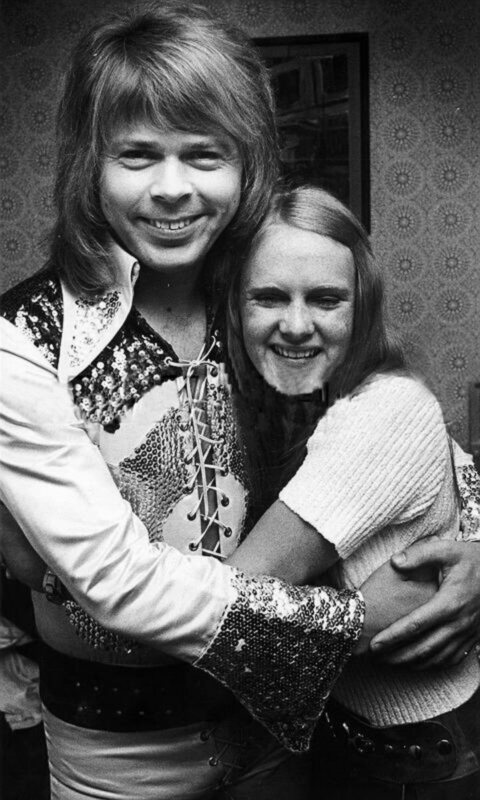 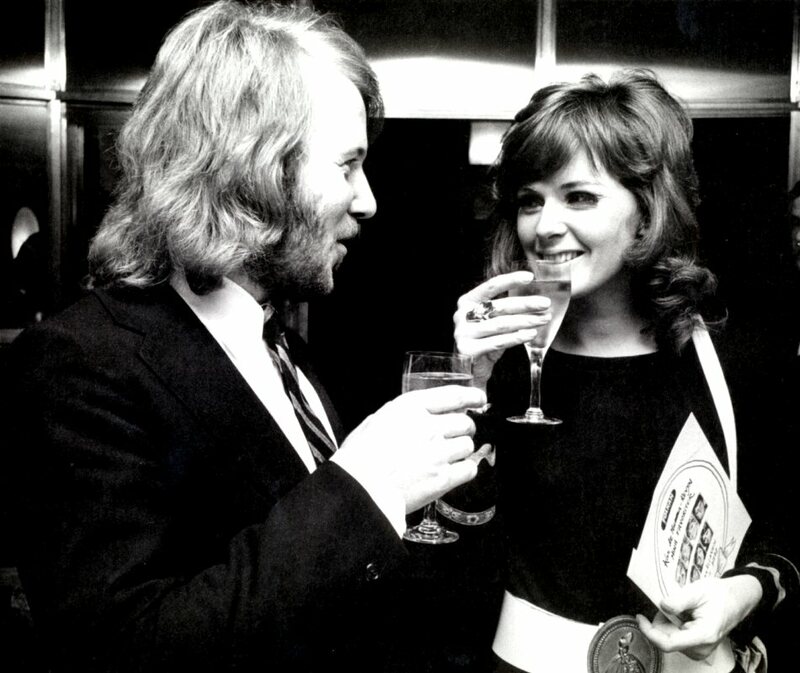 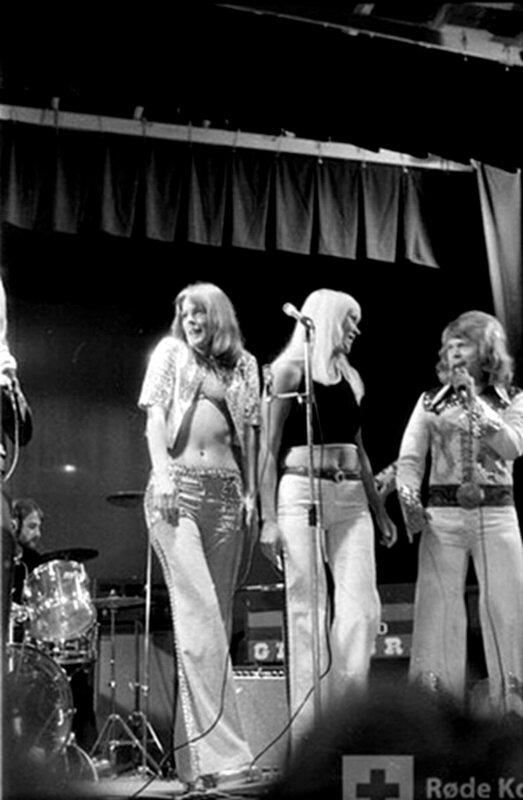 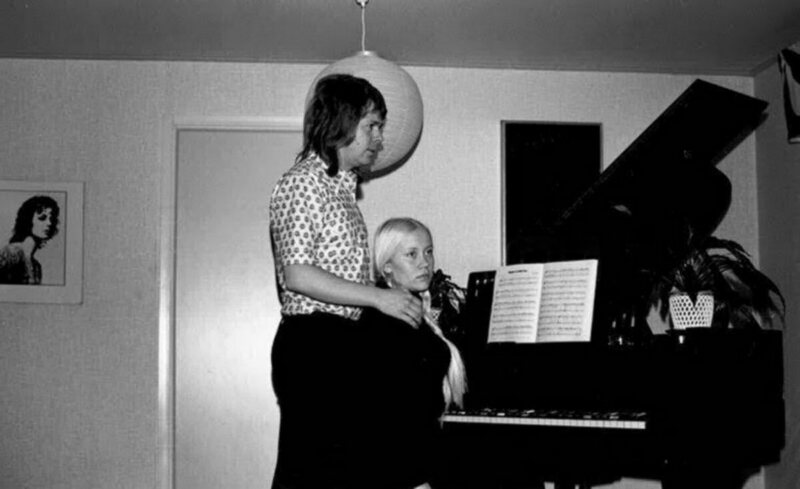 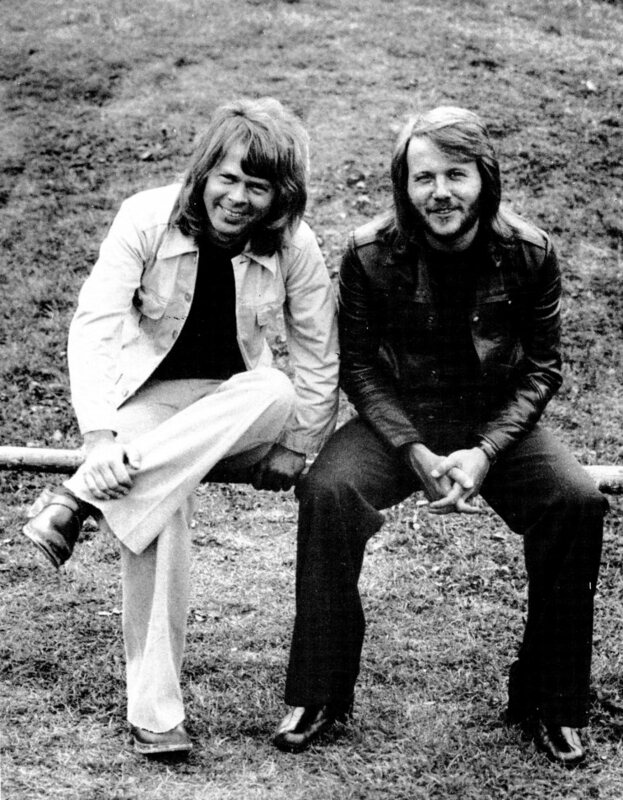 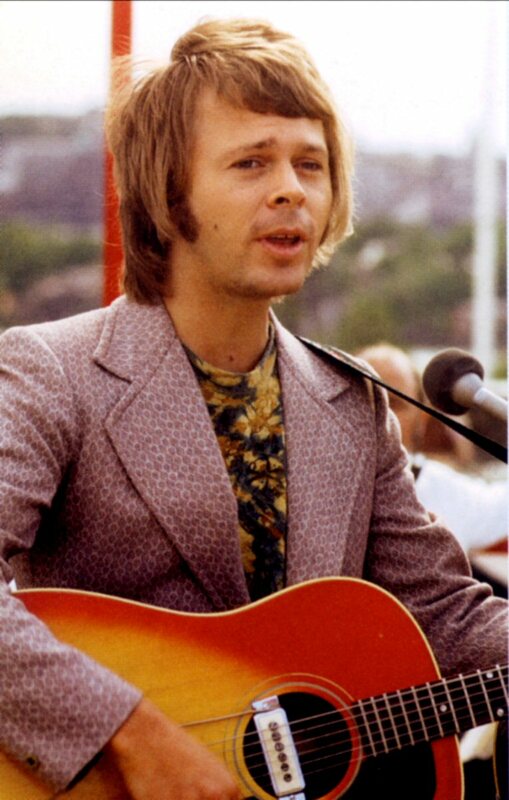 Both girls started to participate in Björn and Benny's recording sessions at the beginning of 1970s. 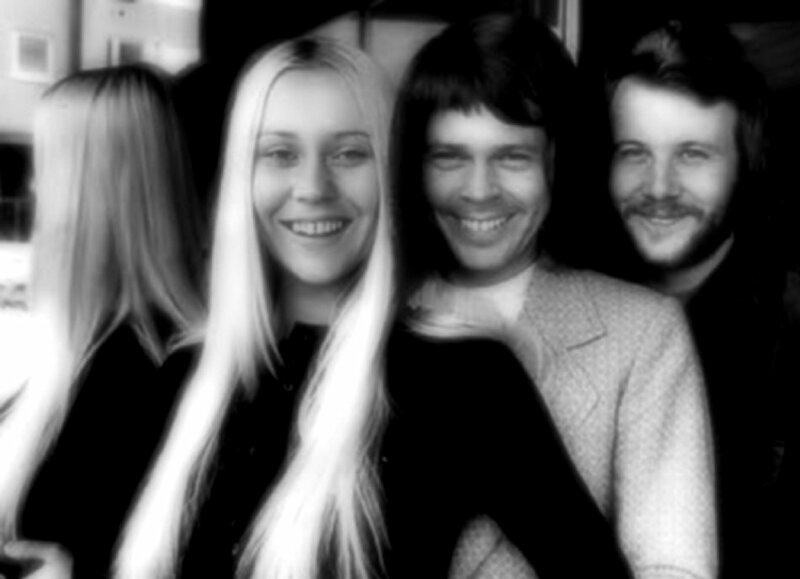 They used to contribute with backing vocals and harmonies. 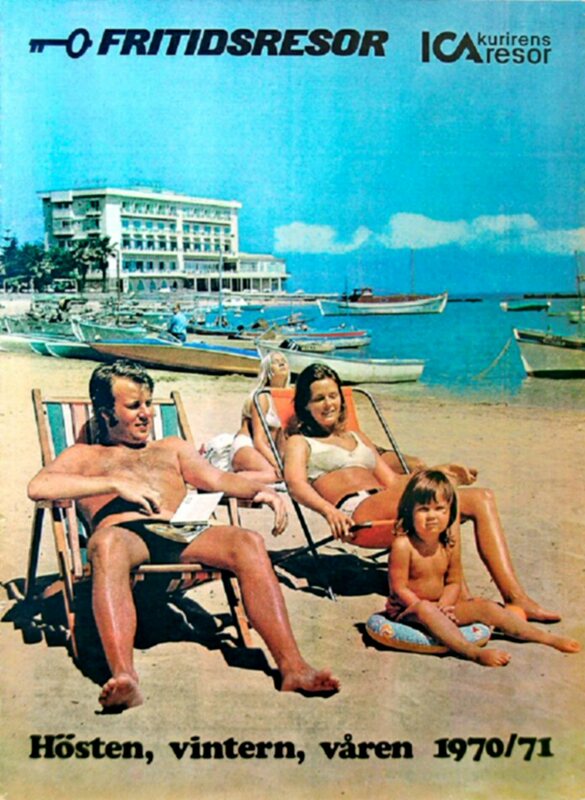 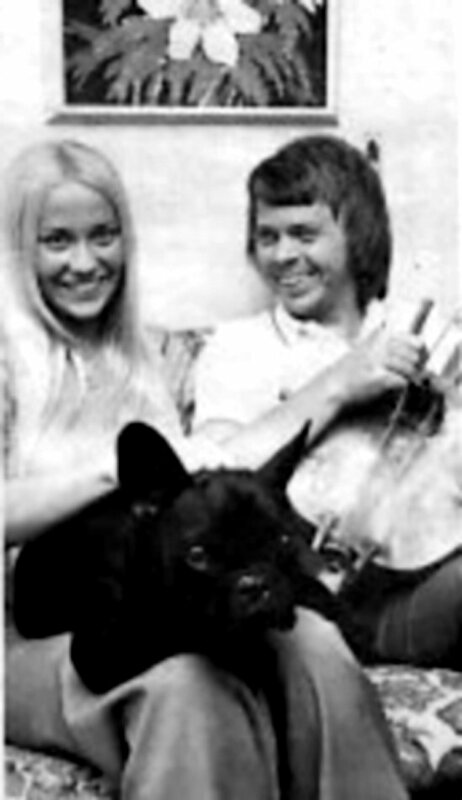 At the beginning of April 1970 both couples went together to Cyprus for short holidays in the sun. 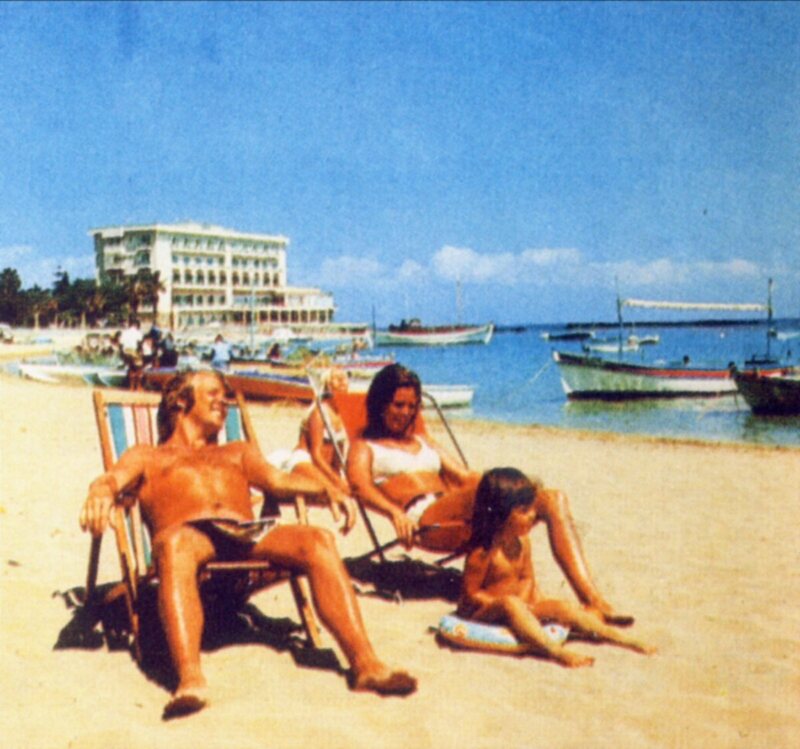 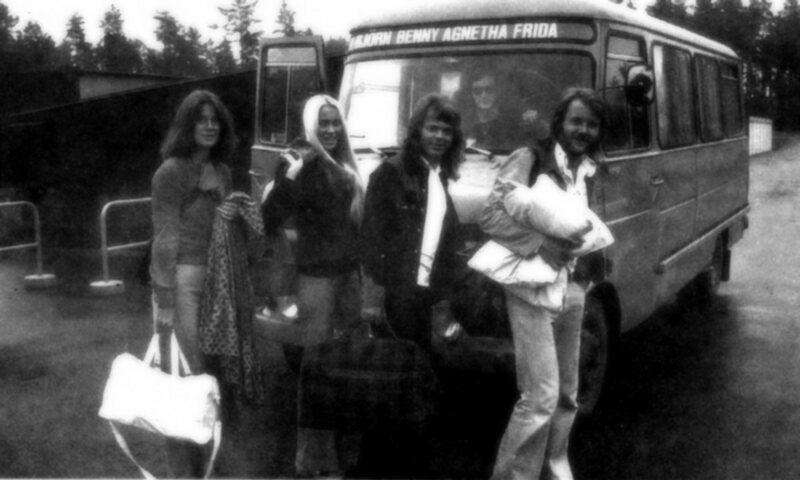 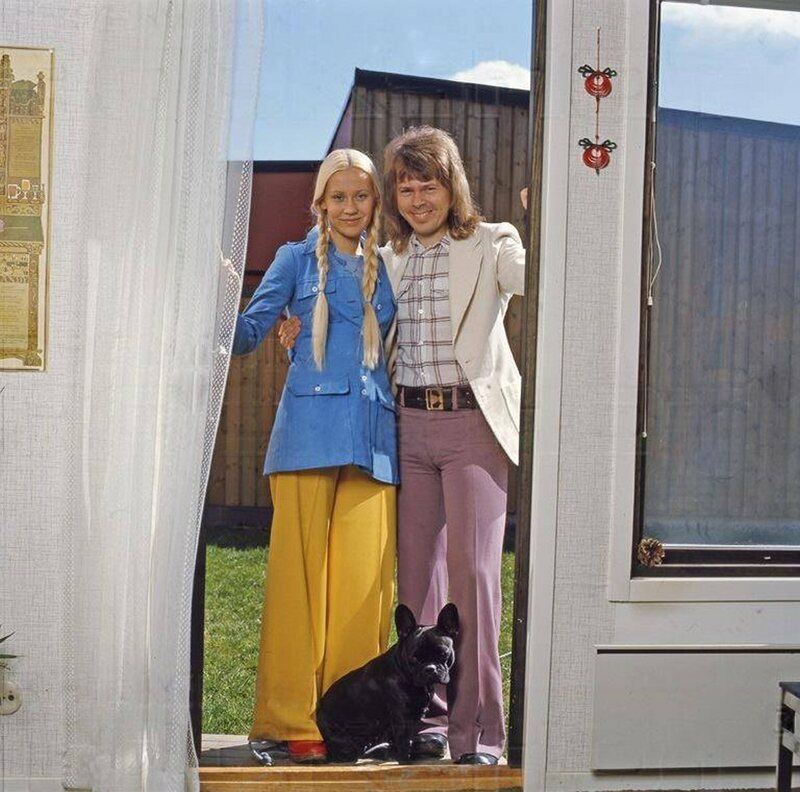 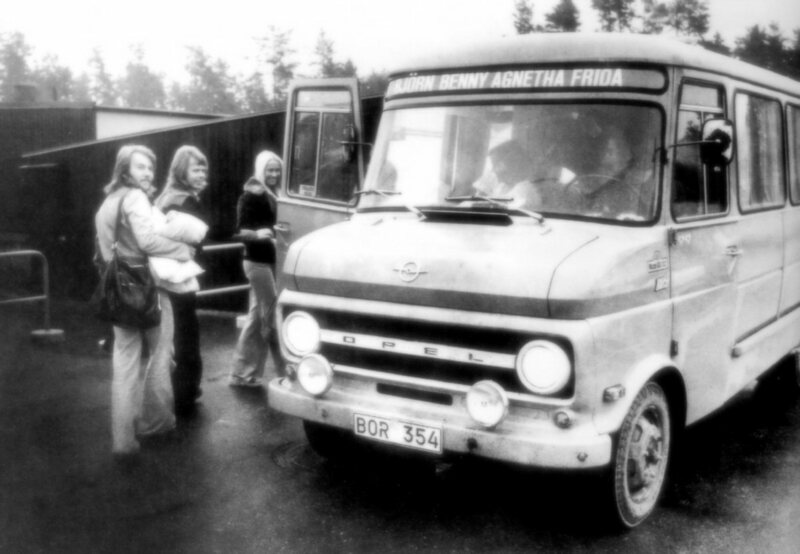 Their trip was arranged by the Swedish travel agency "Fritidsresor" and the same agency put the picture of Benny, Frida (and her daughter Lise-Lotte) and Agnetha on the cover of their catalogue for autumn, winter and spring 1970/71. 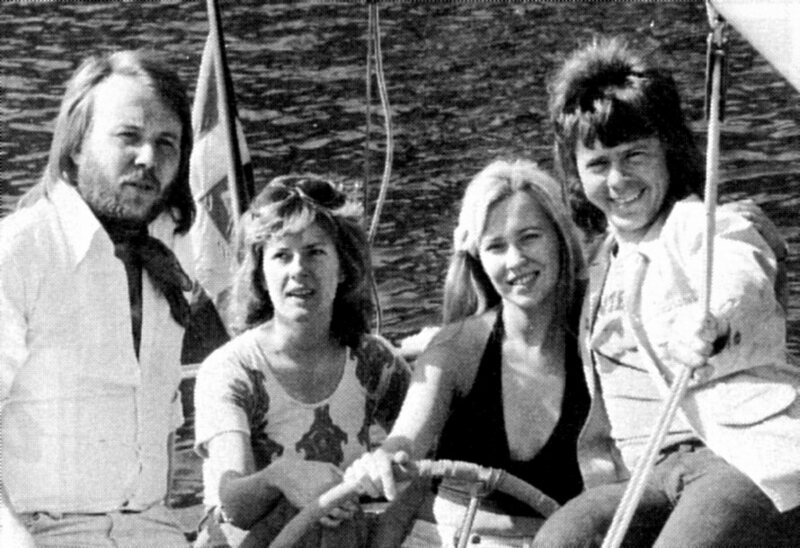 On September 14th, 1970 Agnetha, Frida, Björn and Benny posed together in Djurgården in Stockholm during the first professional photo session. 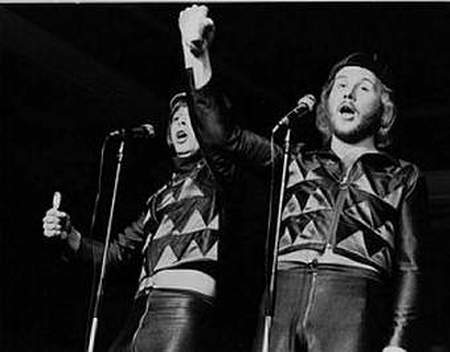 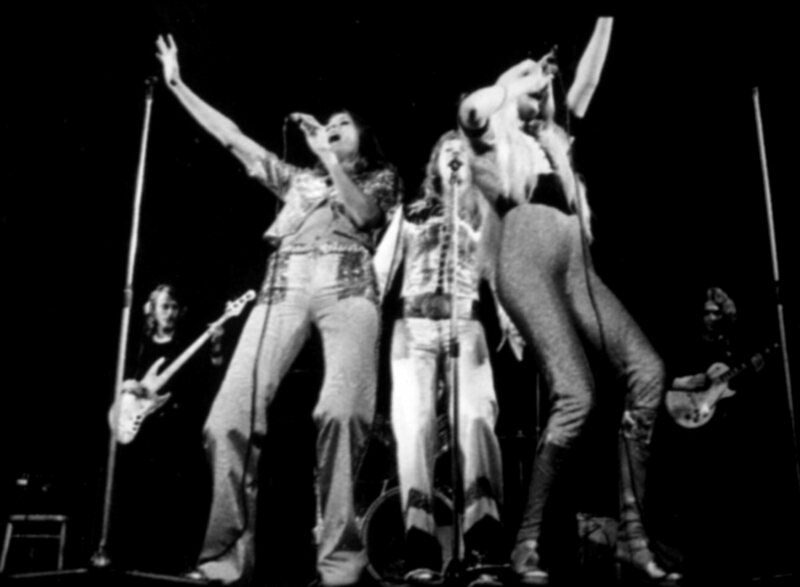 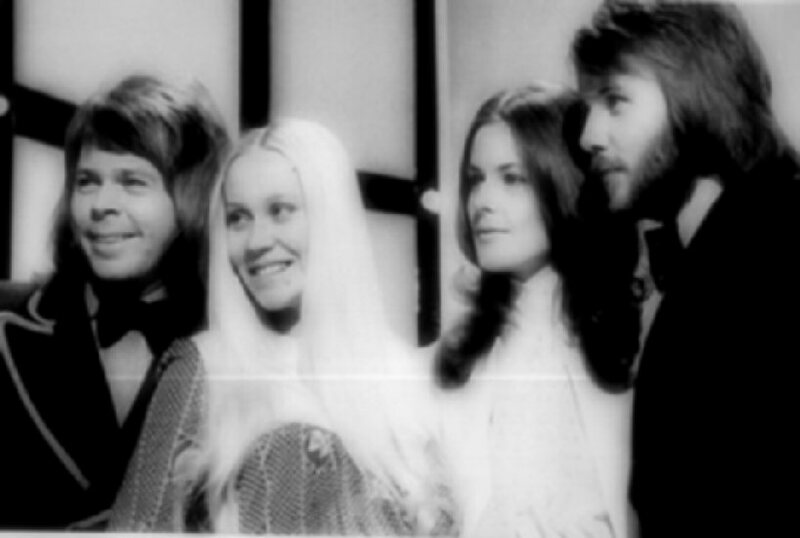 One of the shots would be used on the cover of the group's first single "People Need Love" in 1972. 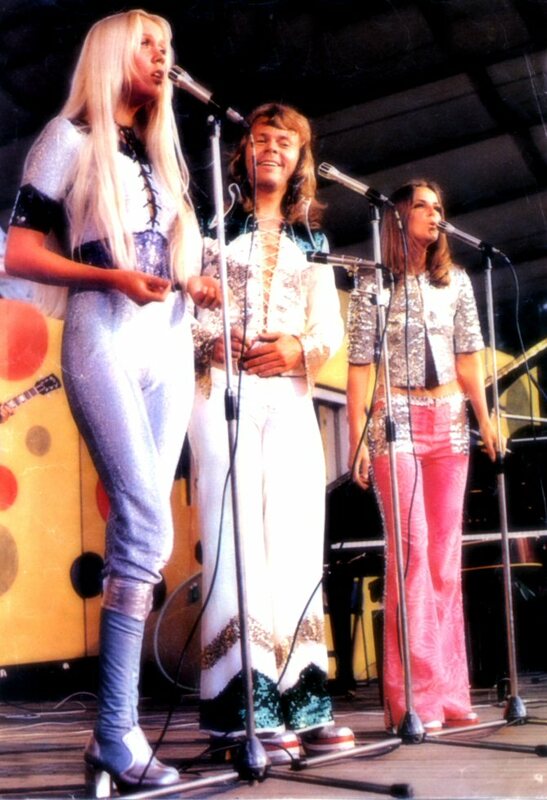 The show was nothing ABBA members want to remember today but of course it is a part of the ABBA history. 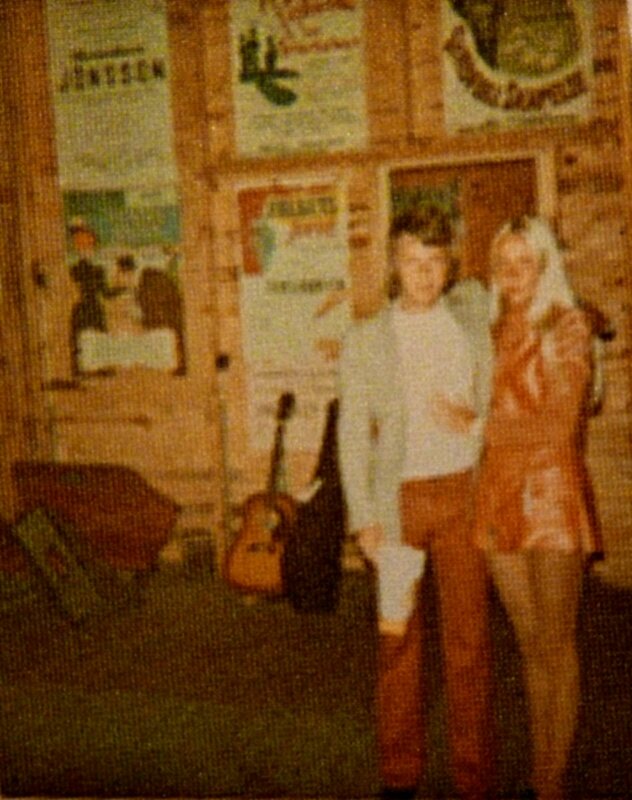 After several evenings at the restaurant "Trä'gårn" in Gothenburg the show moved to Stockholm where it was played until December 20th, 1970. 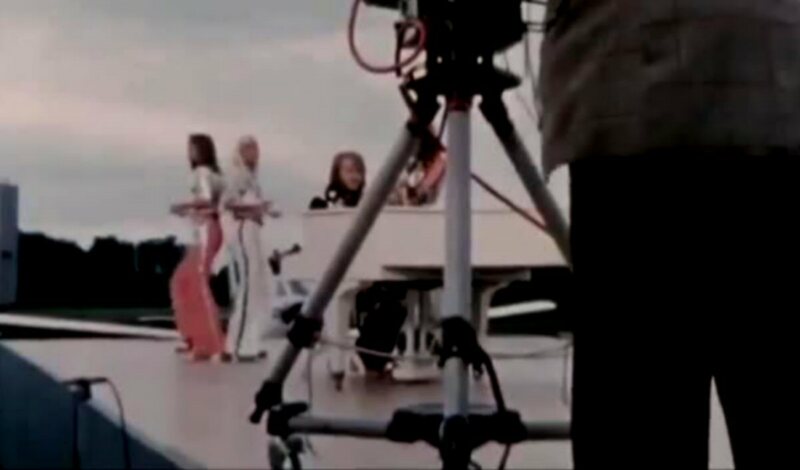 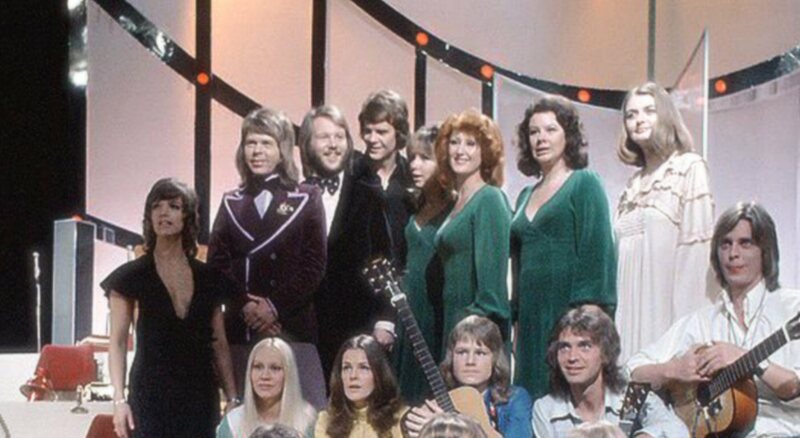 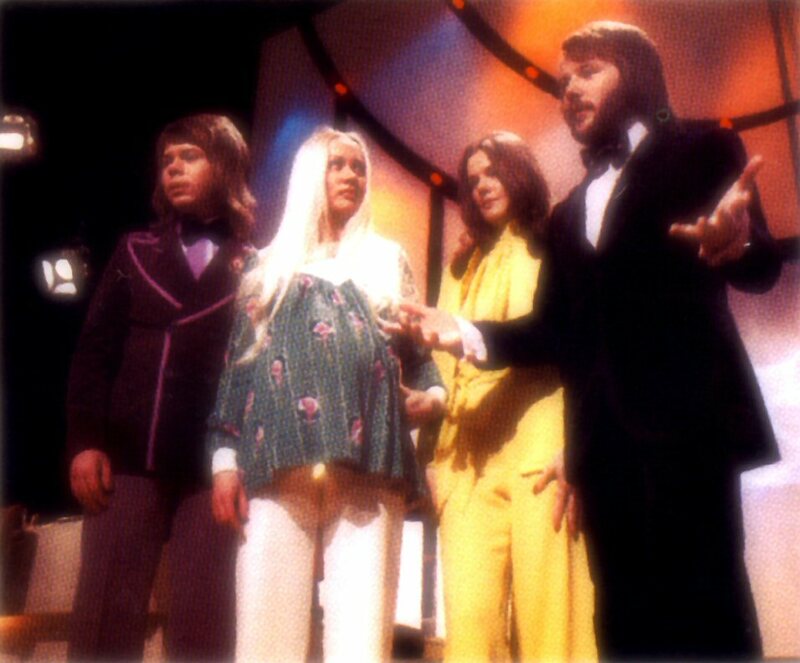 Probably the very first TV performance of the future ABBA was filmed for Swedish TV in Malmö in 1970. 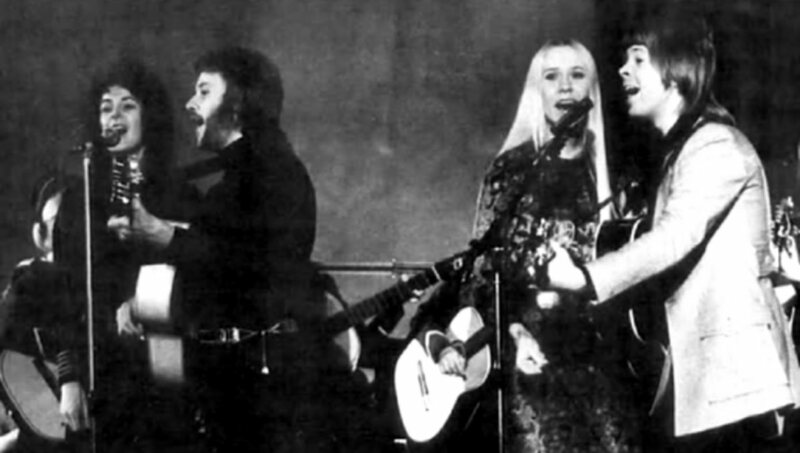 They performed "California Here I come". 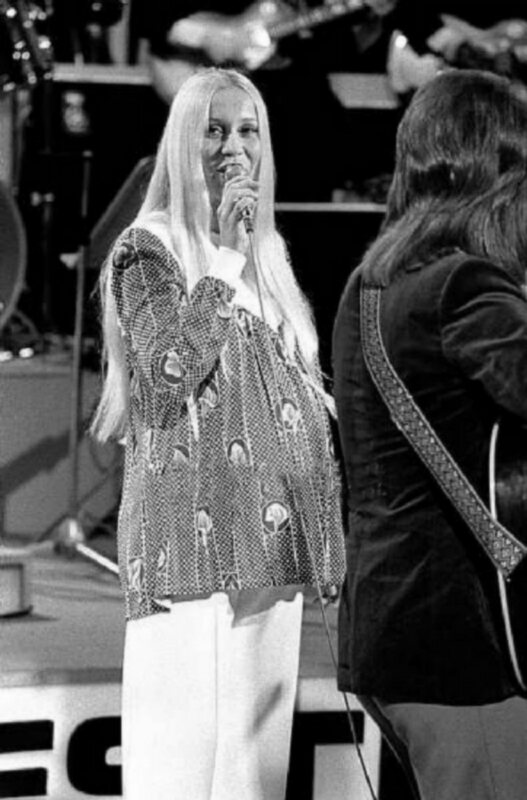 The show was brodcasted on December 13th, 1970. 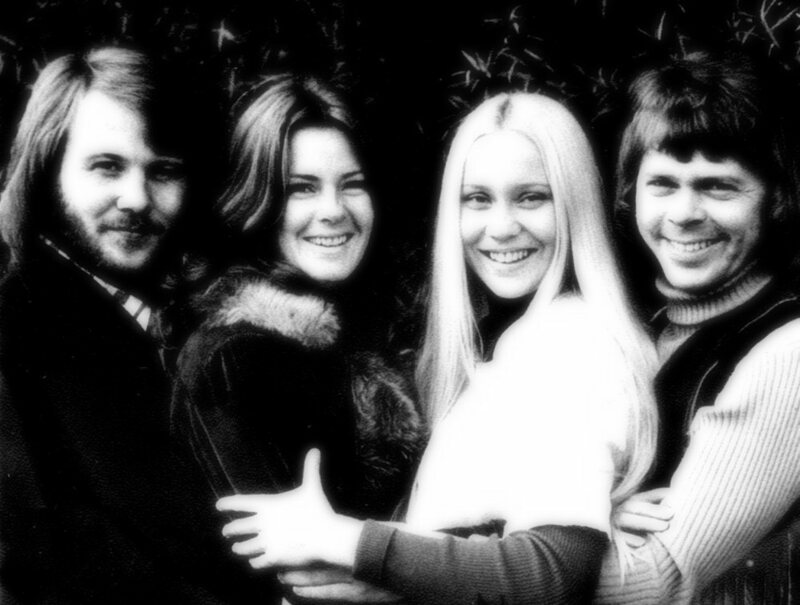 In January Björn, Benny, Frida and Agnetha performed on the Salvation Army's meeting in Gothenburg. 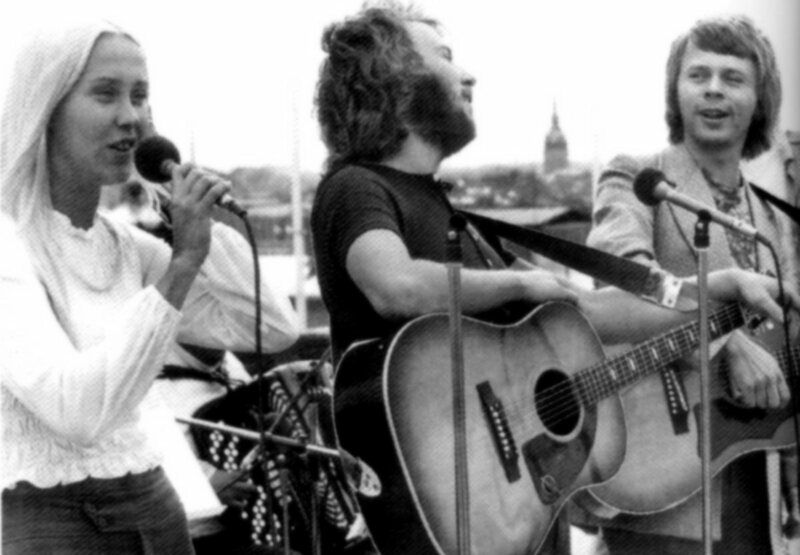 They sang "Hej gamle man" the song which was about a soldier from the Salvation Army in Västervik. 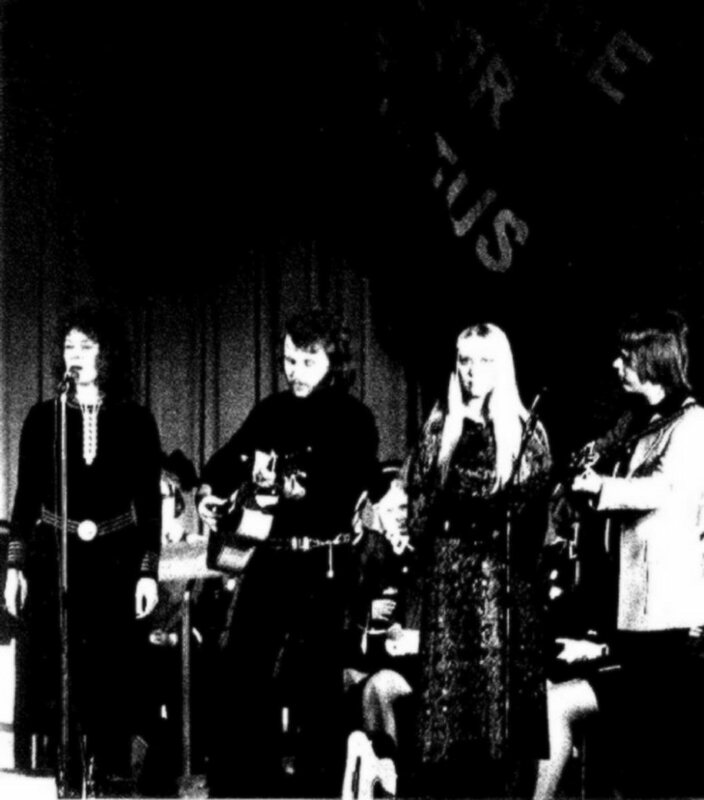 The foursome performed even some other songs among them a folk song "Vem kan segla förutan vind". 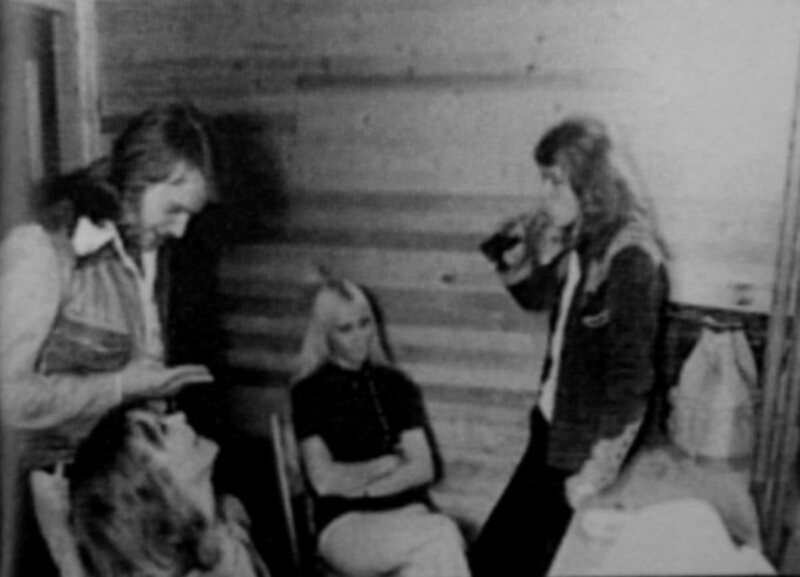 The meeting took place at the Gothenburg Concert House. 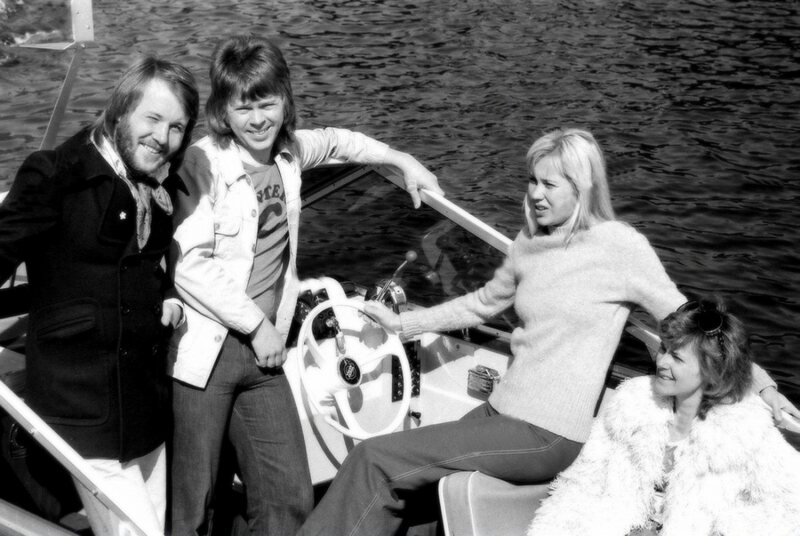 At the end of April Björn, Benny and Agnetha started their bizarre tour in Sweden. 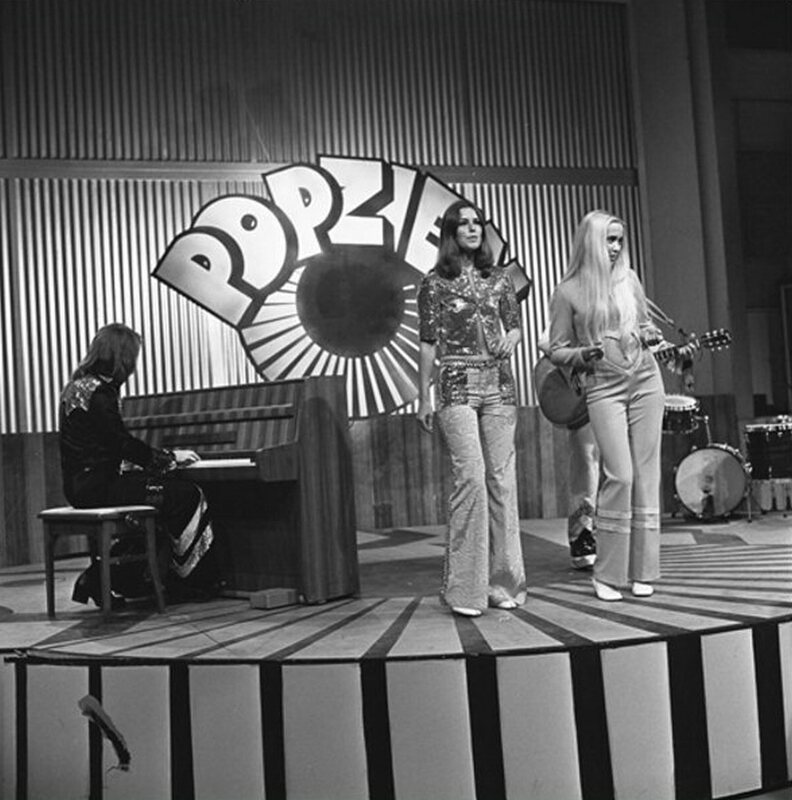 They performed several covers during a 30-minutes-show. 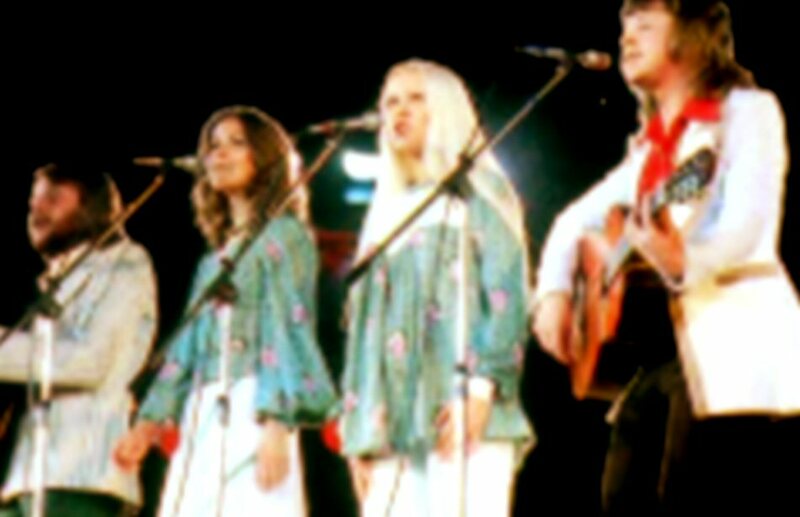 In June they performed in front of TV cameras in Skansen in Stockholm. 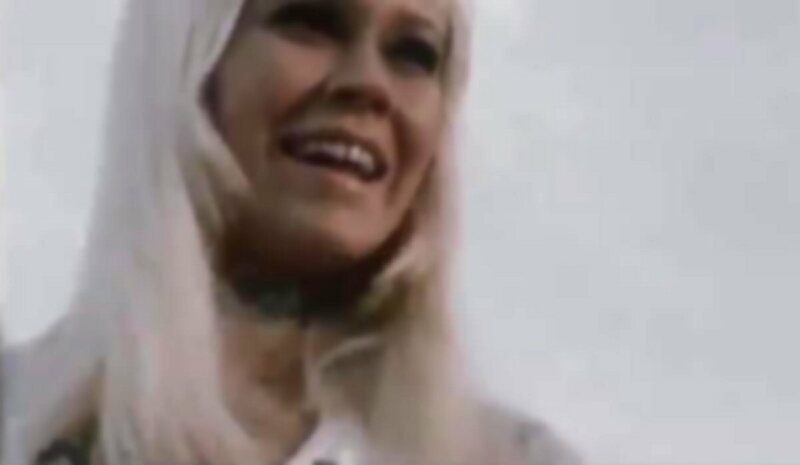 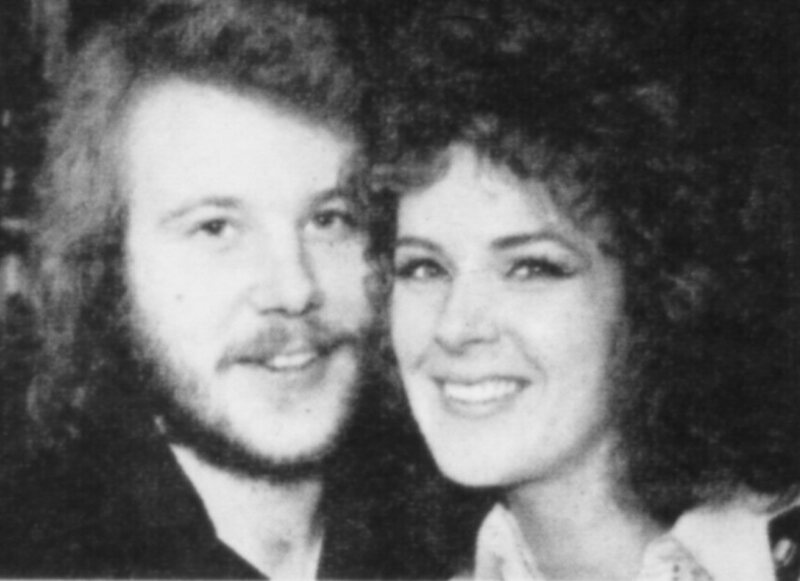 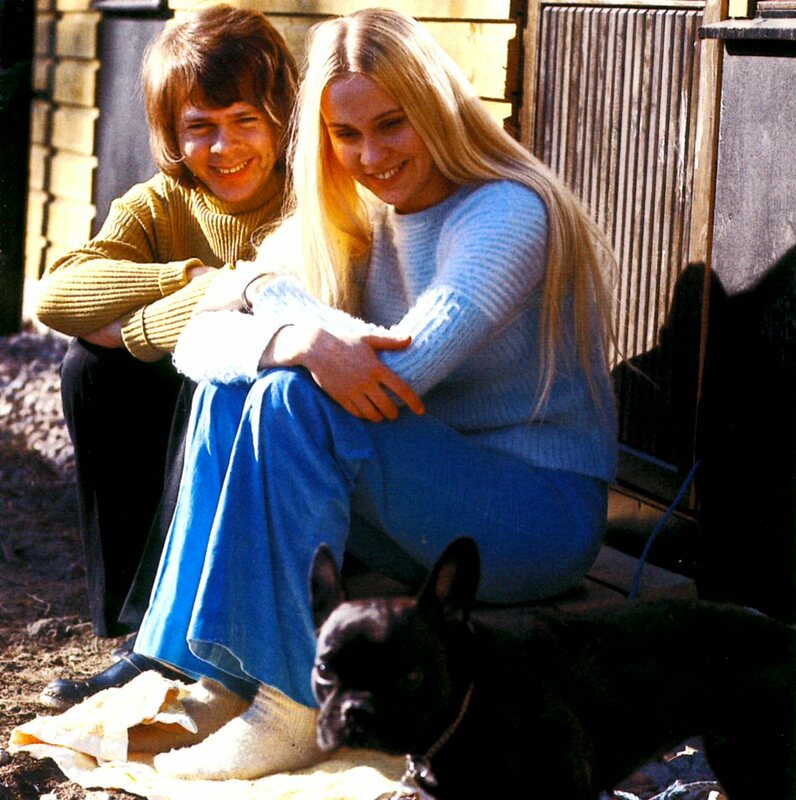 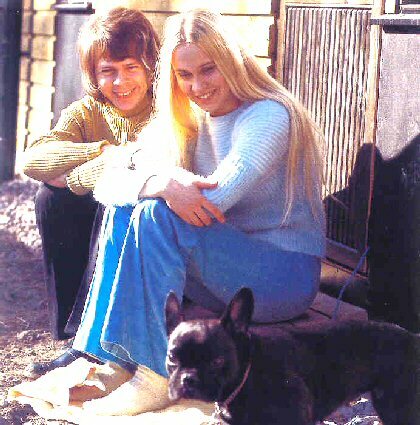 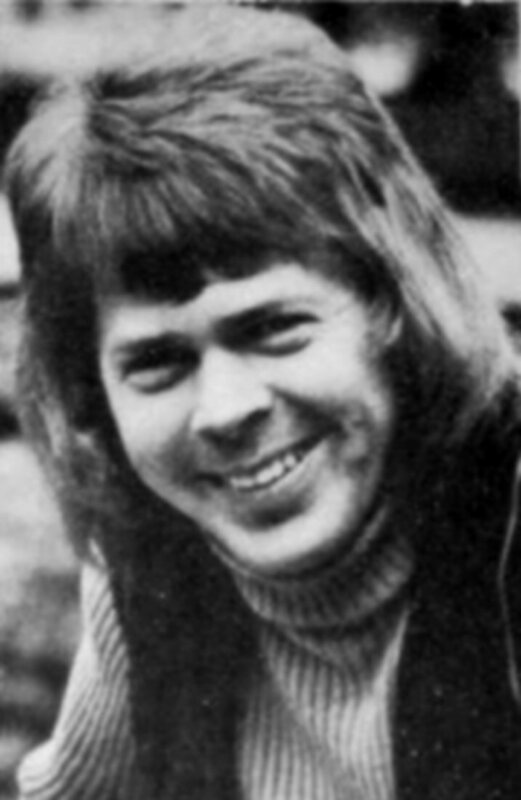 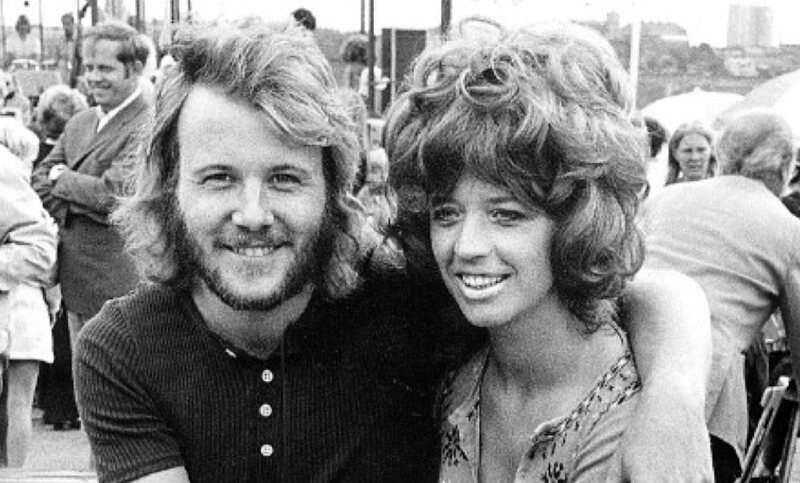 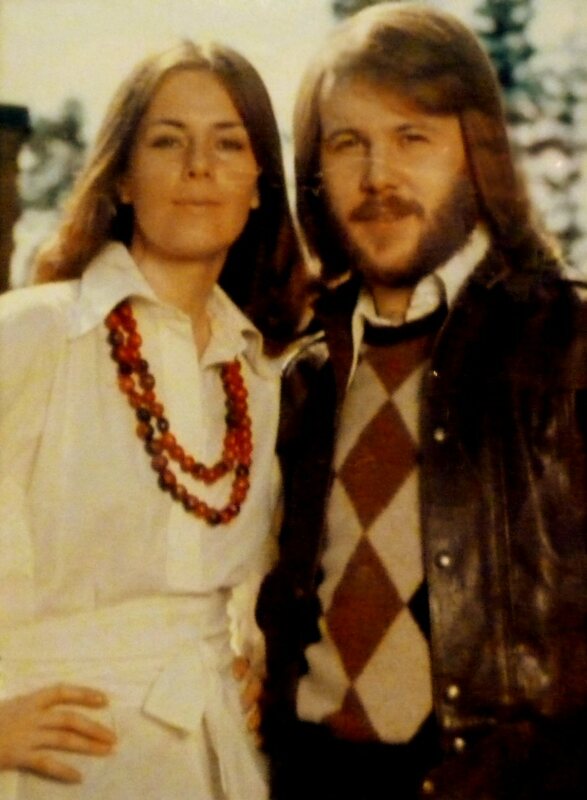 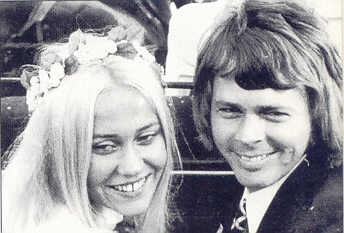 On July 6, 1971 Björn married Agnetha in the Verum church in Skåne in southern Sweden. 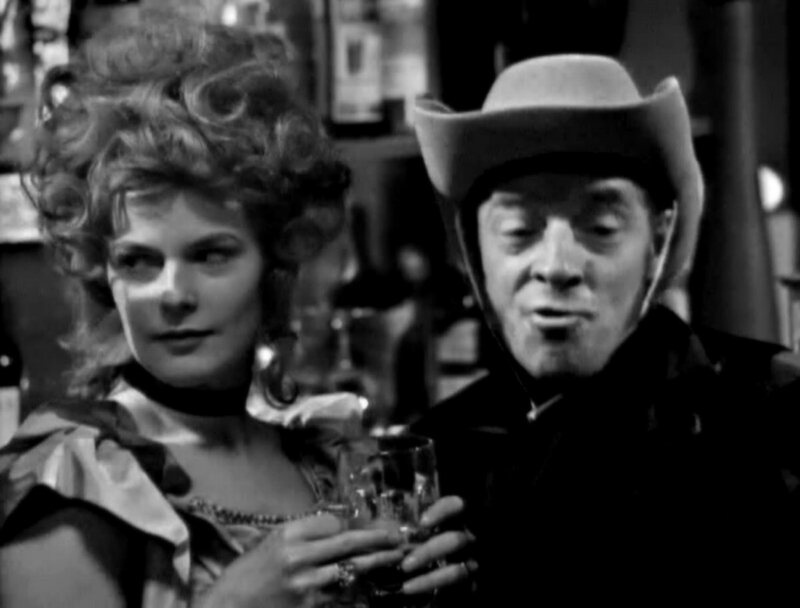 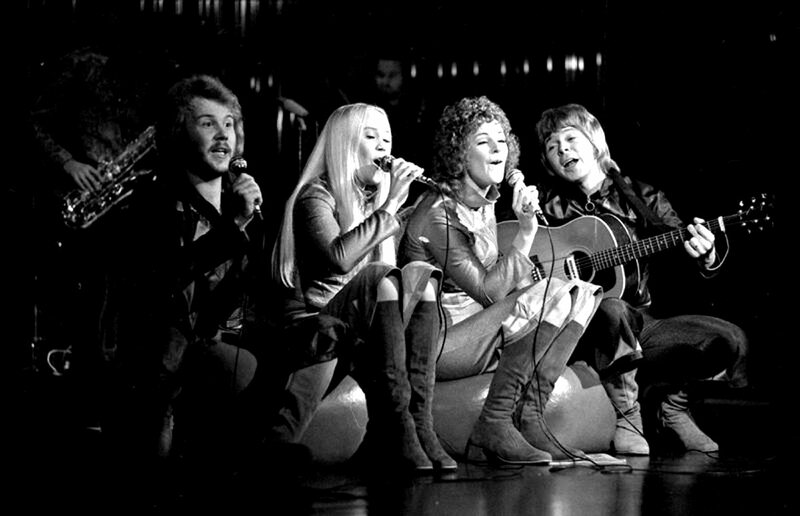 Anni-Frid worked together with other well-known Swedish artists in a show at the theatre Folkan in Stockholm. 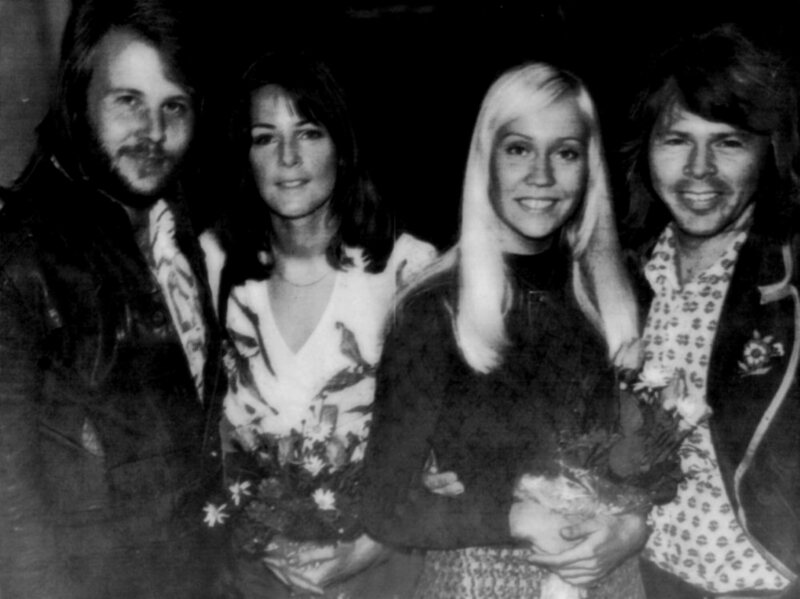 Agnetha finished recording of her new solo album together with Frida, Björn and Benny who sang backing vocals. 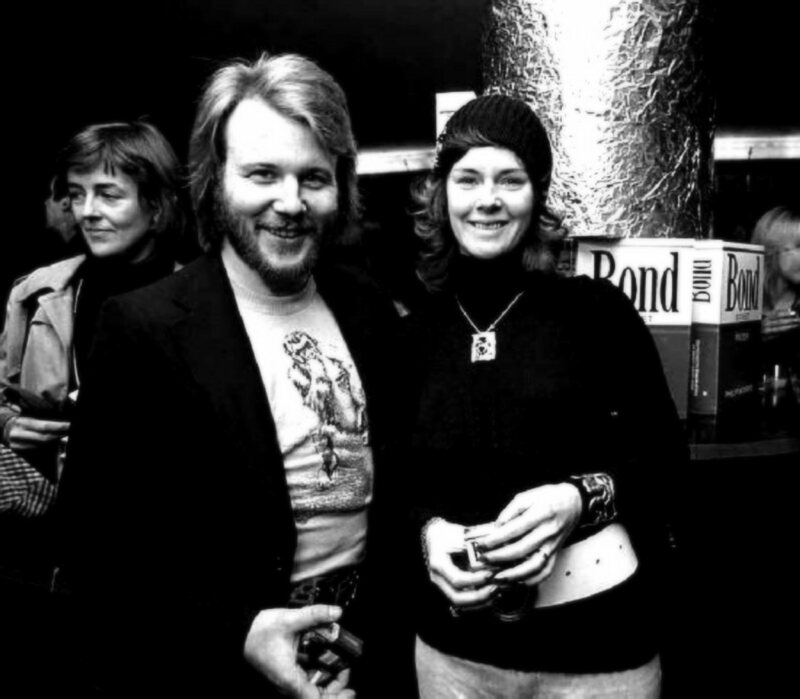 On December 20th, 1971 Frida and Benny attended the Swedish premiere of the new James Bond film "Diamonds are Forever". 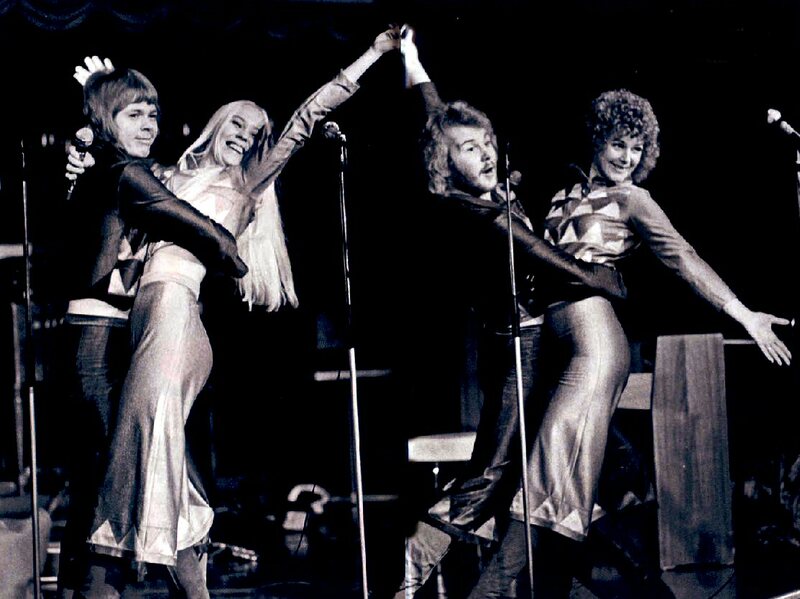 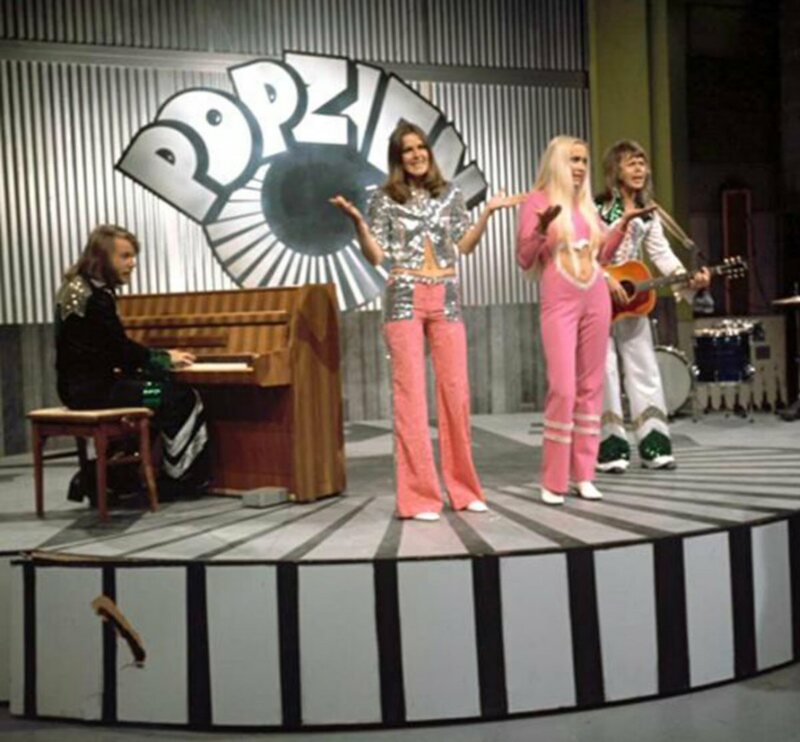 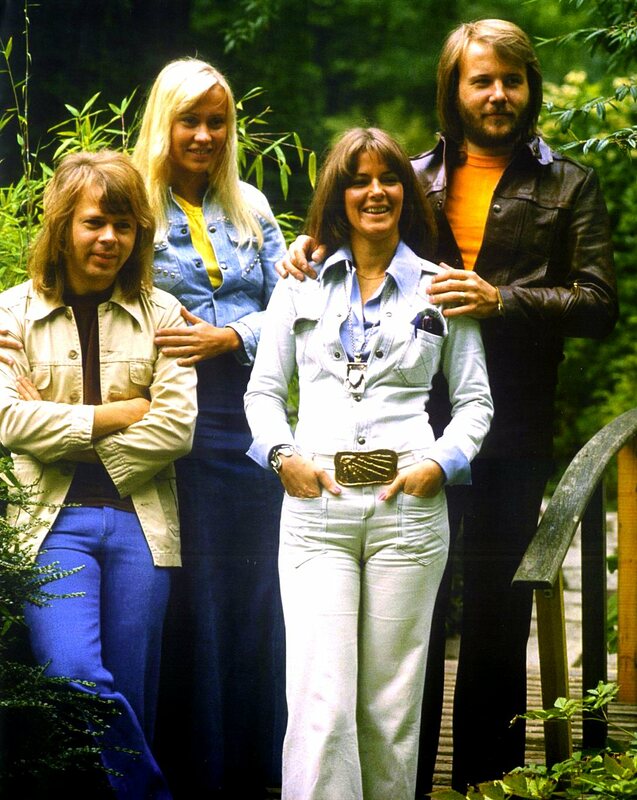 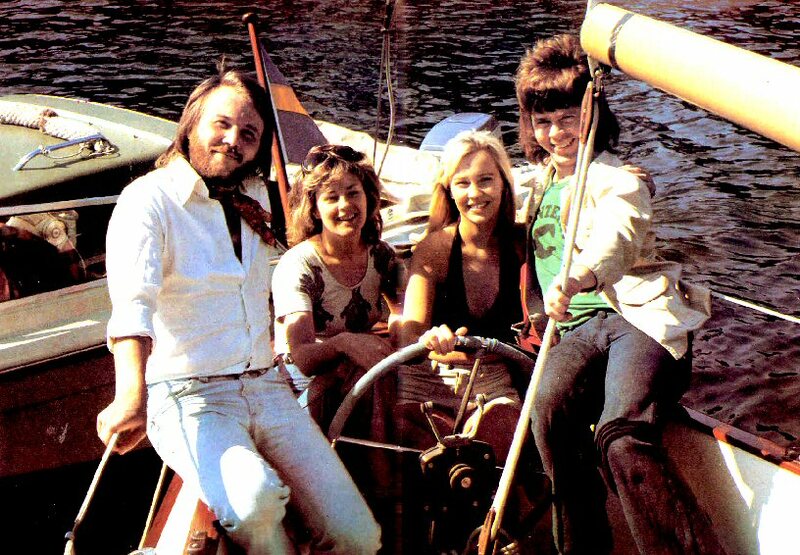 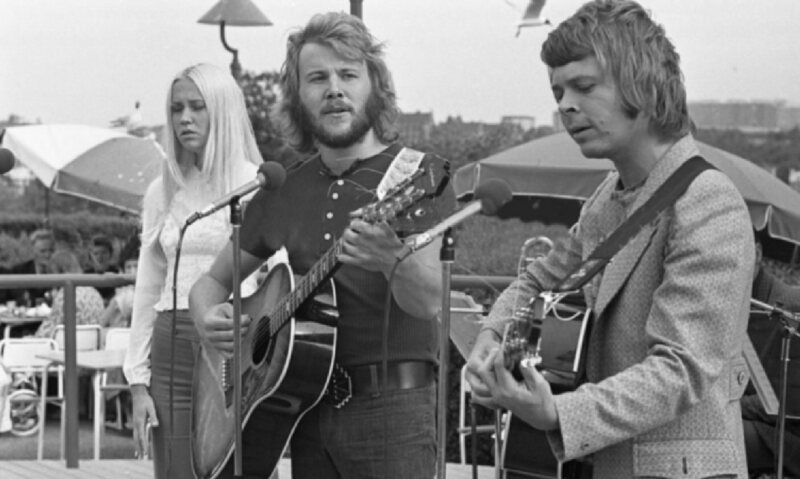 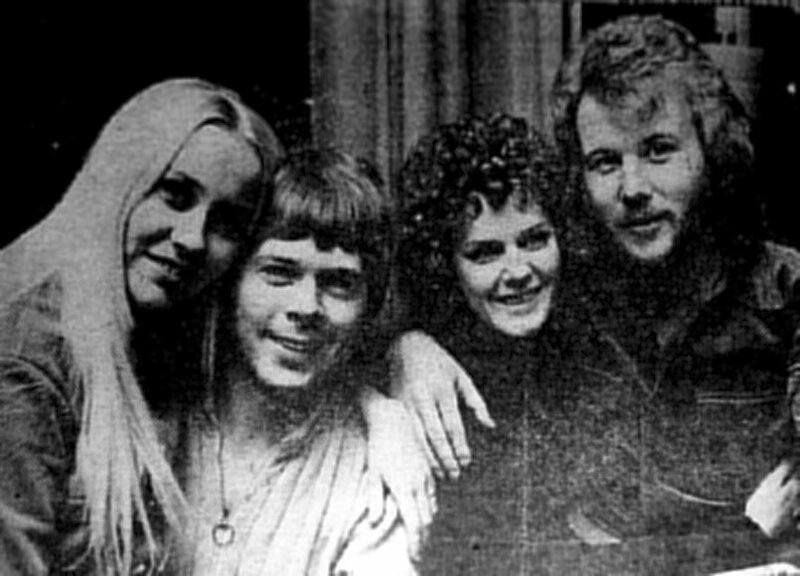 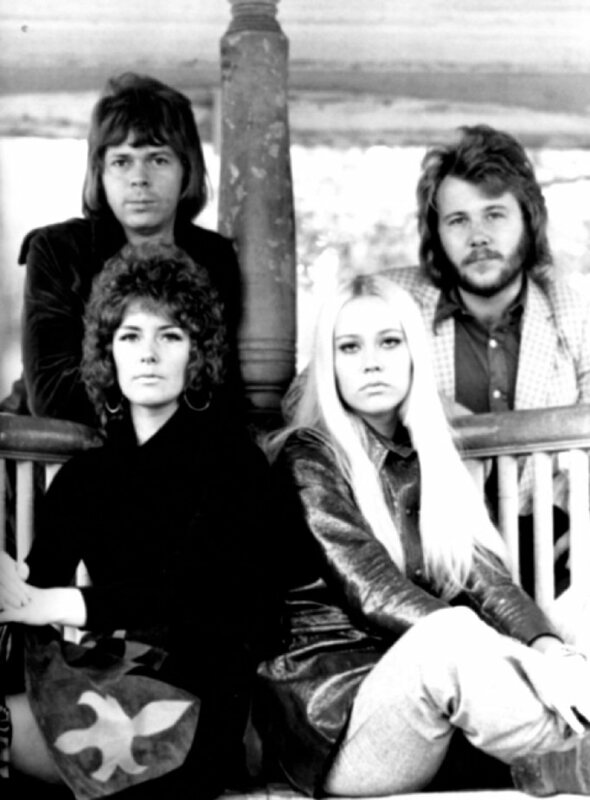 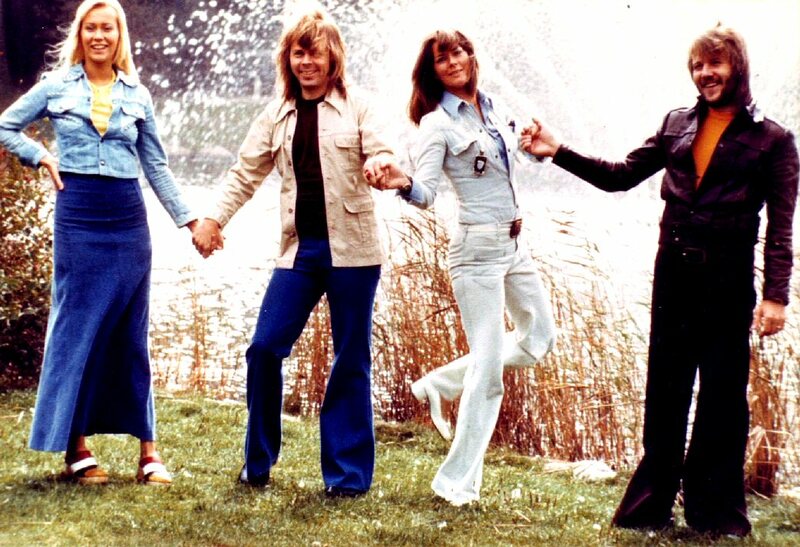 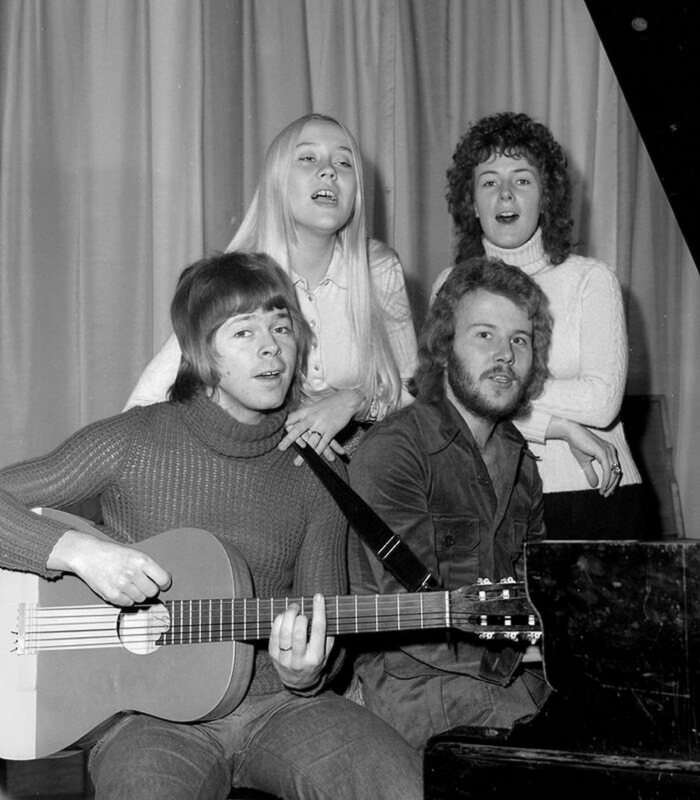 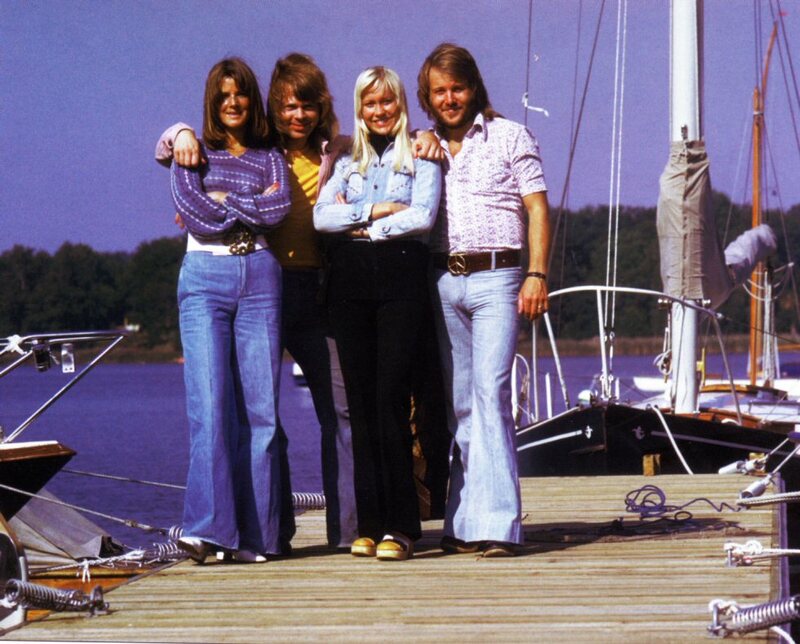 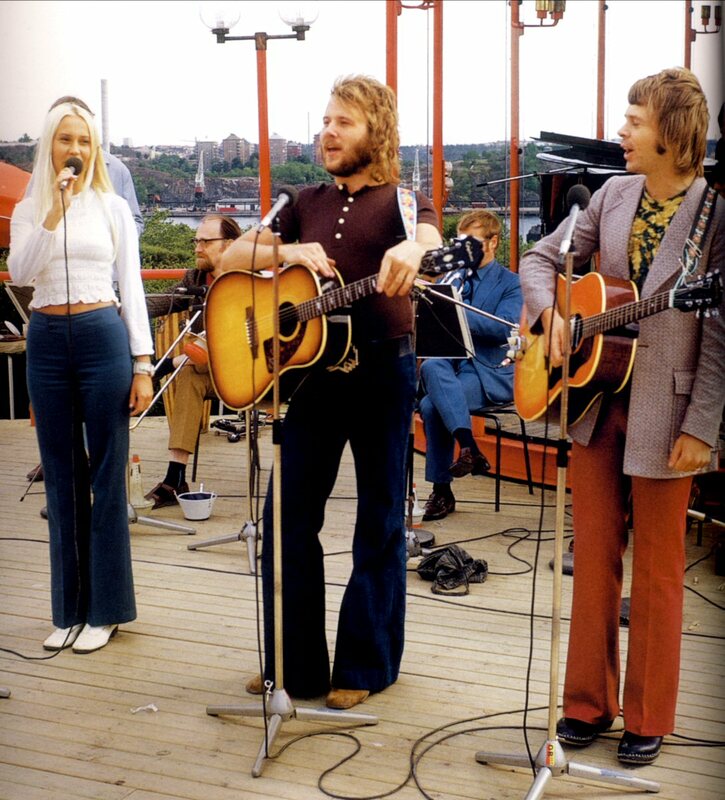 Björn, Benny, Agnetha and Anni-Frid appeared on Swedish TV in the youth programme "Vi i femman". 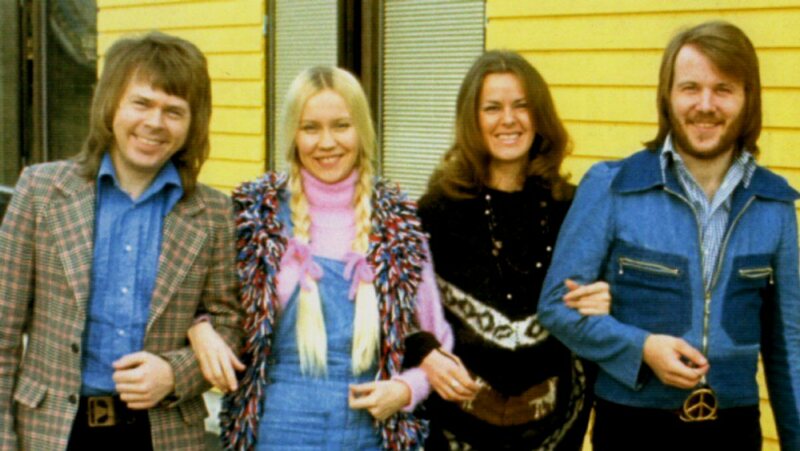 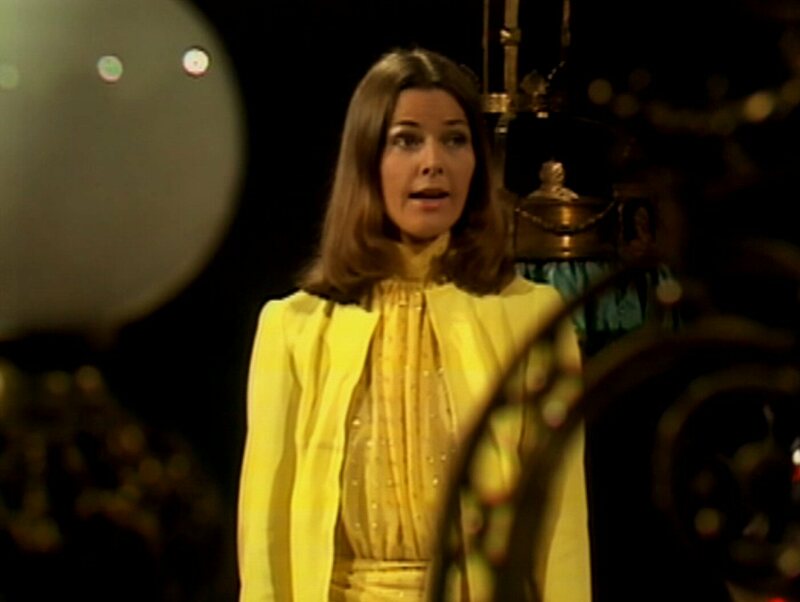 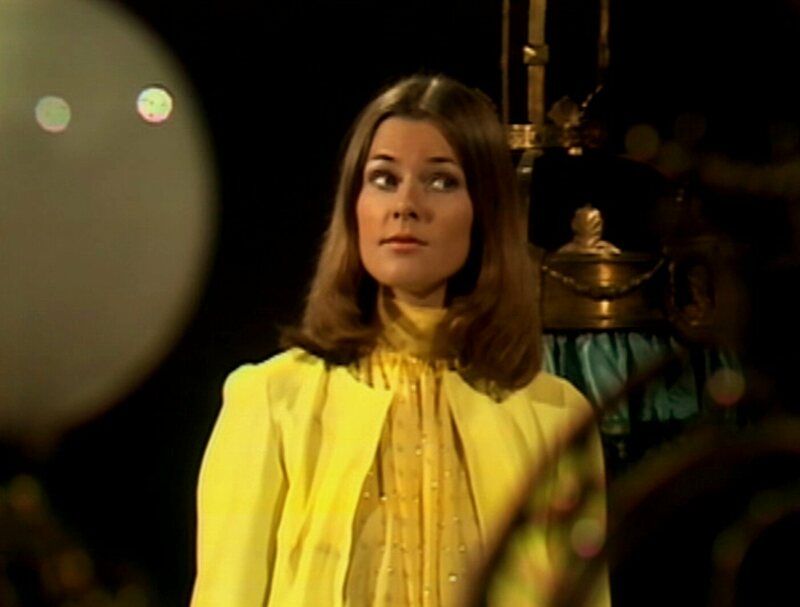 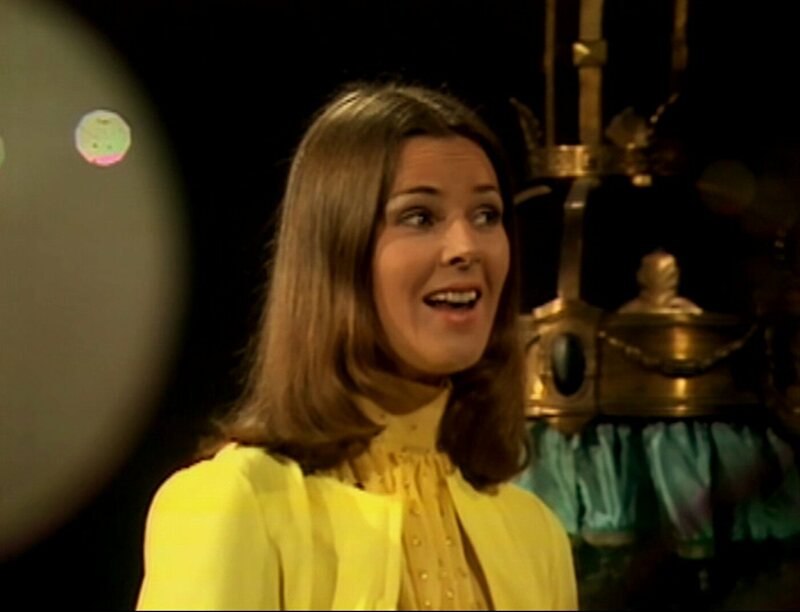 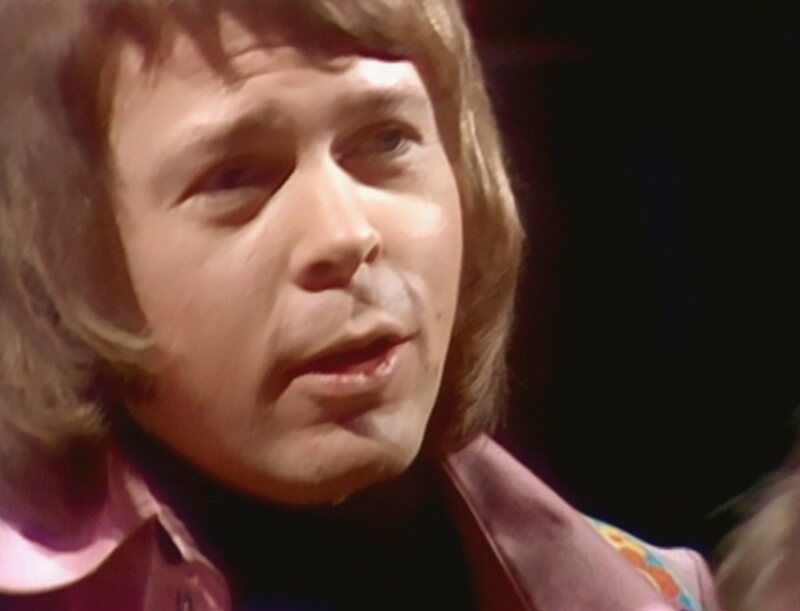 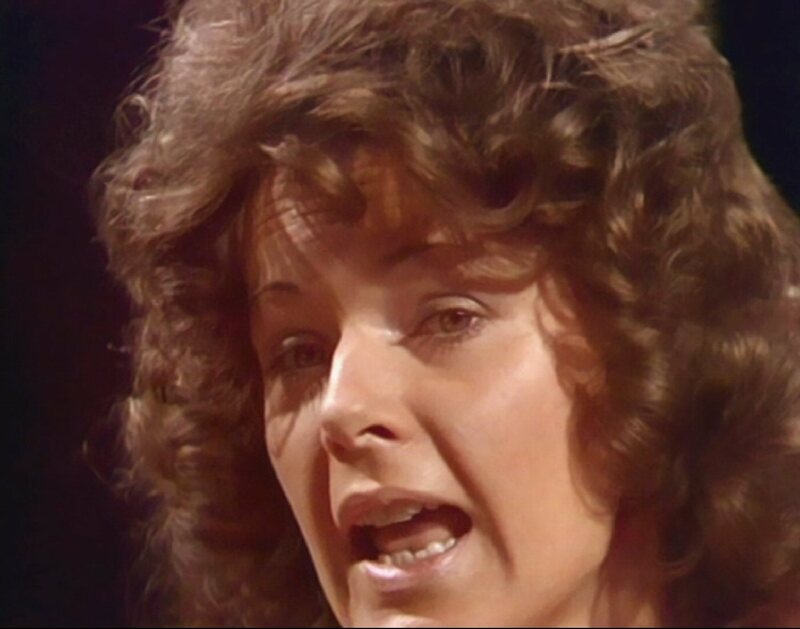 It was one of their very first appearances on Swedish TV on 30 April 1972. 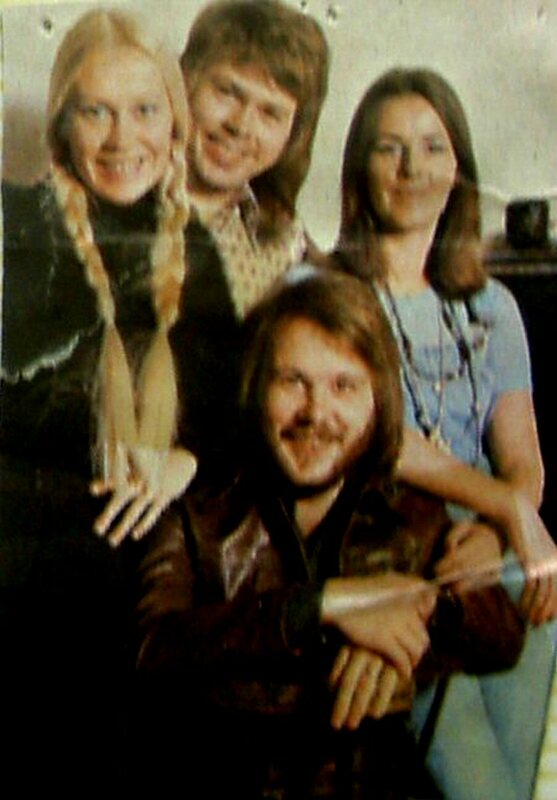 In March 1972 the foursome were in the studio together again recording a new song called "People Need Love". 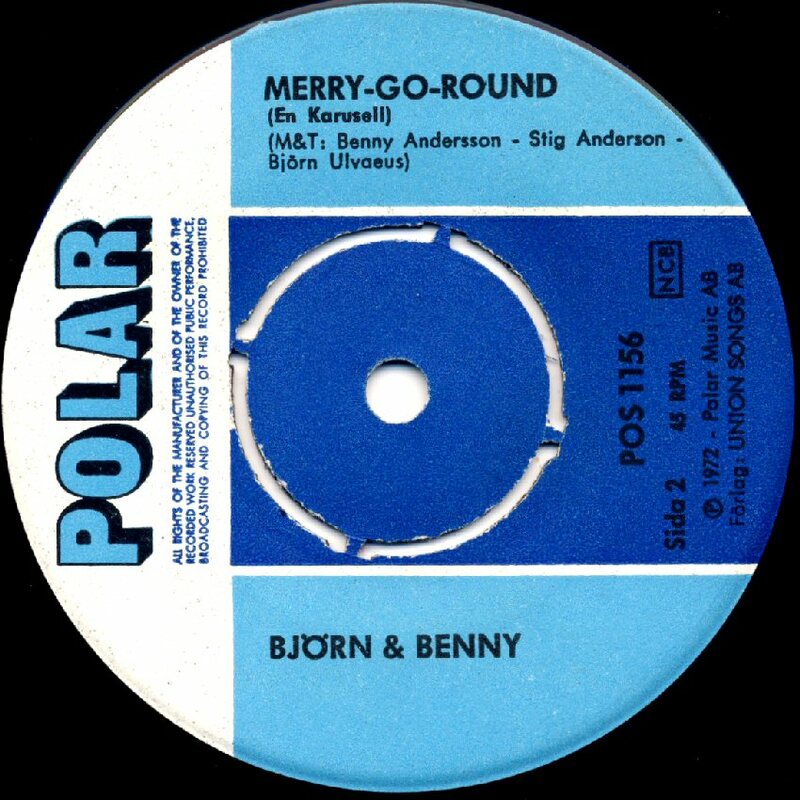 The single was released in Sweden in June 1972 with "Merry-Go-Round" on the B-side. 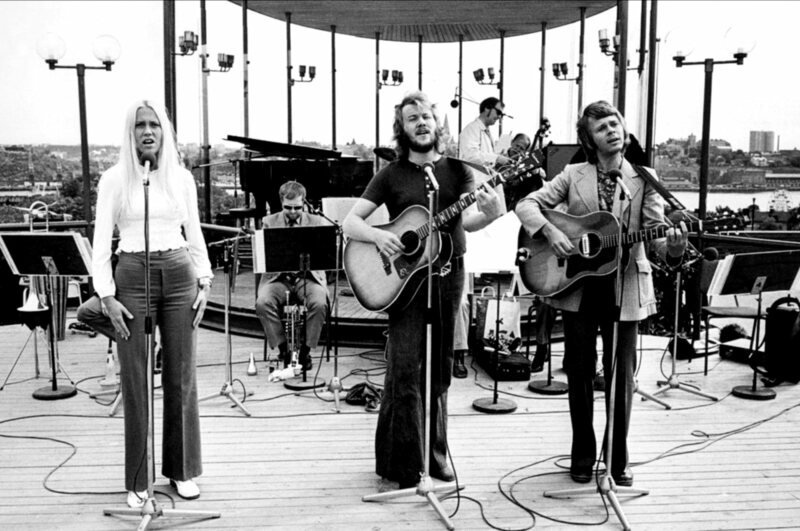 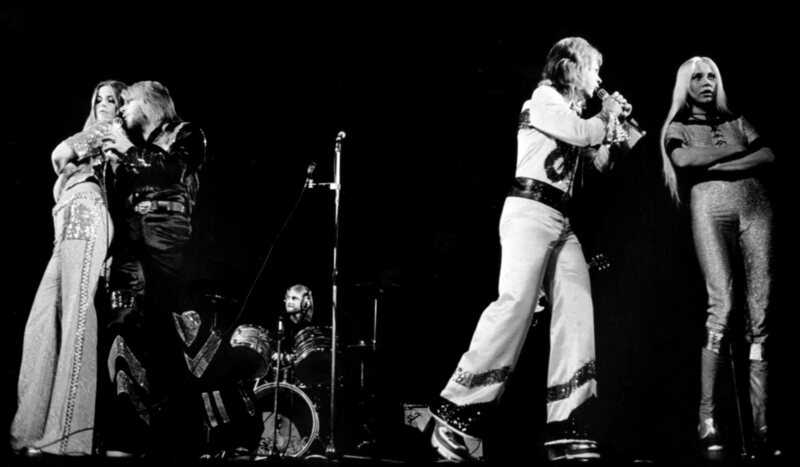 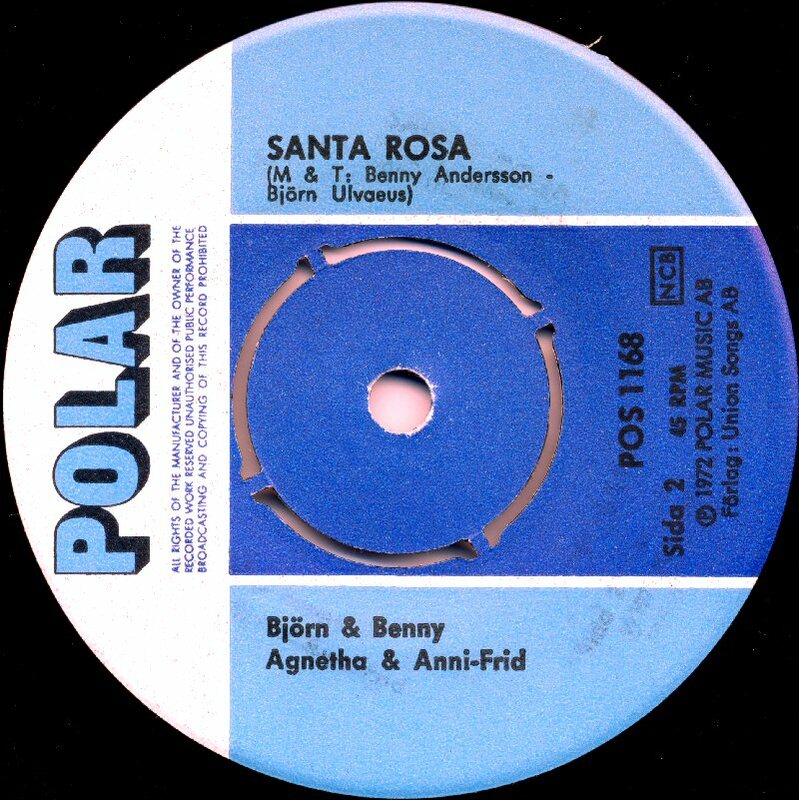 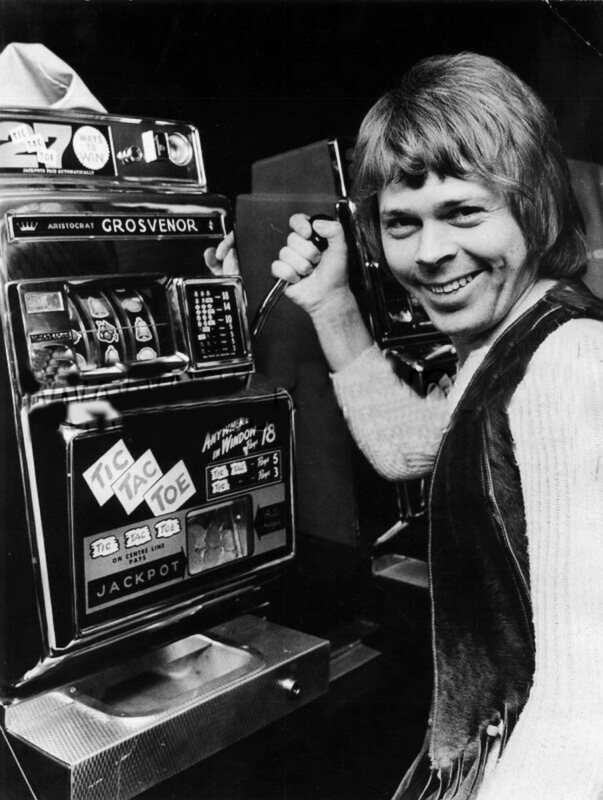 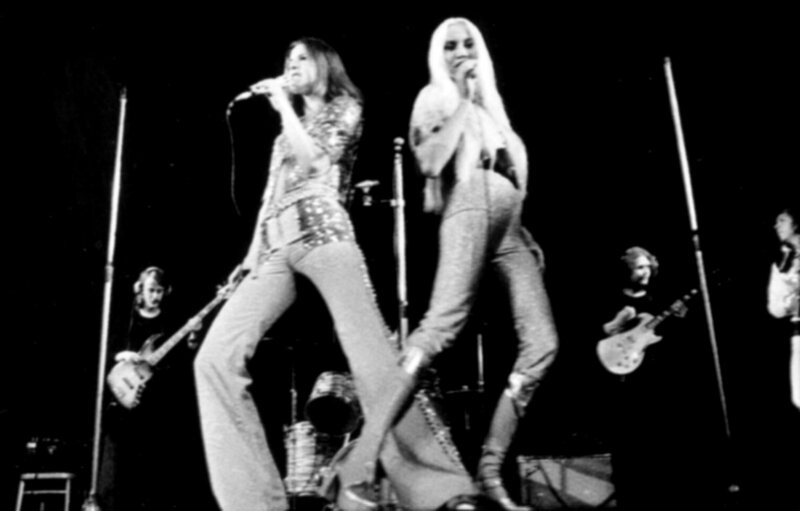 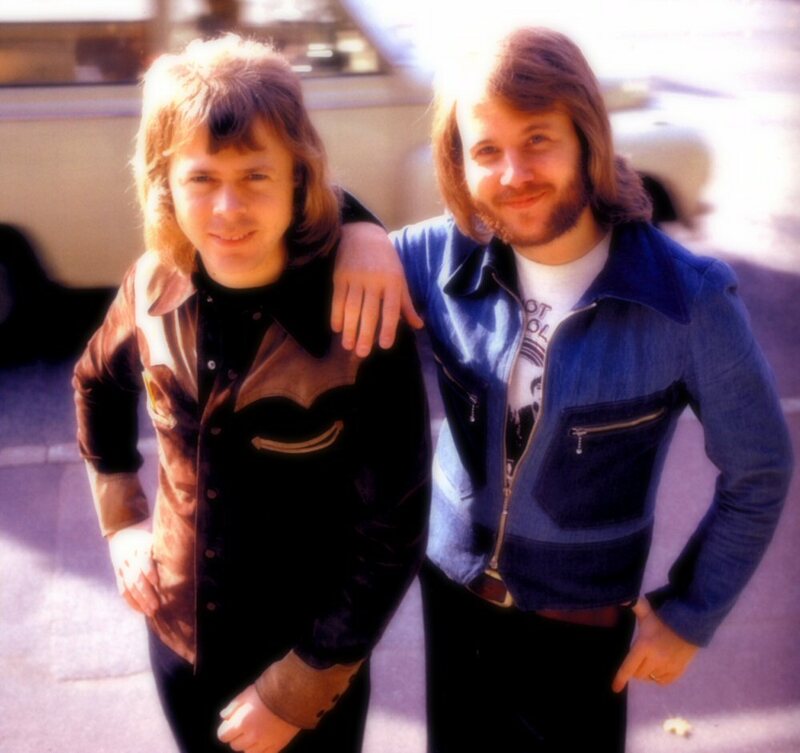 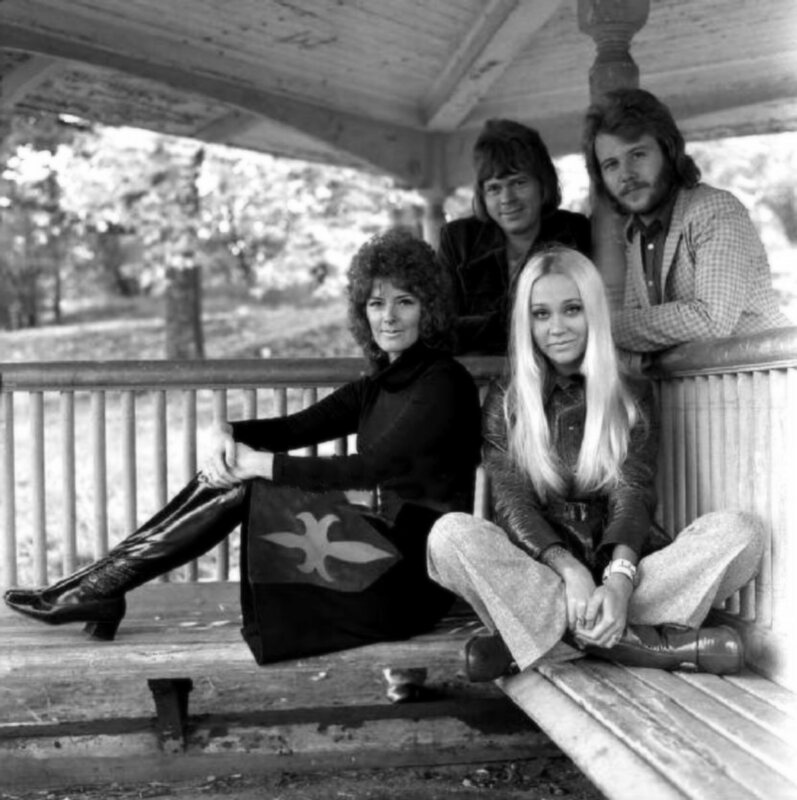 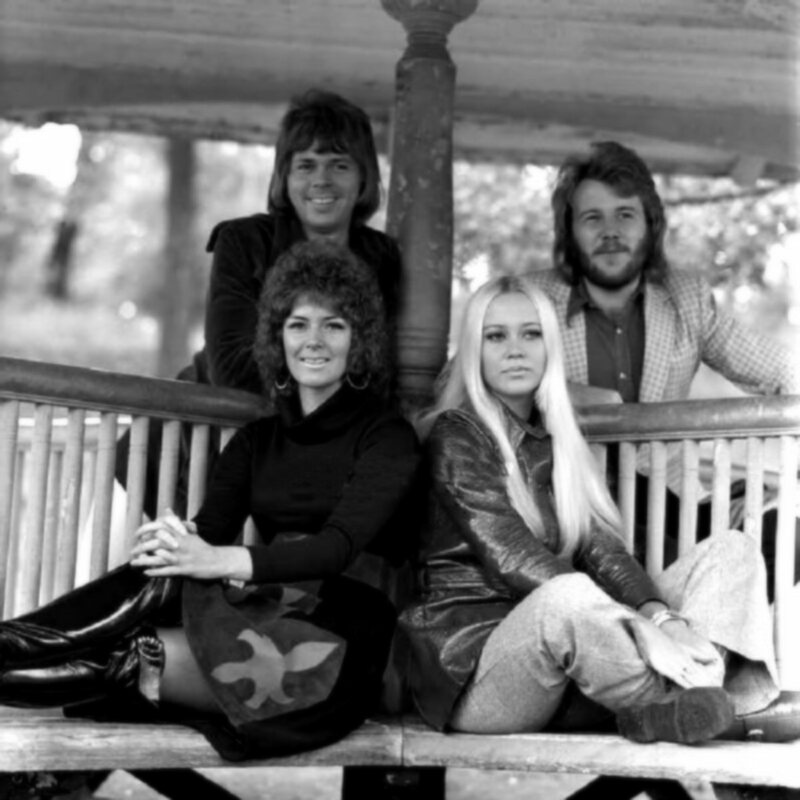 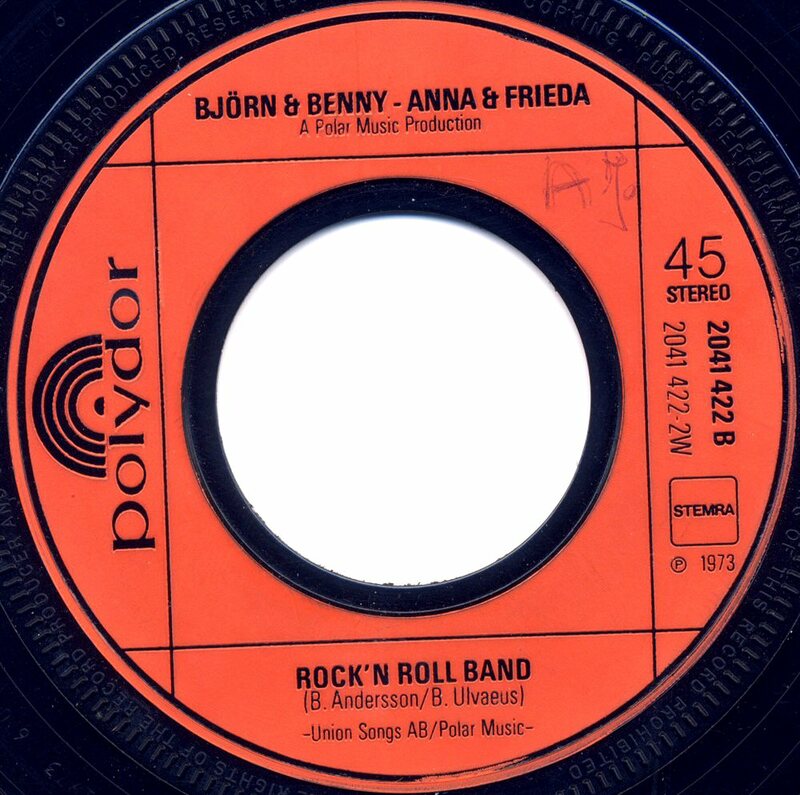 The group was called Björn & Benny, Agnetha & Anni-Frid on the single cover and on the label on the A-side while the B-side with "Merry-Go-Round" was credited only to Björn and Benny. 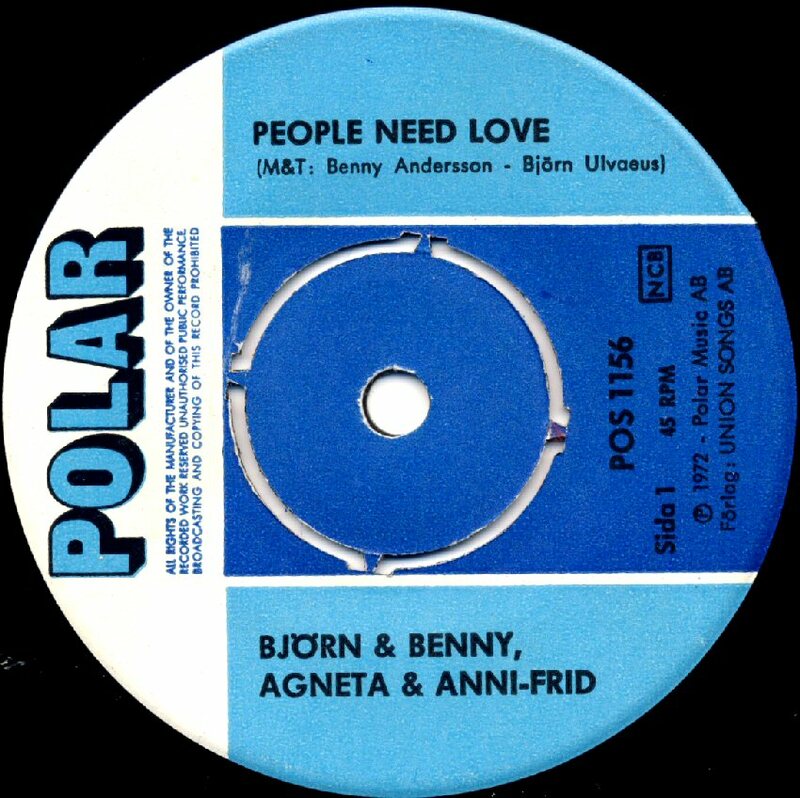 "People Need Love" reached #3 on the "Tio i topp" chart in Sweden and #17 on the "Topplistan" chart in July 1972. 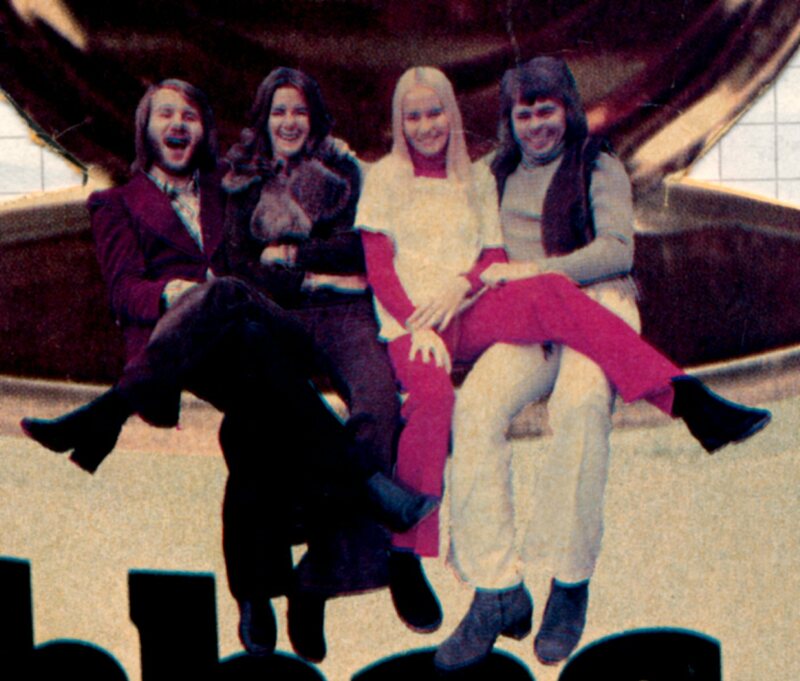 Promo sessions for this cover were taken on the Djurgården island in Stockholm on September 14, 1970 - check ABBA related places. 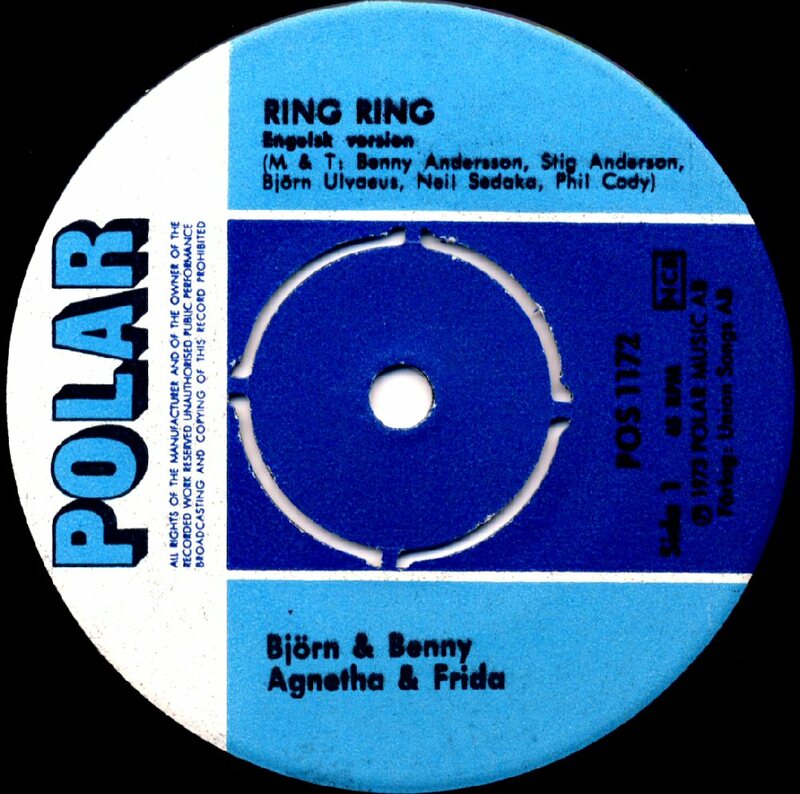 In September Frida recorded two songs for the forthcoming Christmas album with all artists working at Polar Music. 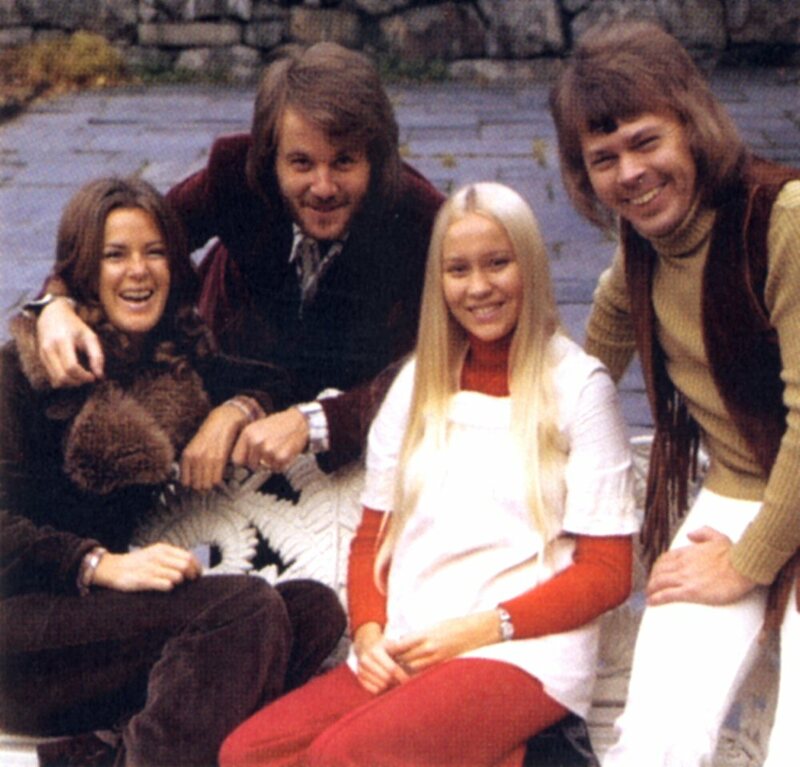 Björn and Hootenanny Singers, Lena Andersson and Arne Lambert were some of the other artists on the album. 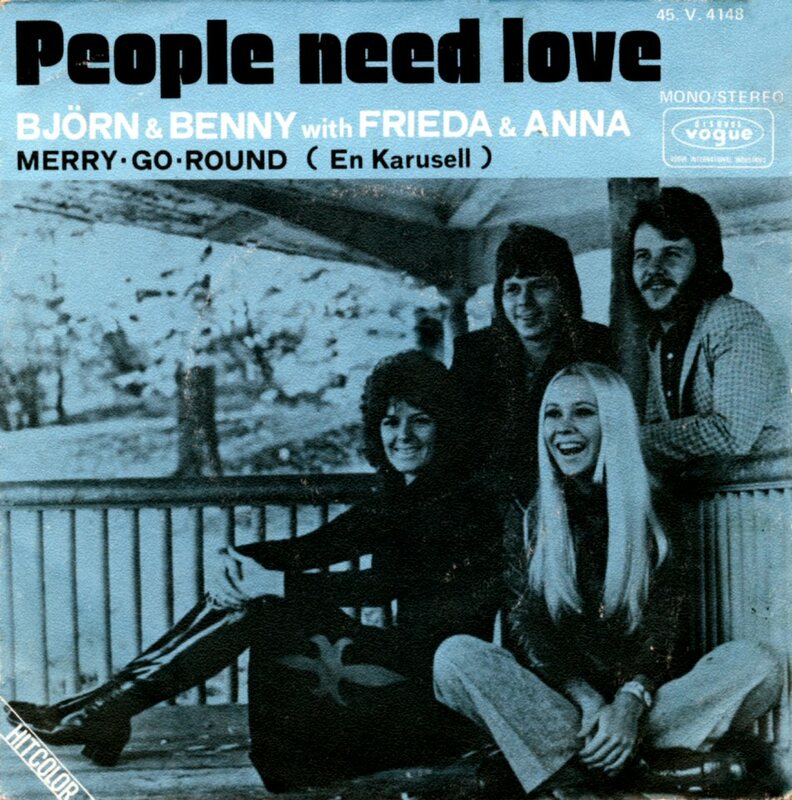 The single "People Need Love"/"Merry-Go-Round" was released in France and Belgium on 10 October 1972. 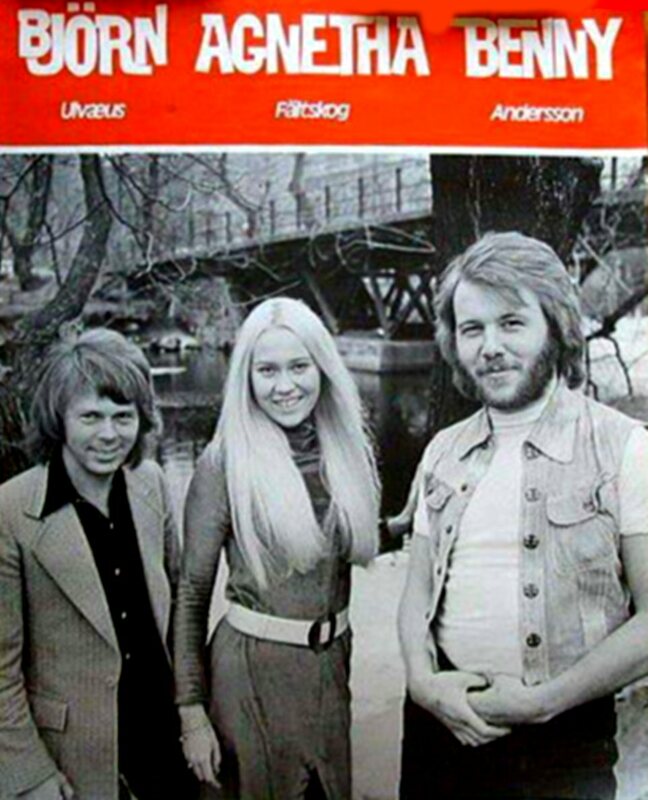 Stikkan Anderson signed contract with the publishing company Baboo for a future collaboration. 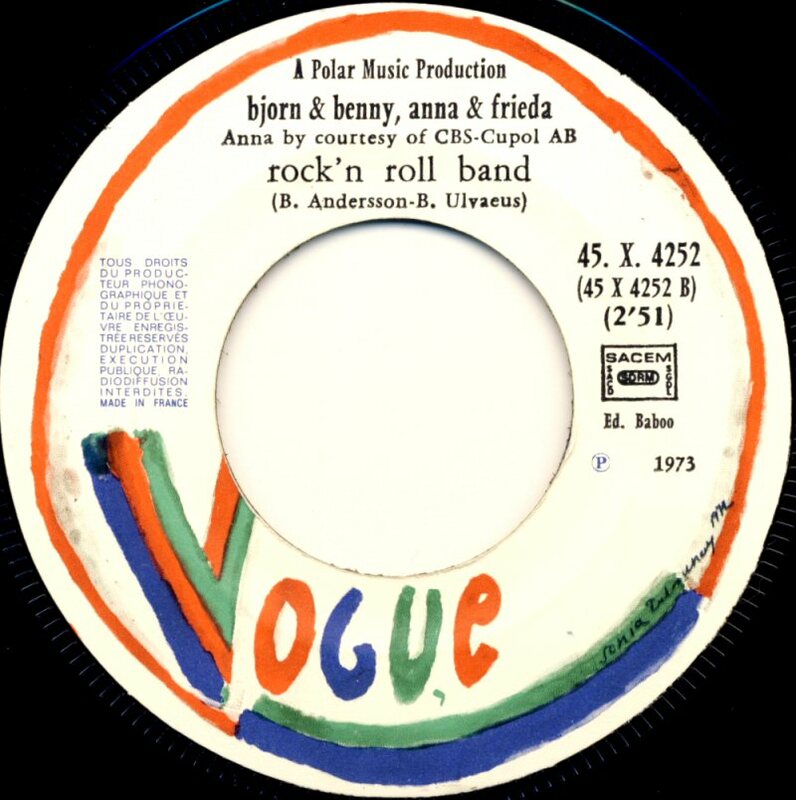 The single was distributed by Vogue in France. 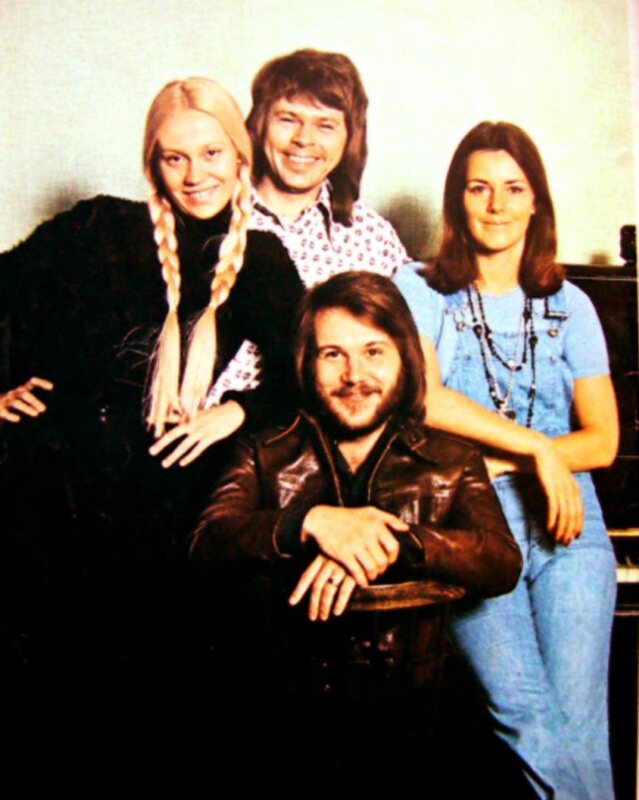 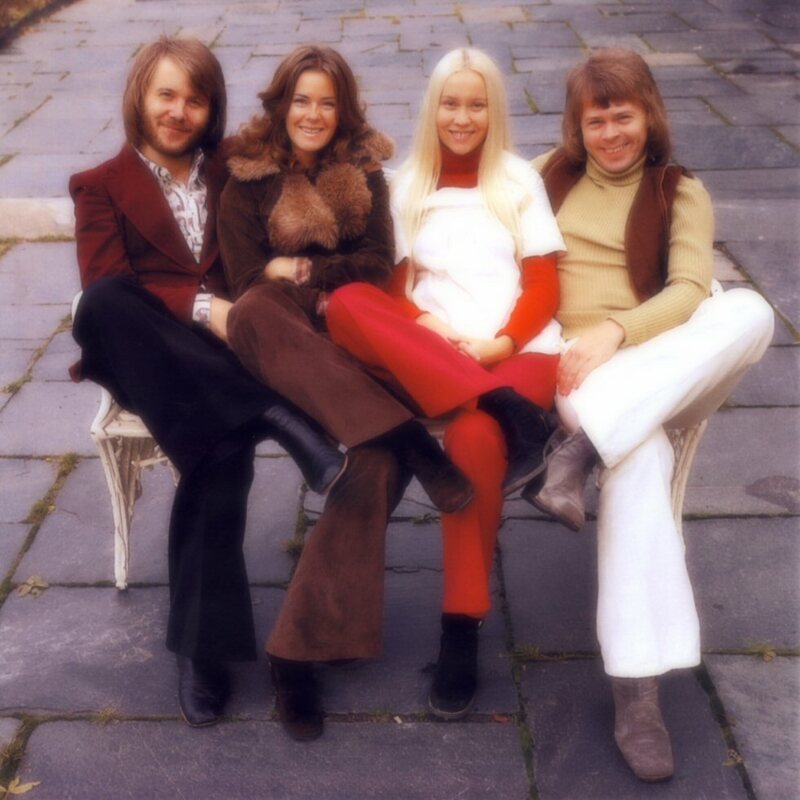 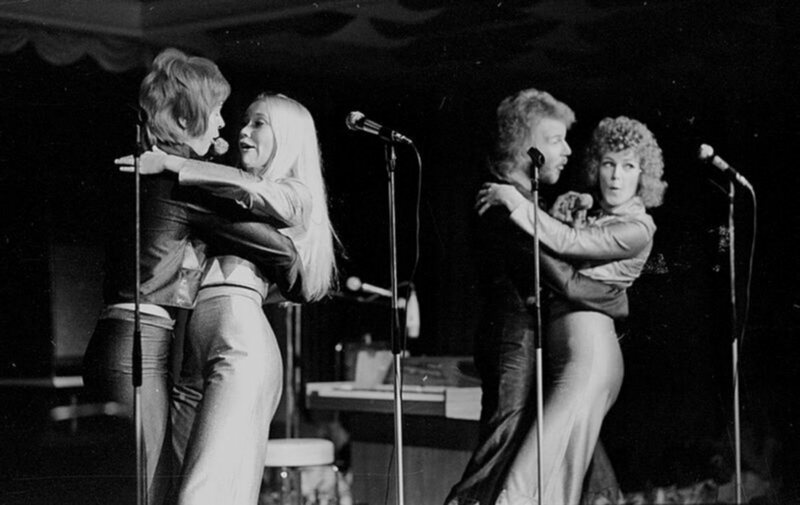 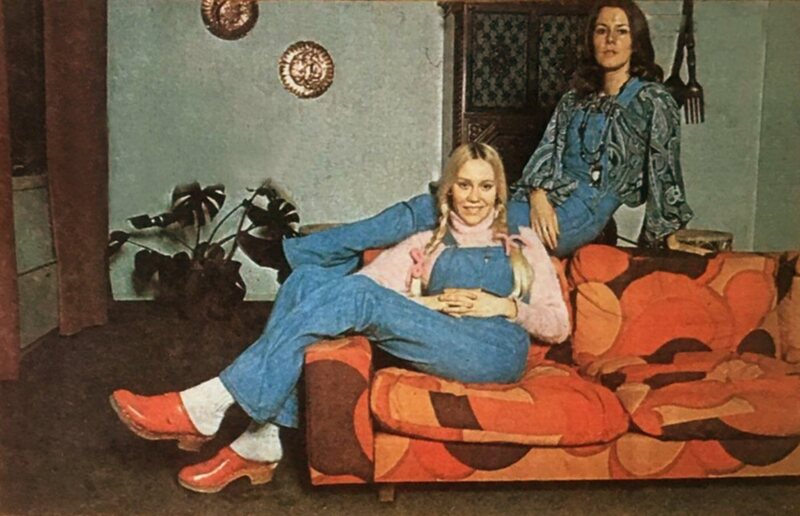 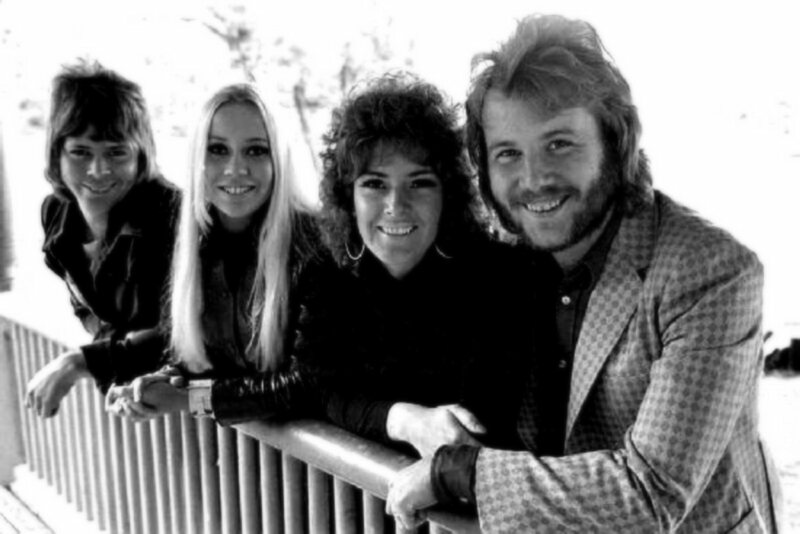 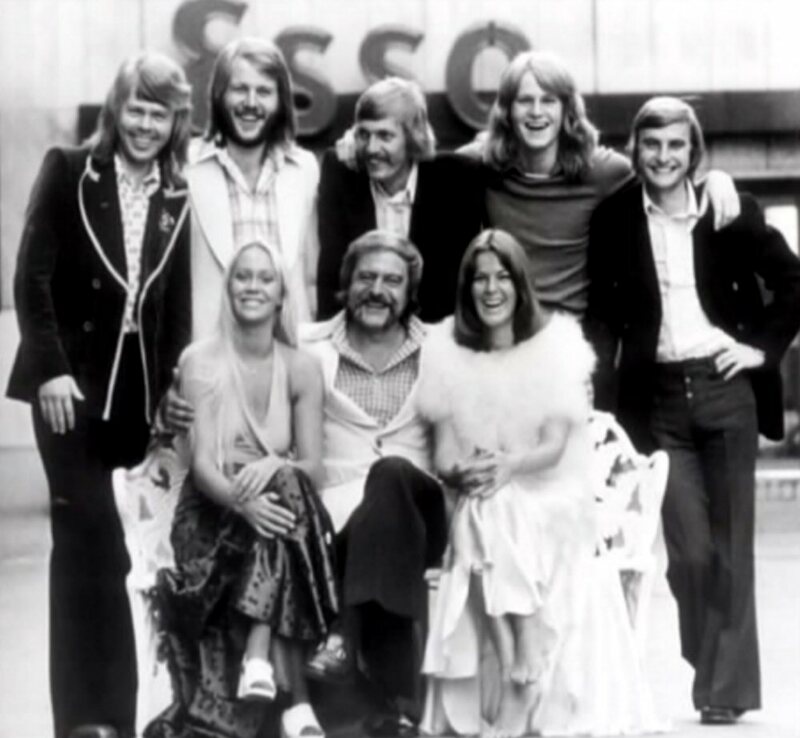 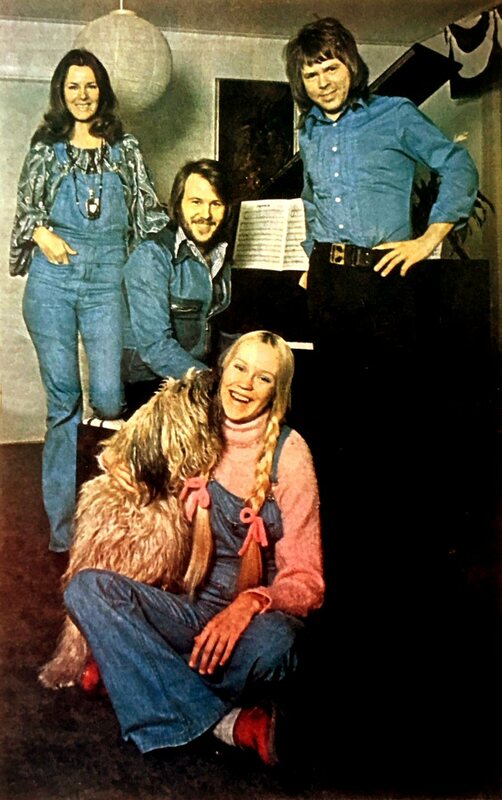 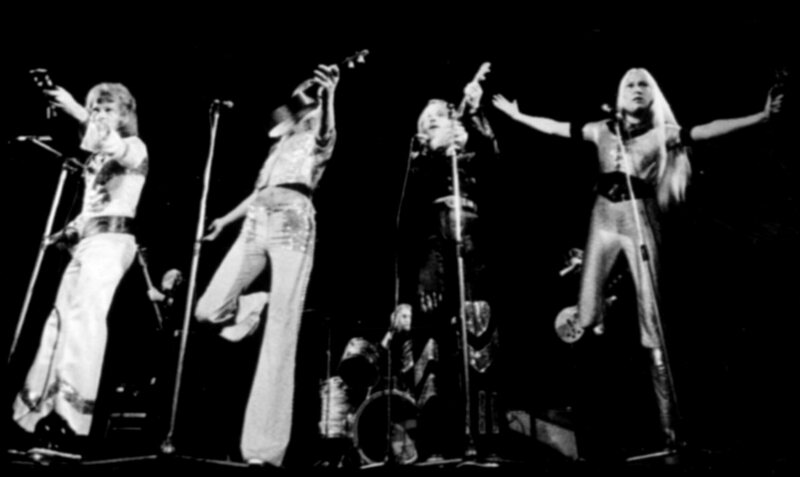 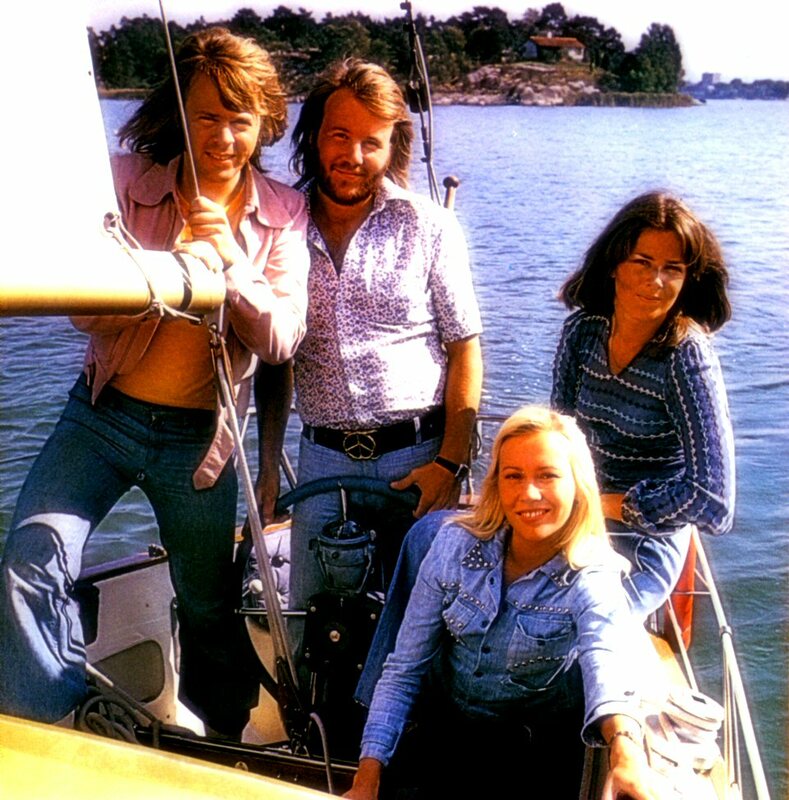 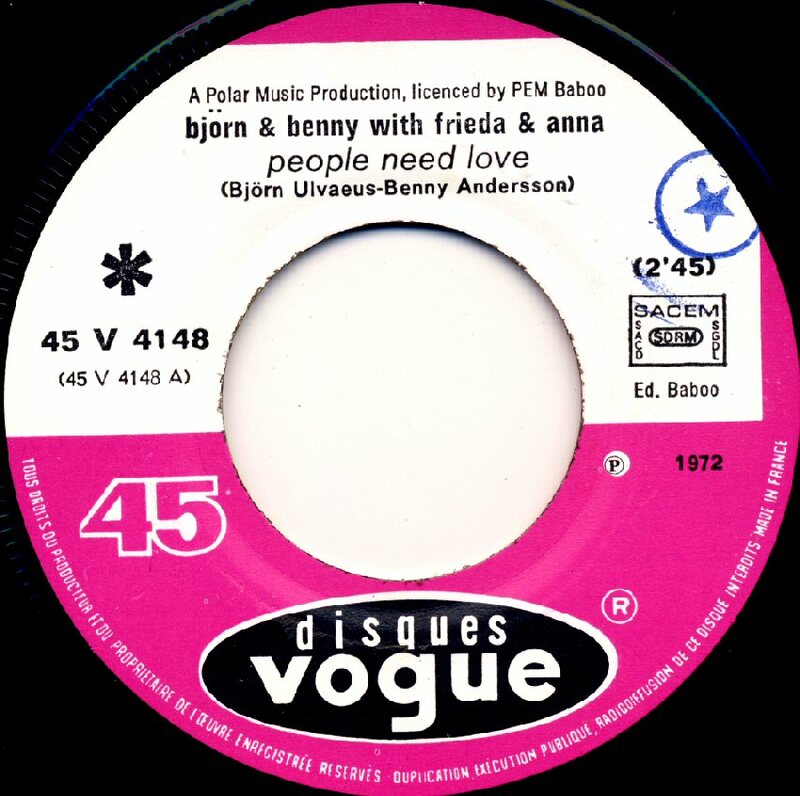 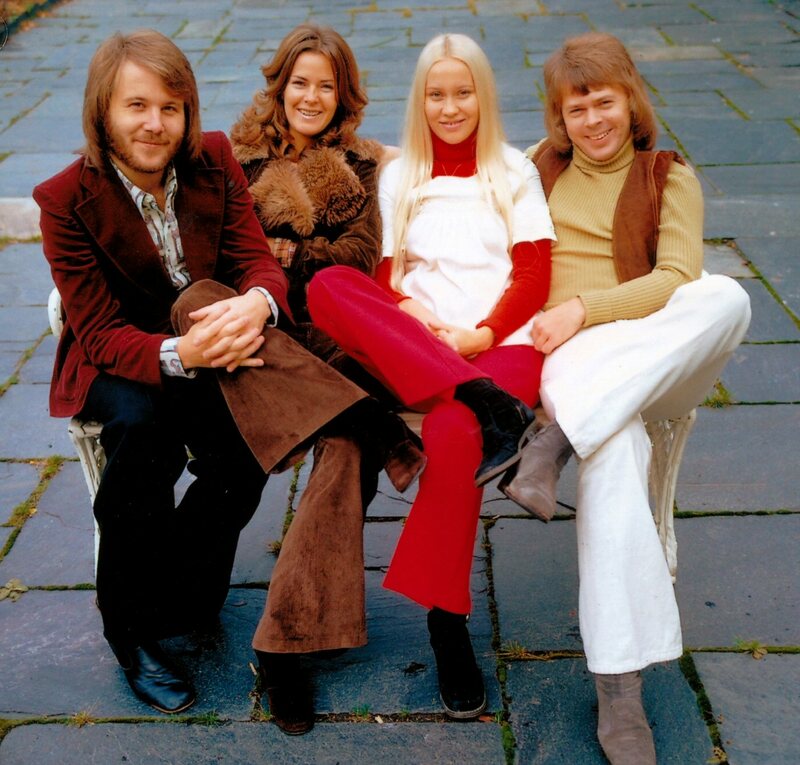 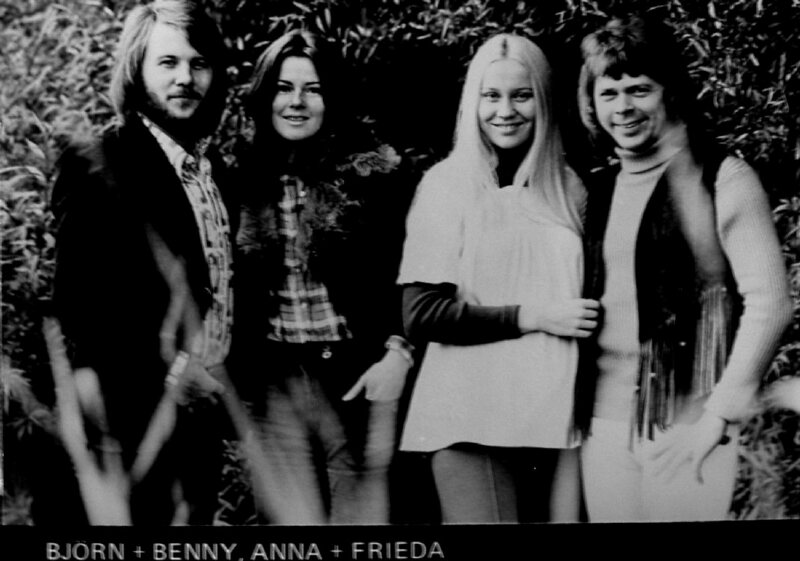 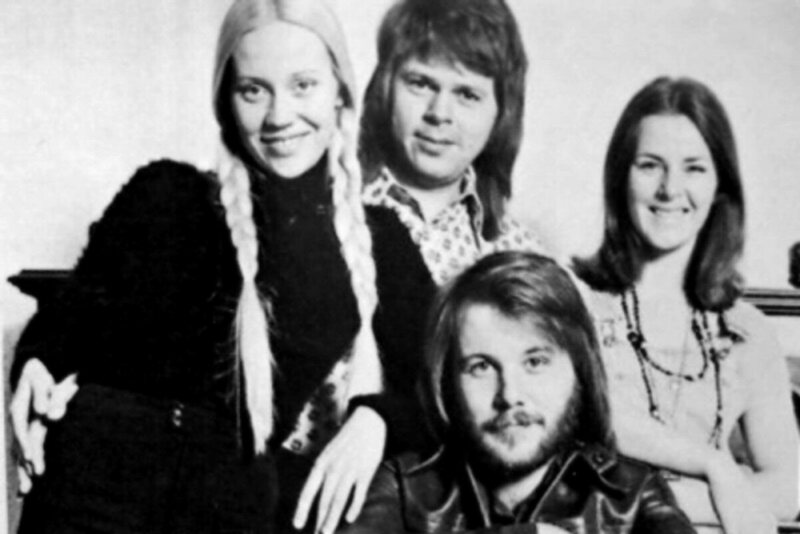 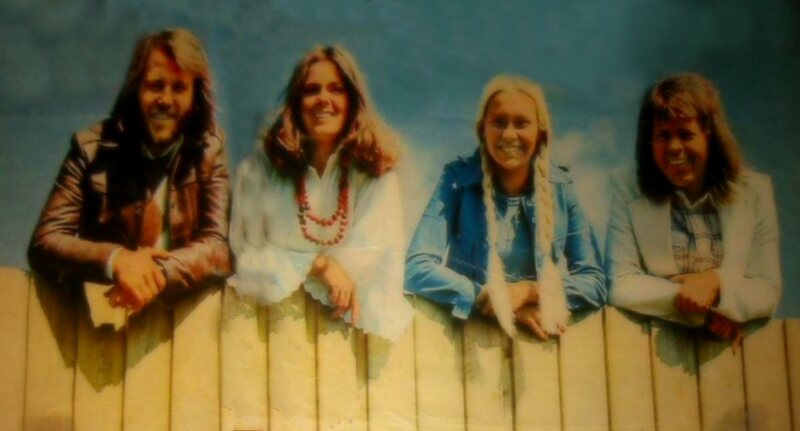 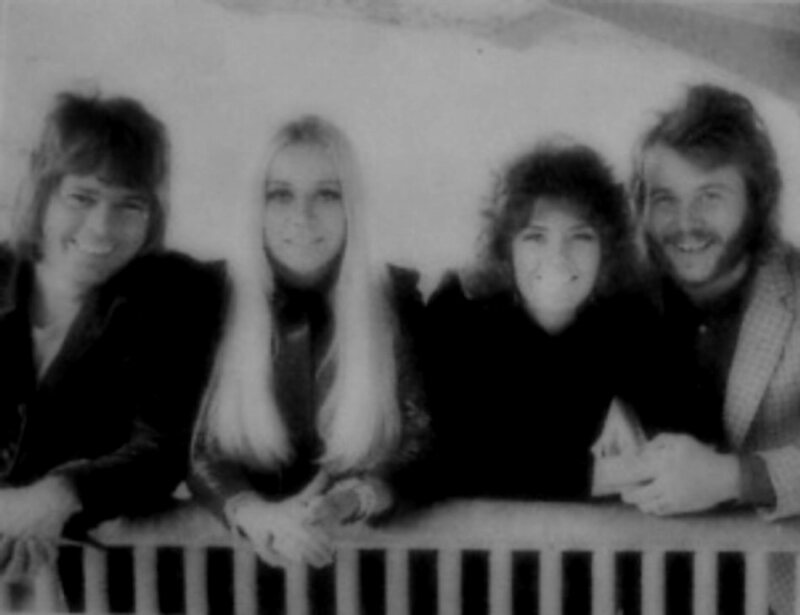 The cover featured the same picture as on the Swedish issue of the single but the names of the singers were a little bit different as Björn and Benny had been joined not by Frida and Agnetha but Frieda and Anna. 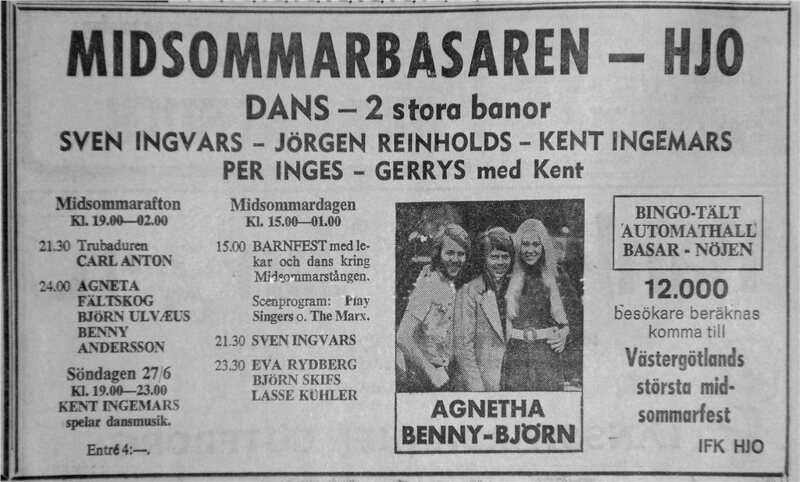 Agnetha would be called Anna some more years to come at the beginning of ABBA's international career. 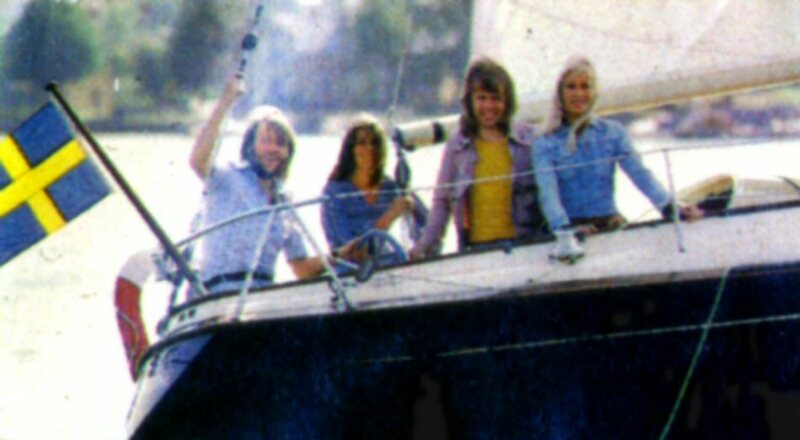 Pictures of ABBA and the team with Stikkan Anderson taken in the autumn 1972. 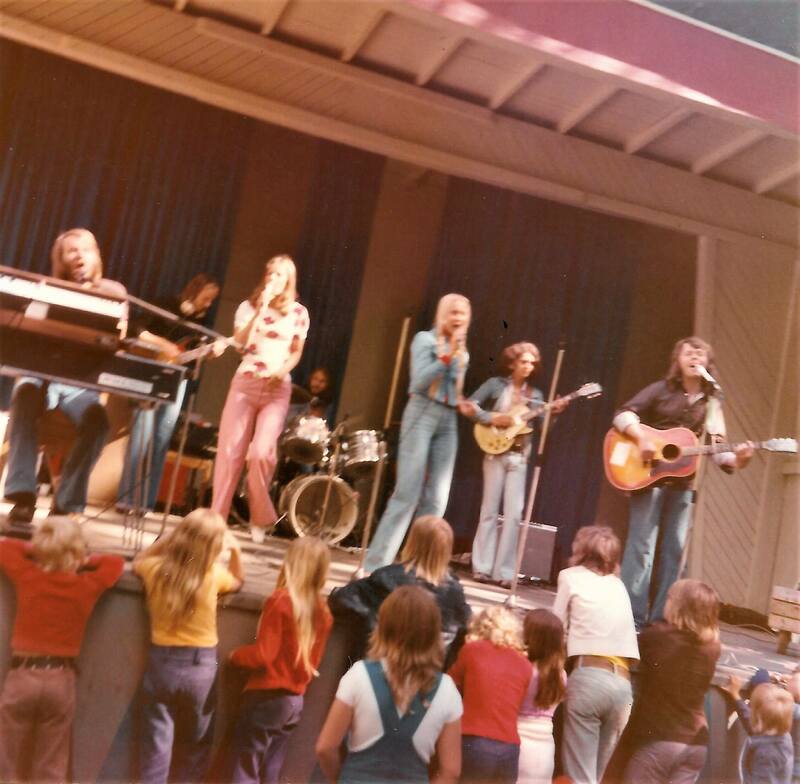 More pictures from autumn 1972. 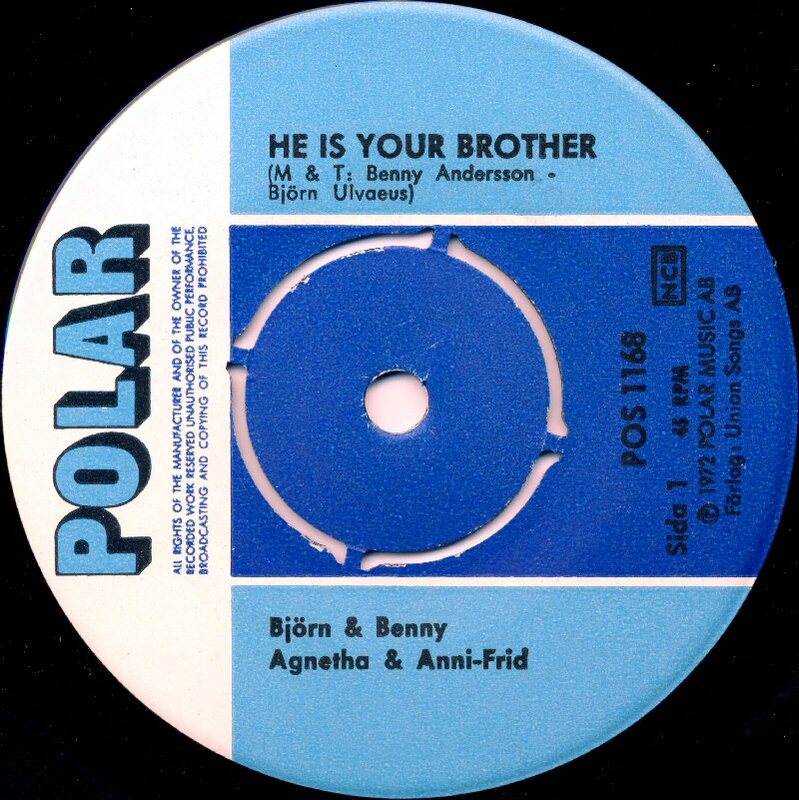 The second single "He Is Your Brother"/"Santa Rosa" was released by the group in November 1972. 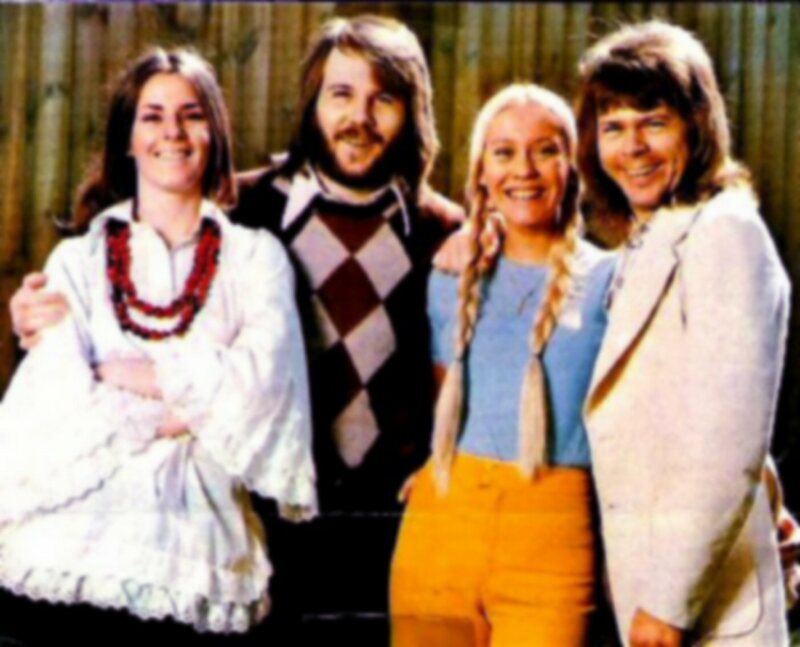 The single became #1 hit on "Tio i topp" chart in Sweden in December 1972. 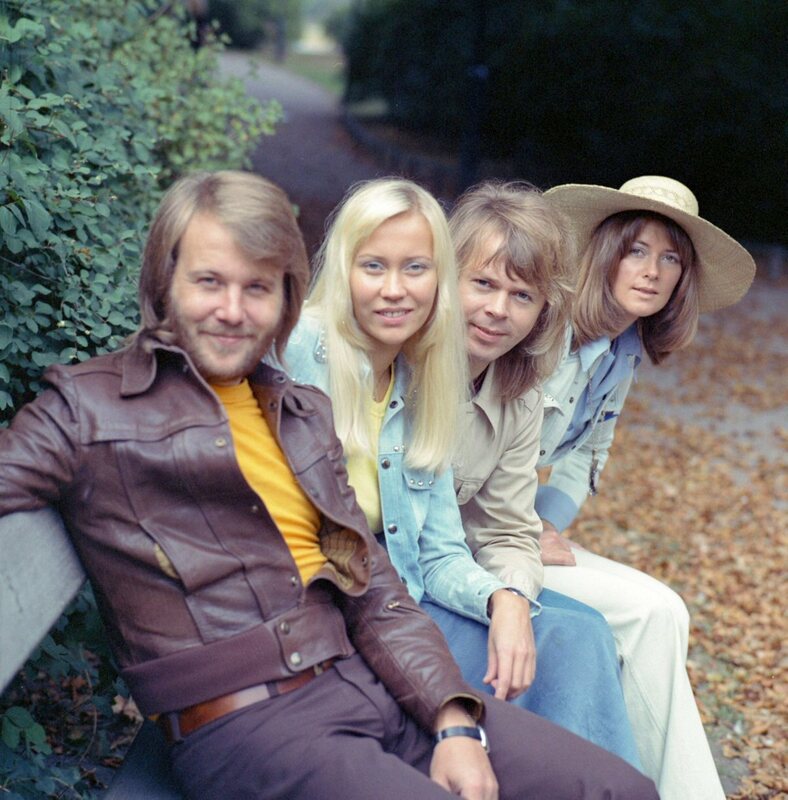 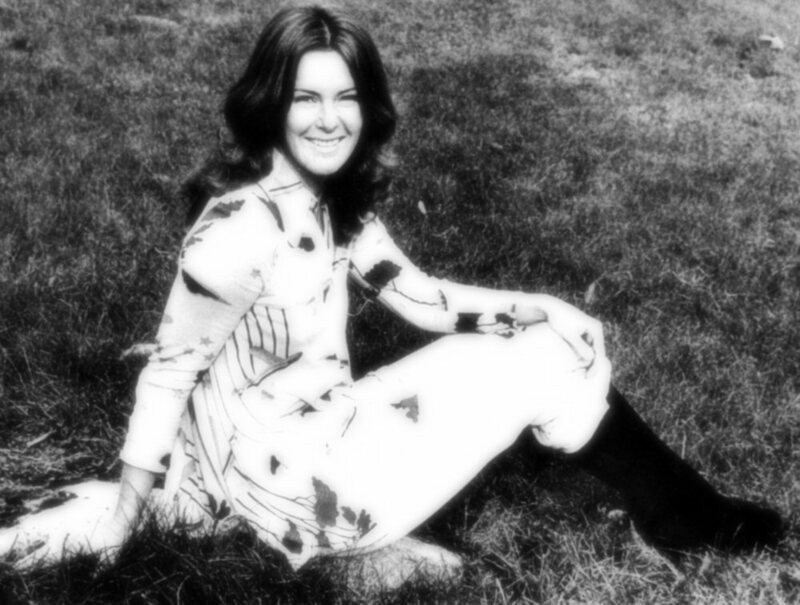 This early photo session was taken in the autumn 1972. 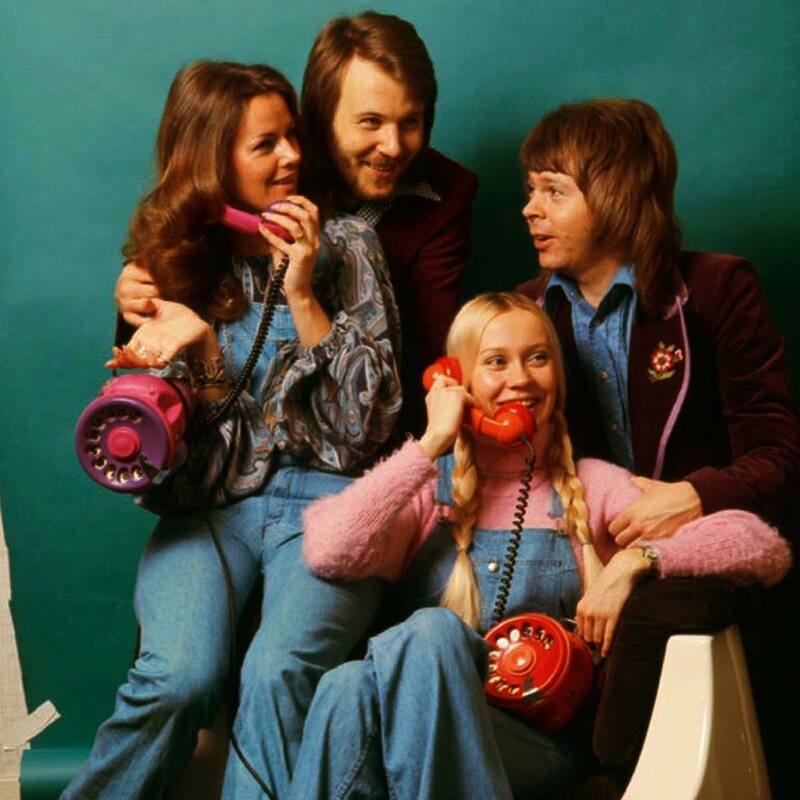 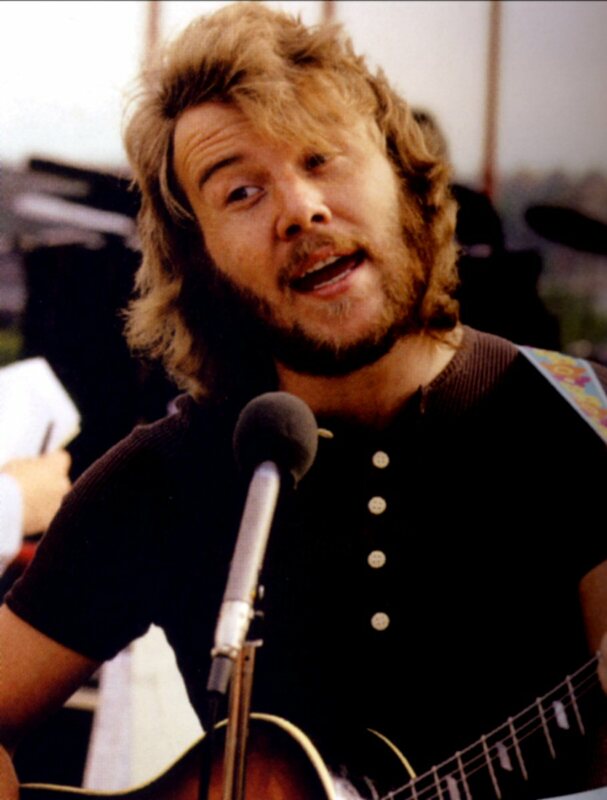 Two shots from this session were used for the cover of the single "He Is Your Brother" and the 1973 album "Ring Ring". 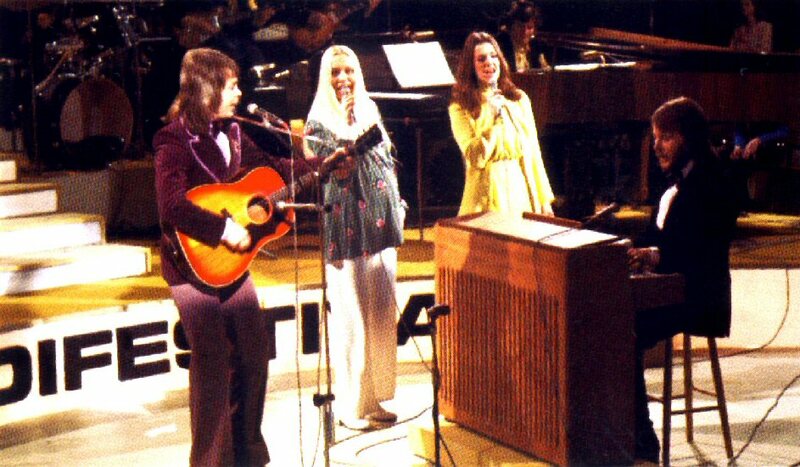 In Japan the group was in Tokyo where they participated in the International Yamaha Festival - they performed "Santa Rosa". 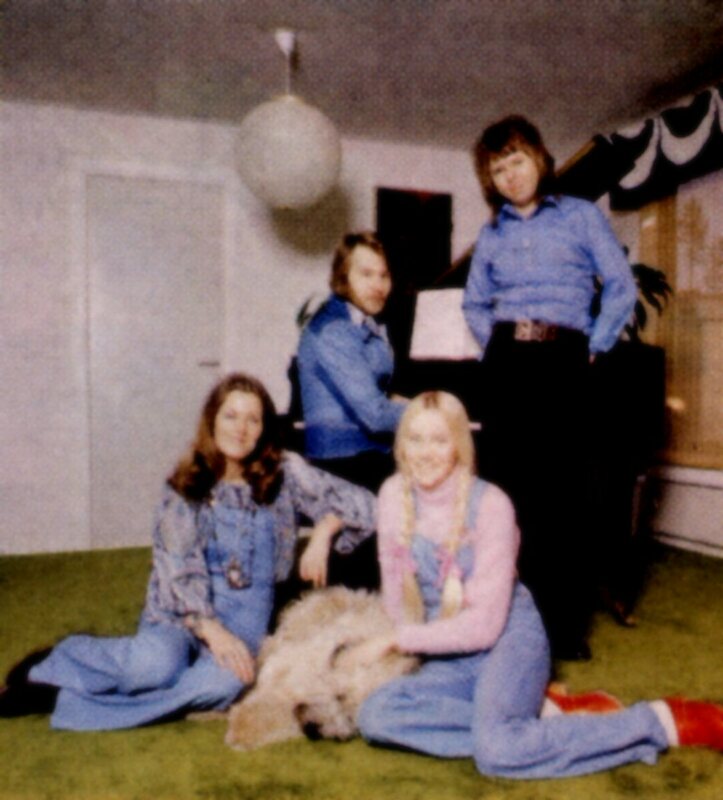 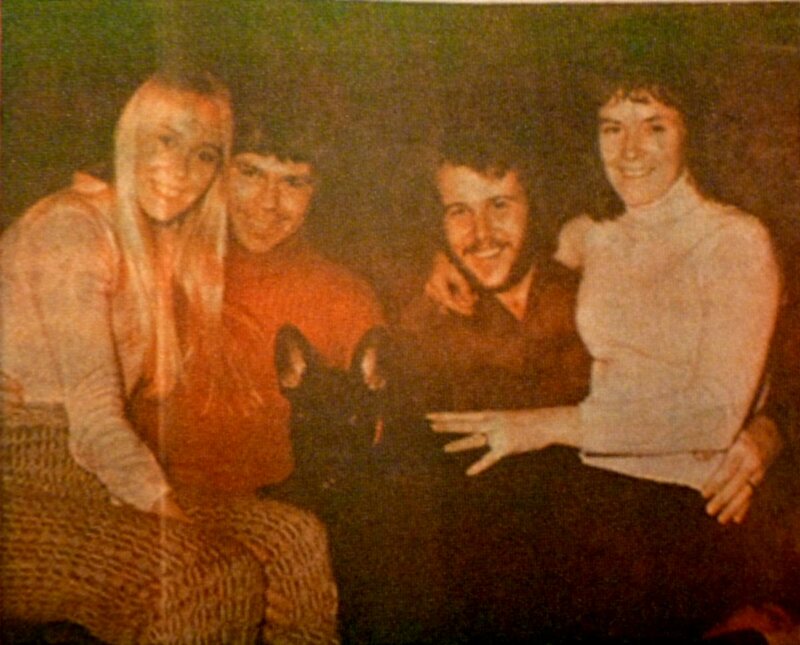 At the end of the year 1972 there was arranged a Christmas photo session at Björn's and Agnetha's place in Vallentuna. 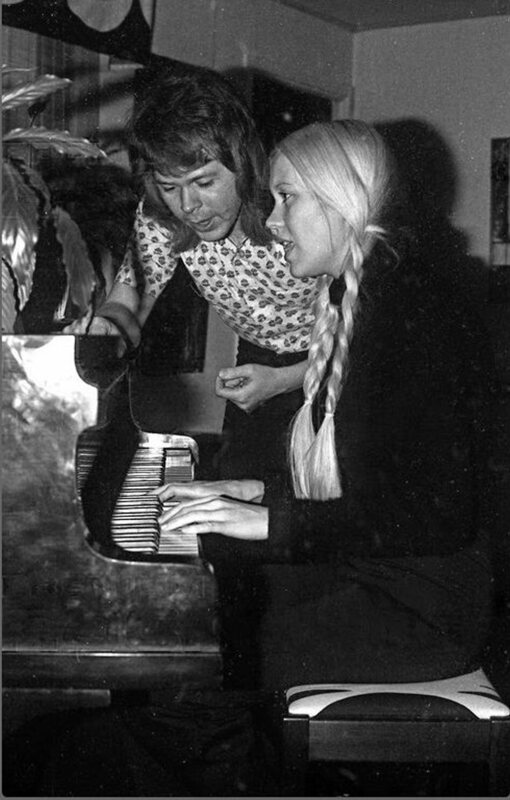 Hundreds of photos were taken during the session and many of them were later published in several Swedish magazines. 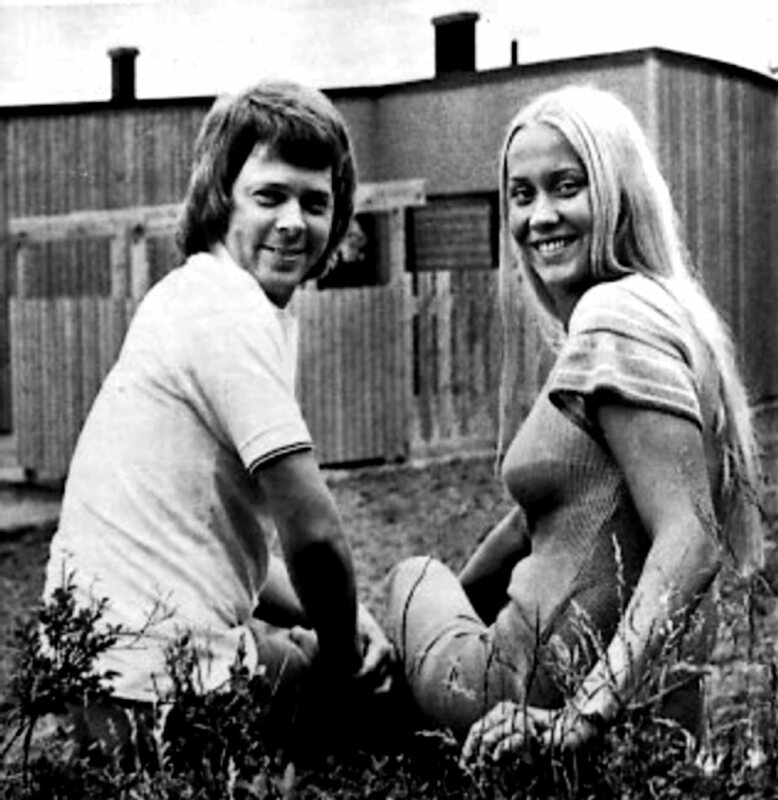 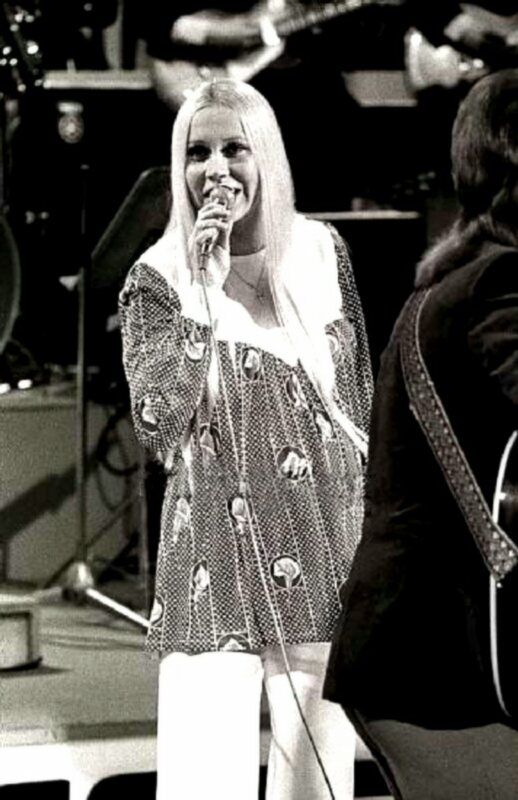 Pictures from this session were even used in several articles about Agnetha's pregnancy. 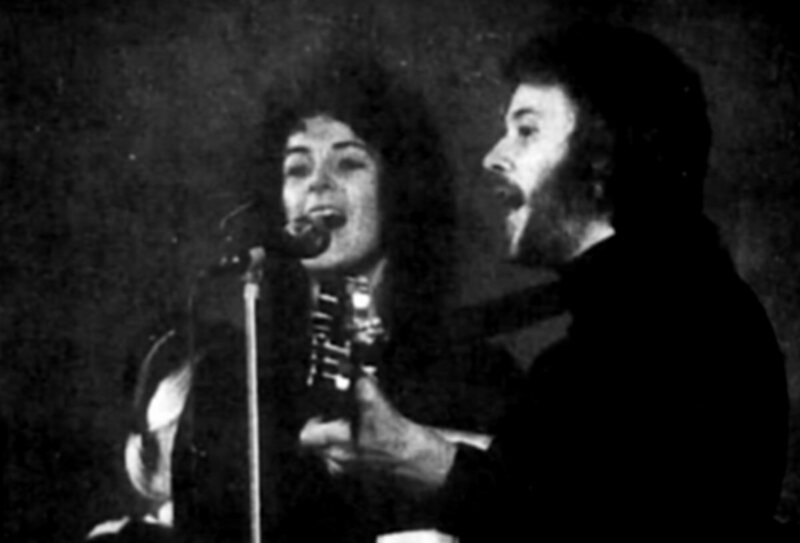 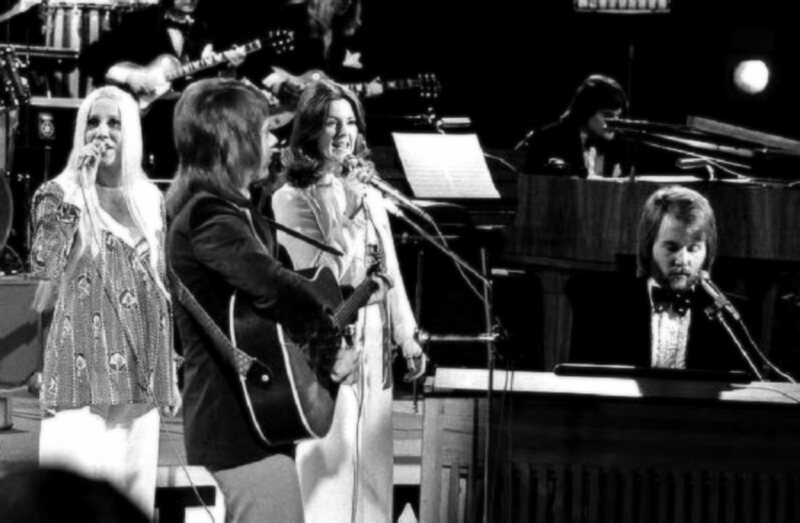 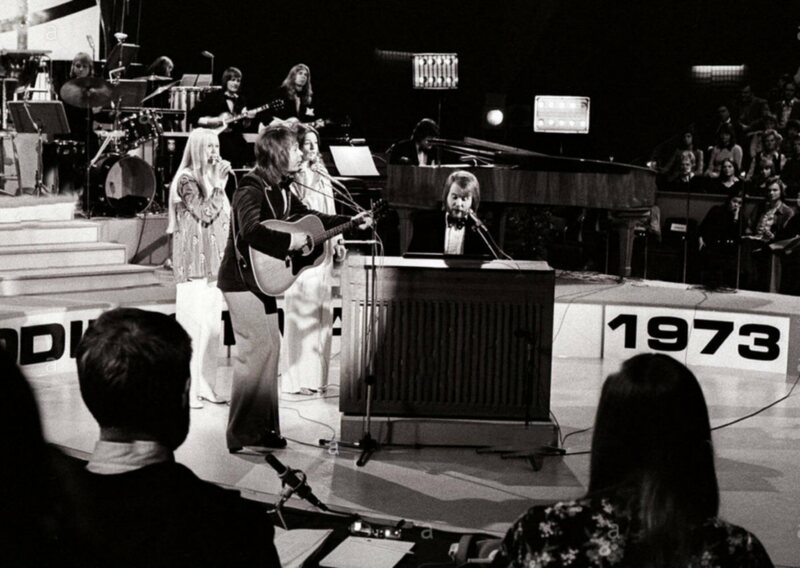 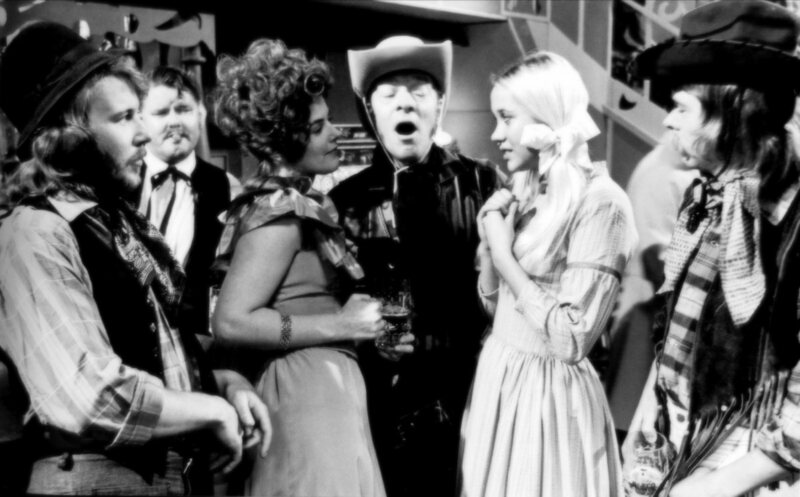 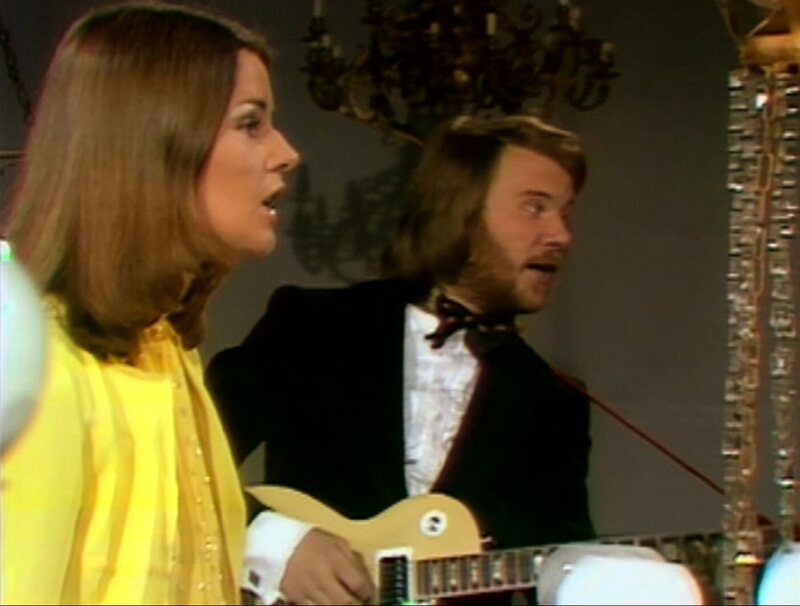 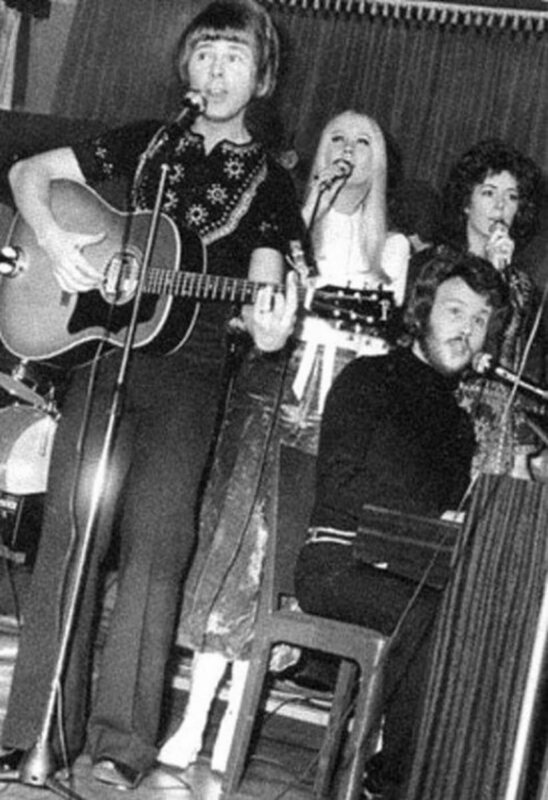 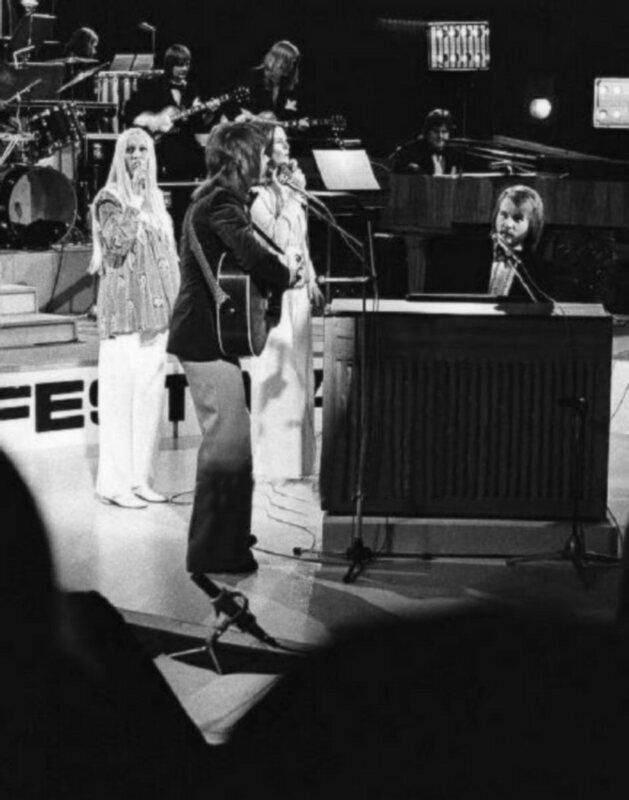 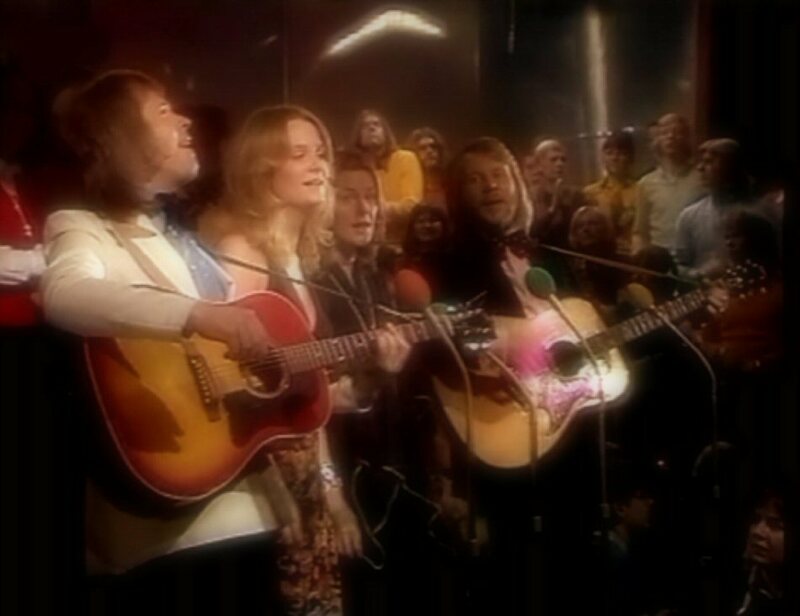 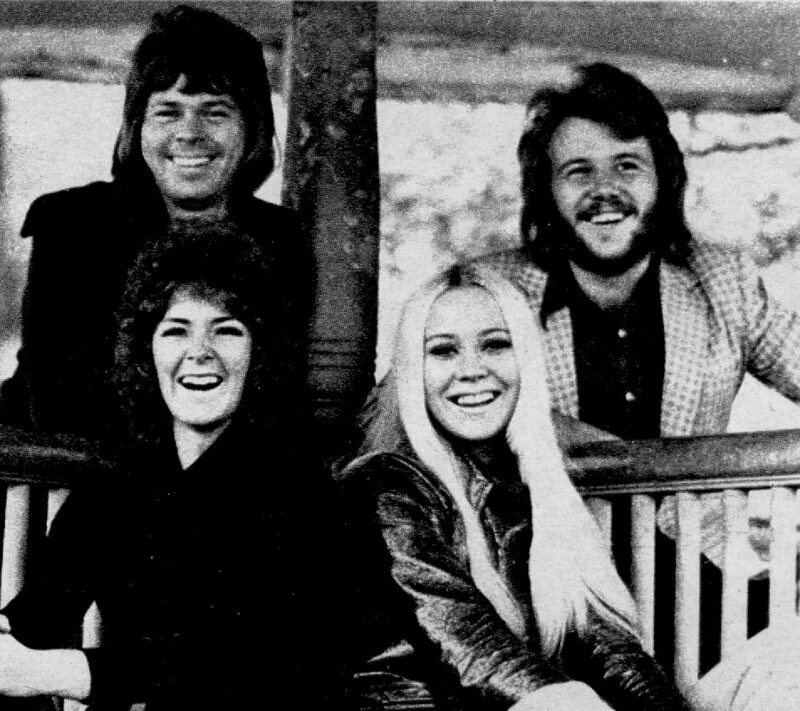 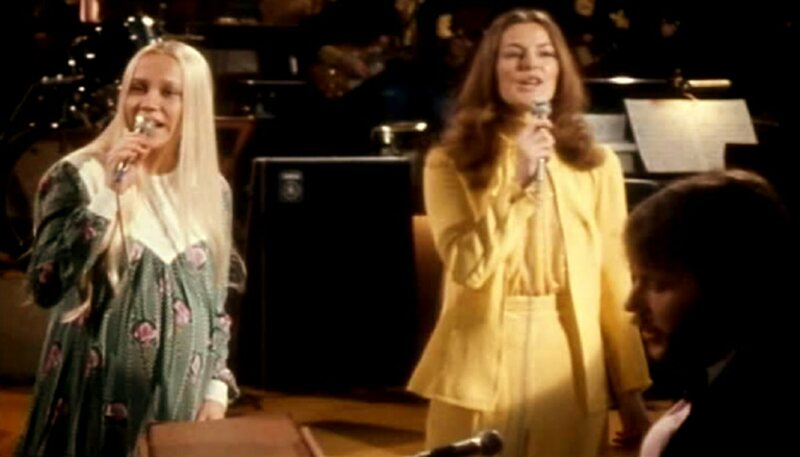 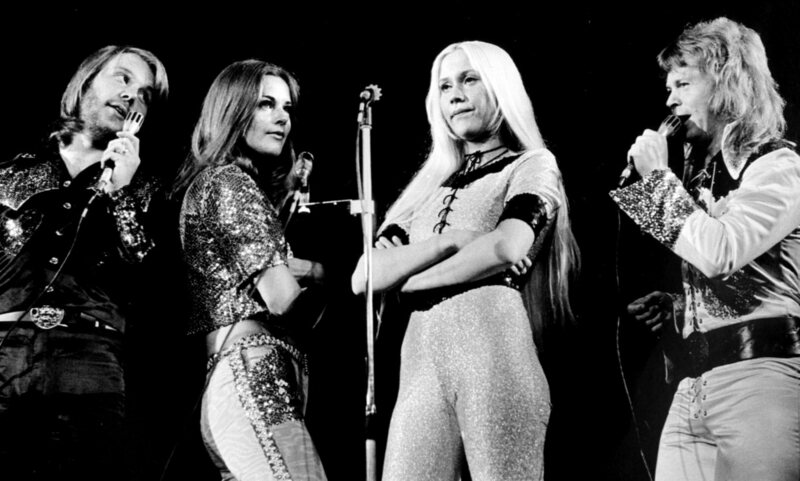 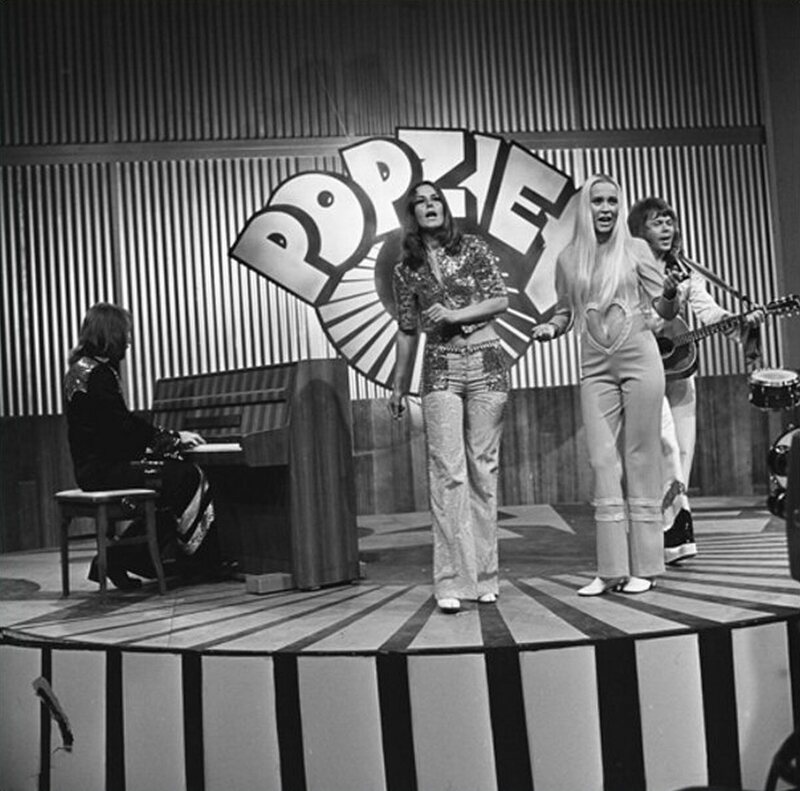 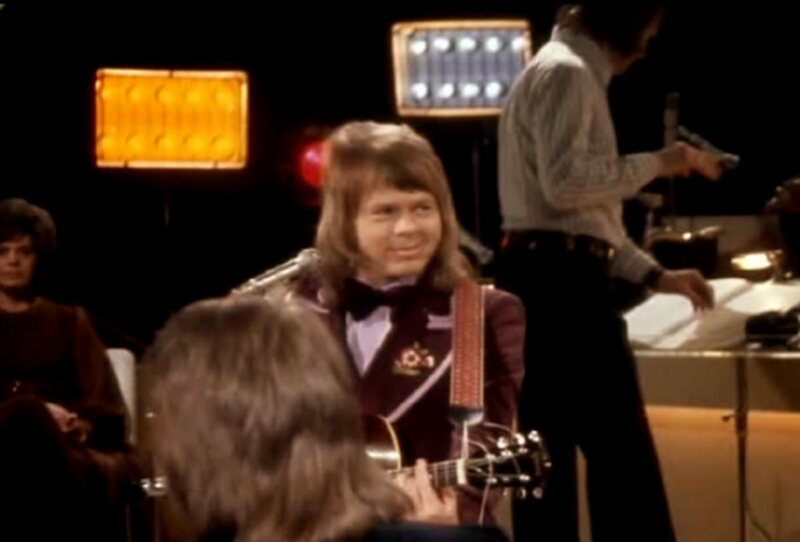 Björn, Benny, Frida and her friend Inger Brundin performed "People Need Love" on German TV on January 6, 1973. 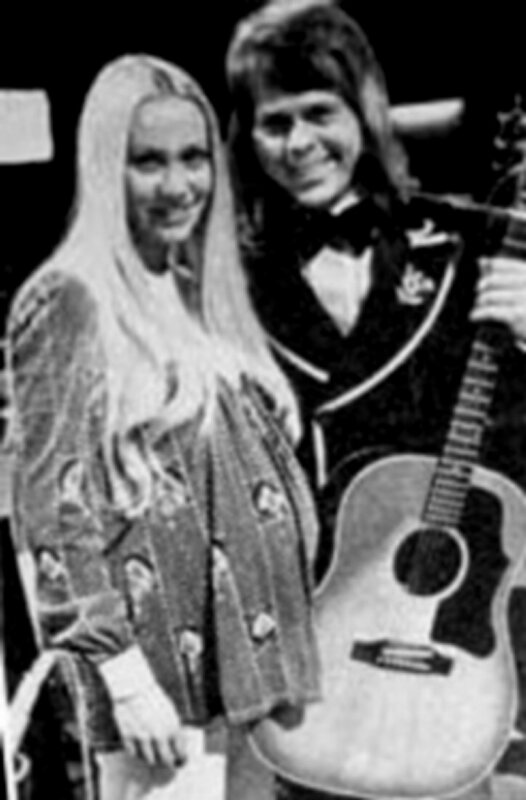 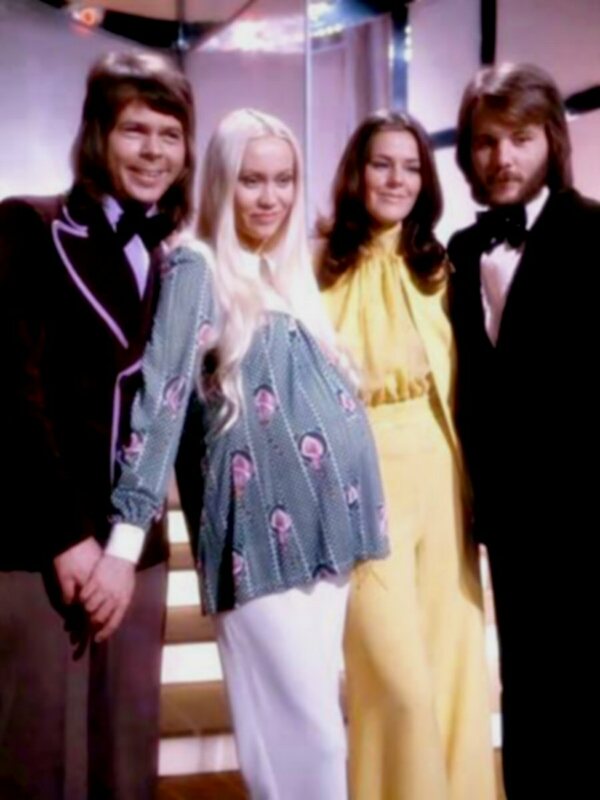 Agnetha did not participate in the show because of her pregnancy. 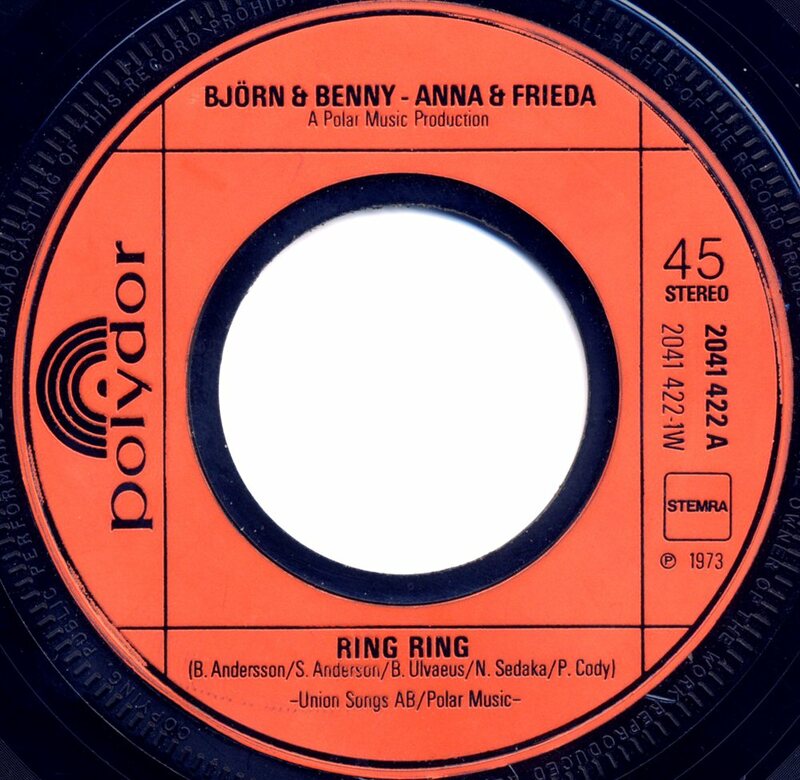 At the beginning of January the Swedish version of "Ring Ring" was recorded. 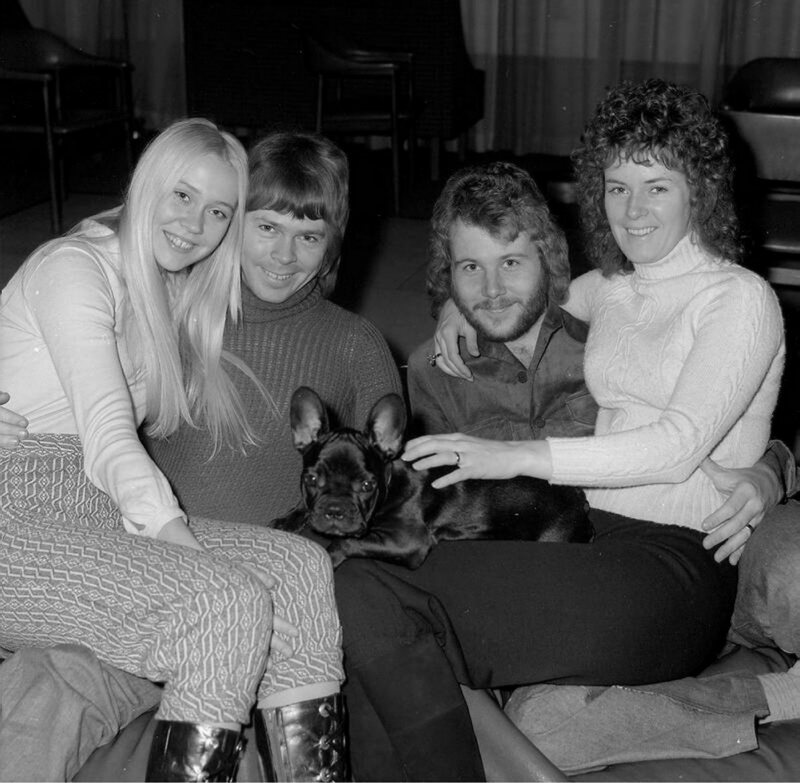 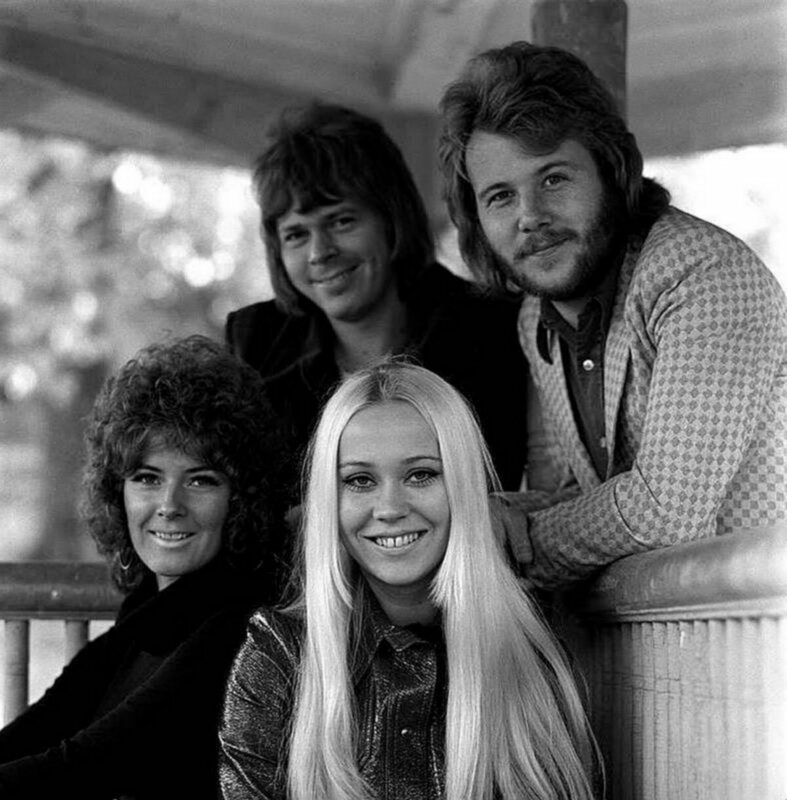 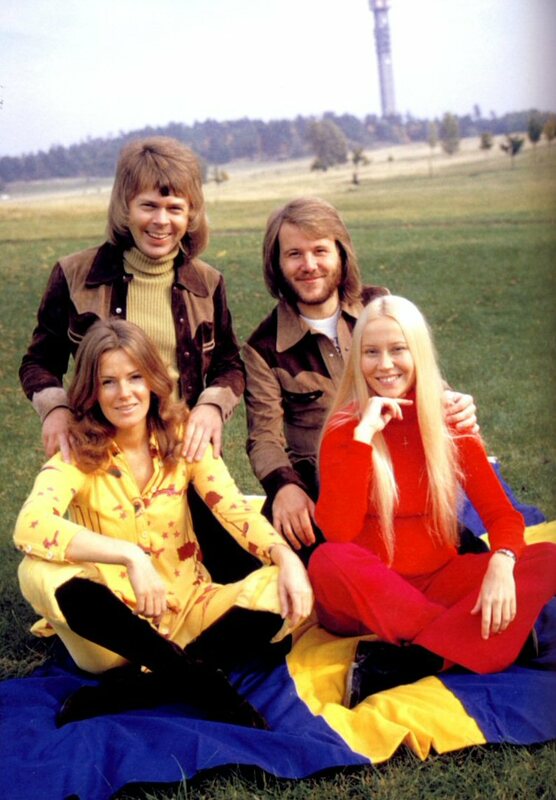 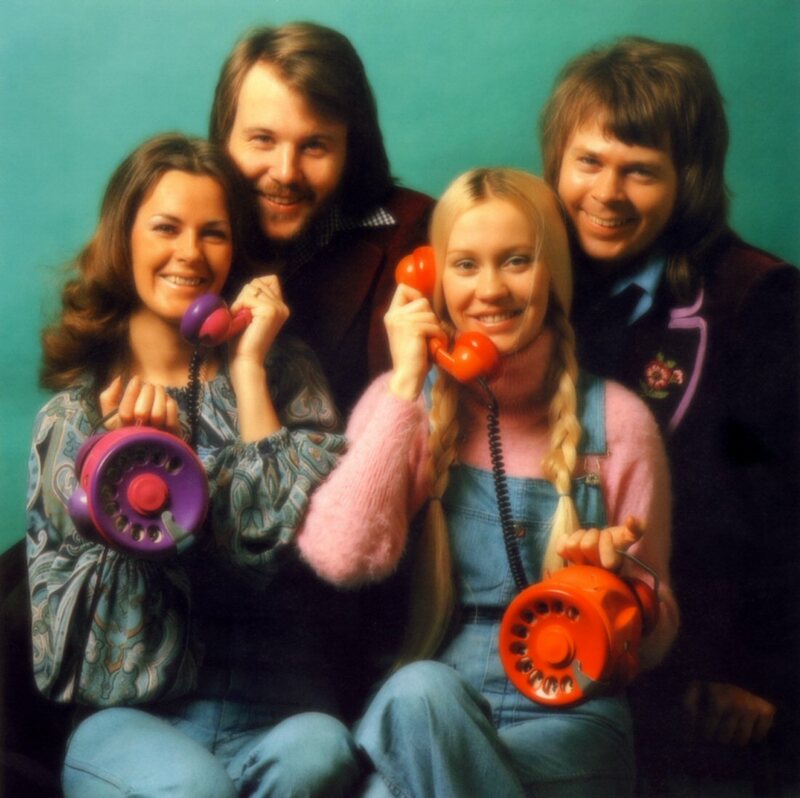 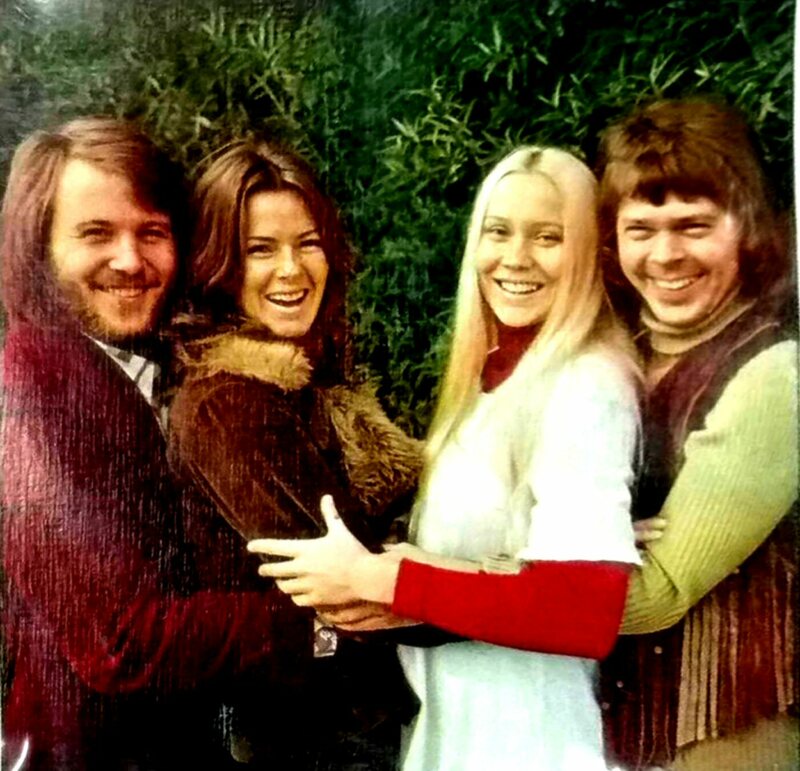 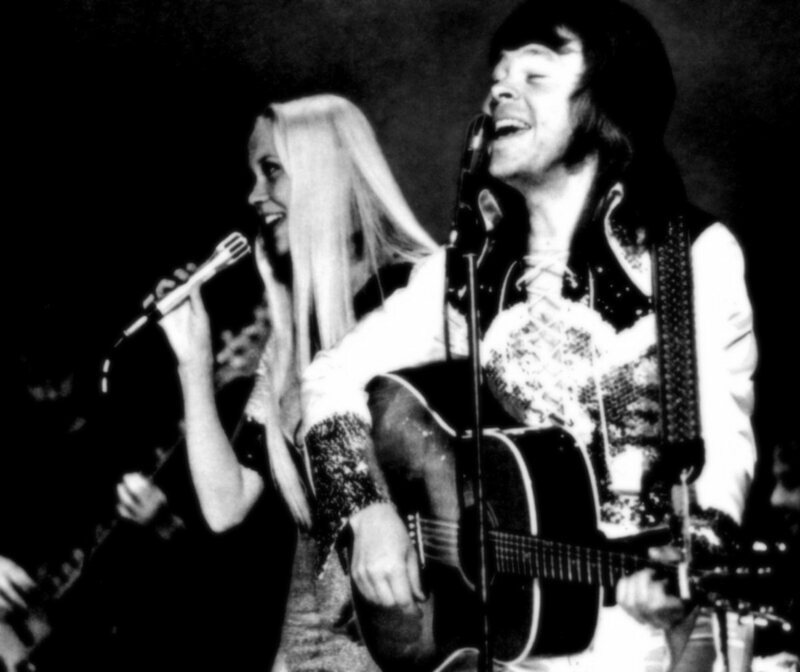 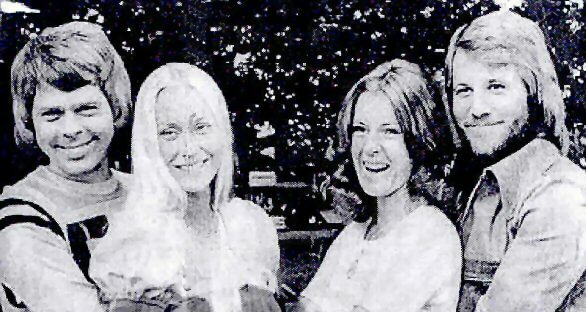 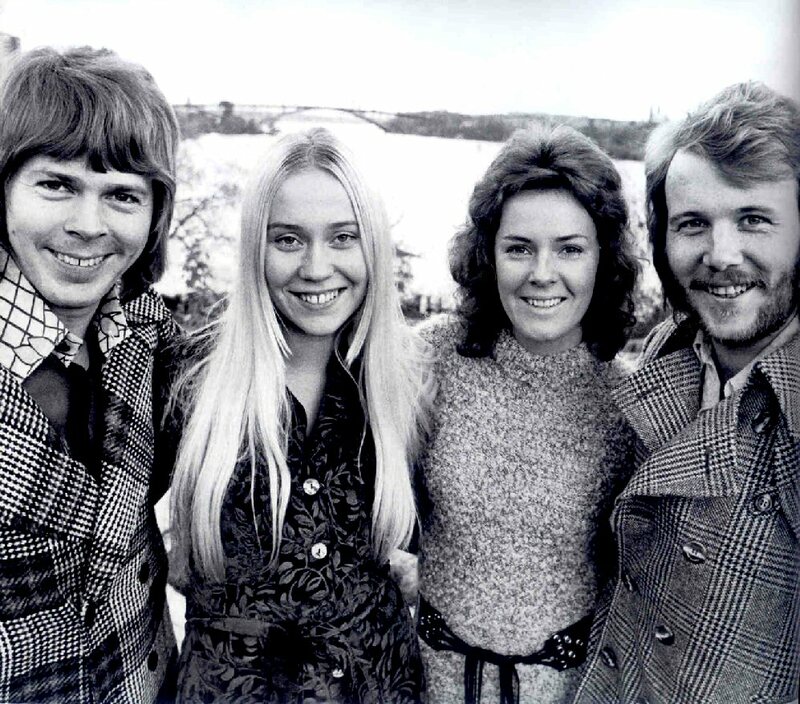 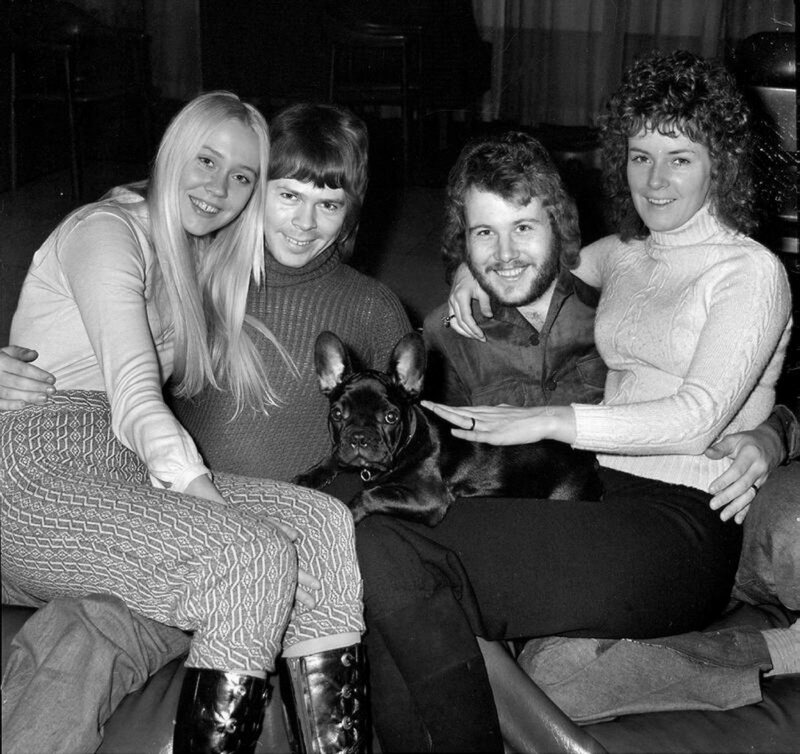 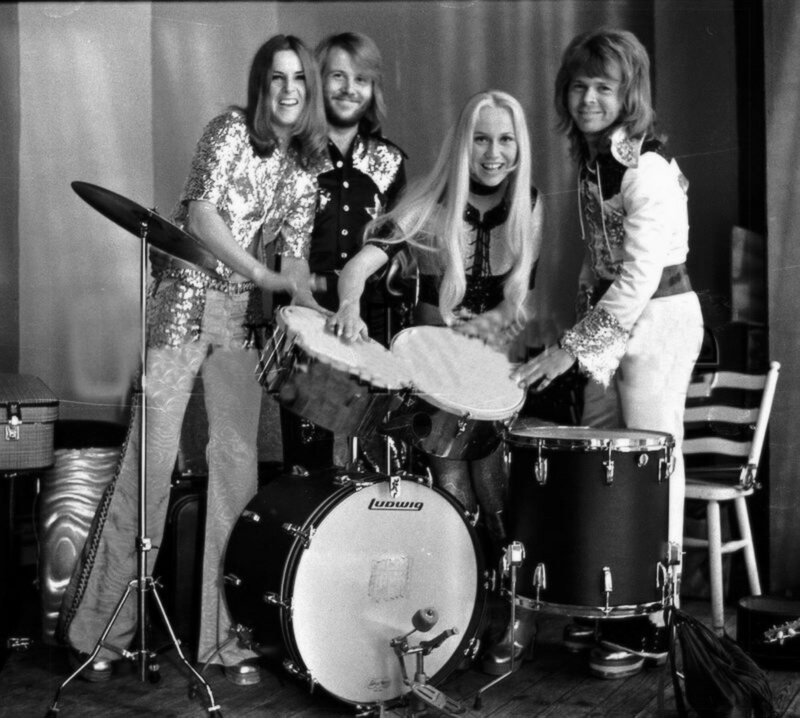 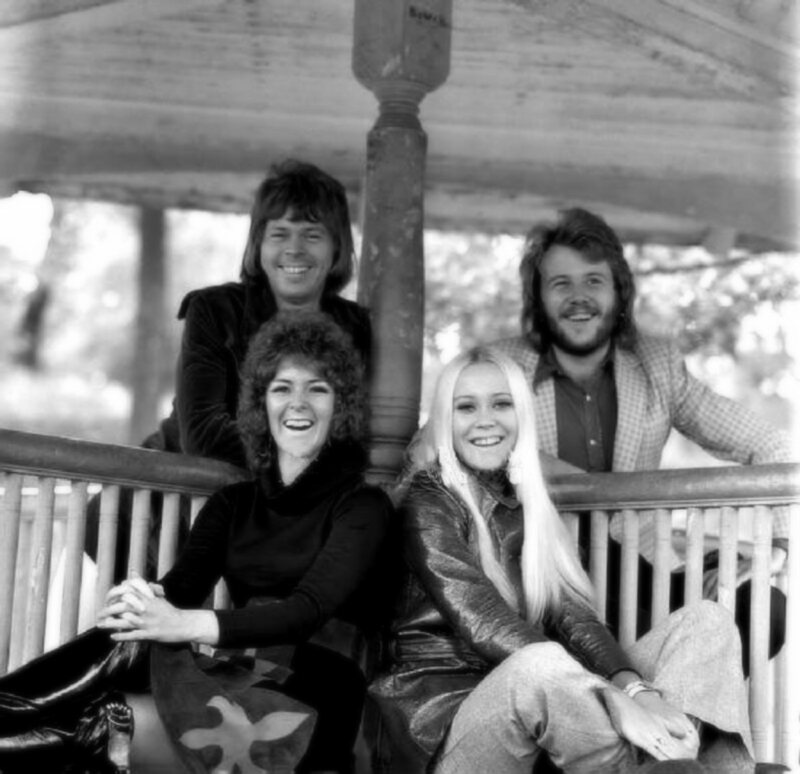 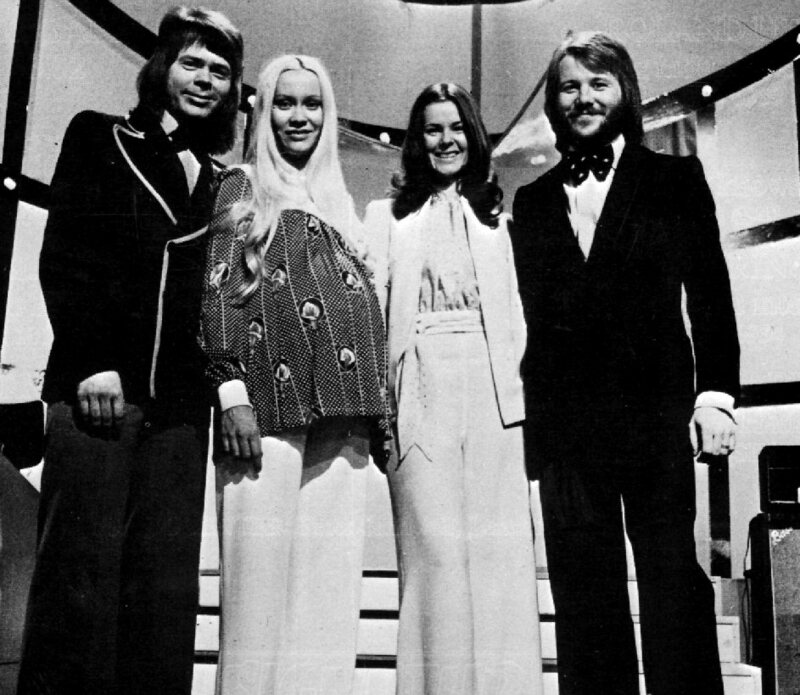 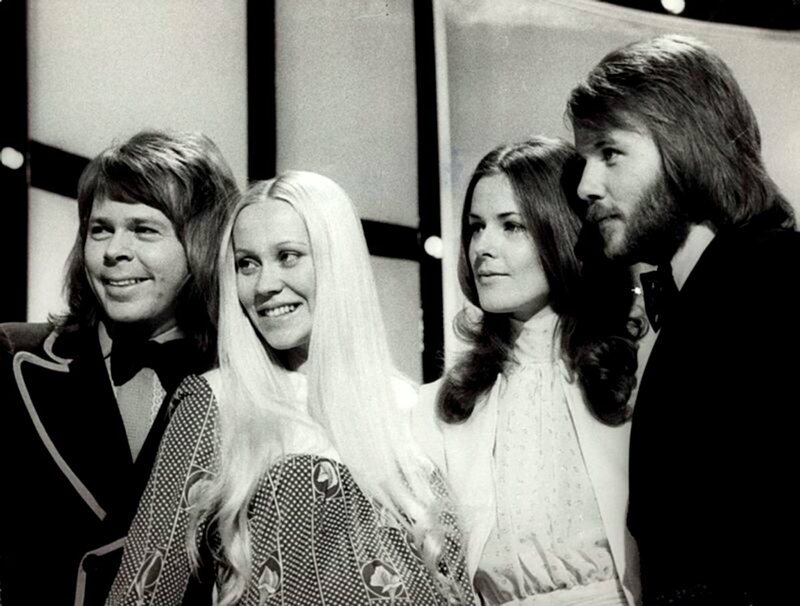 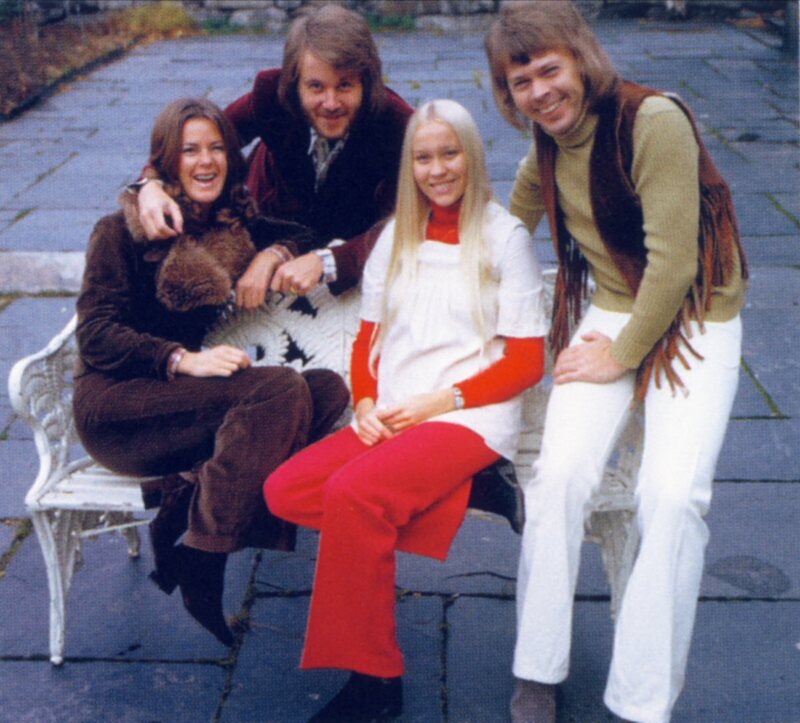 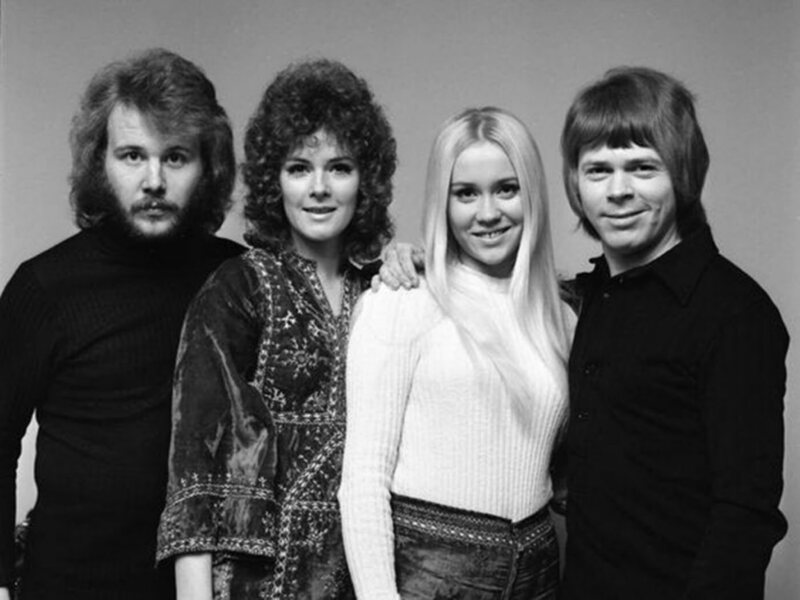 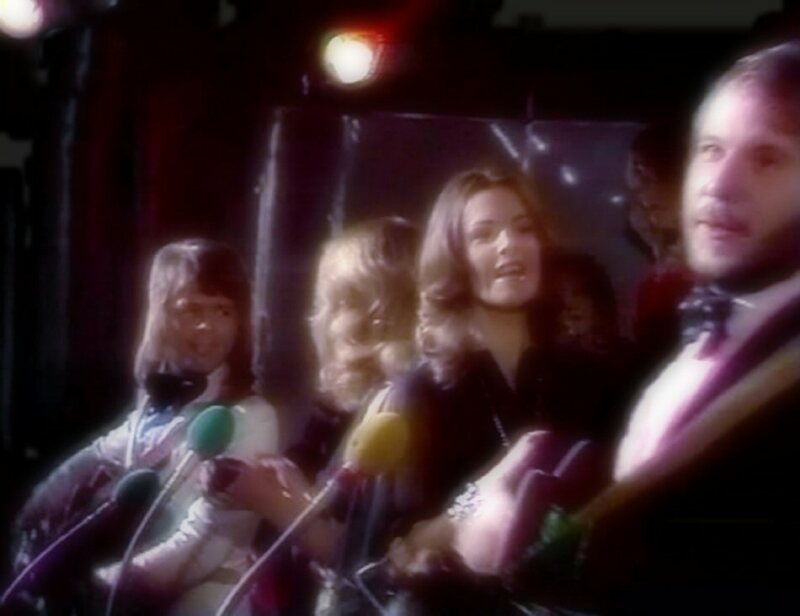 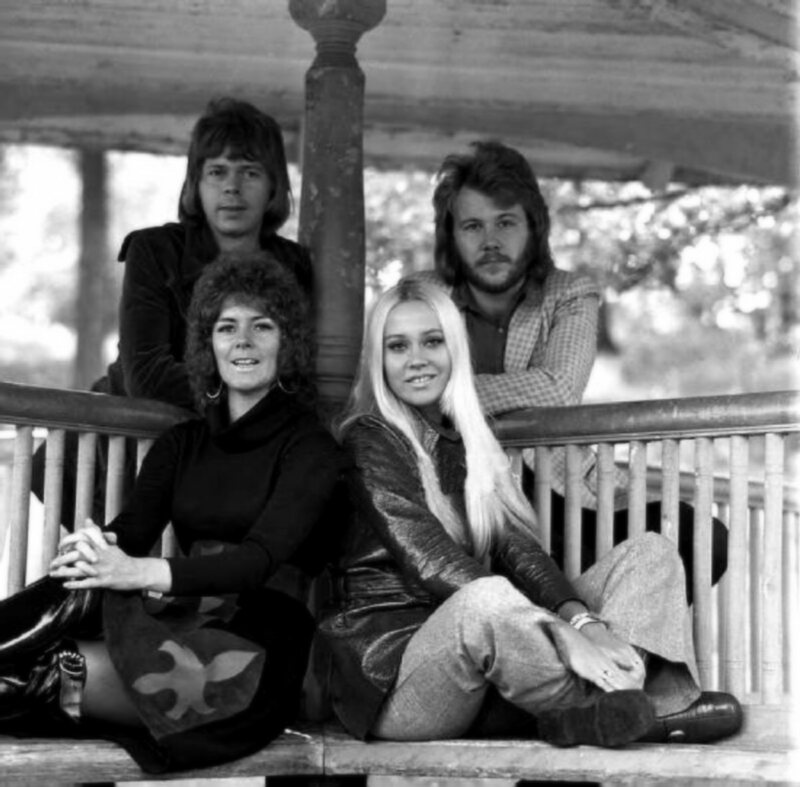 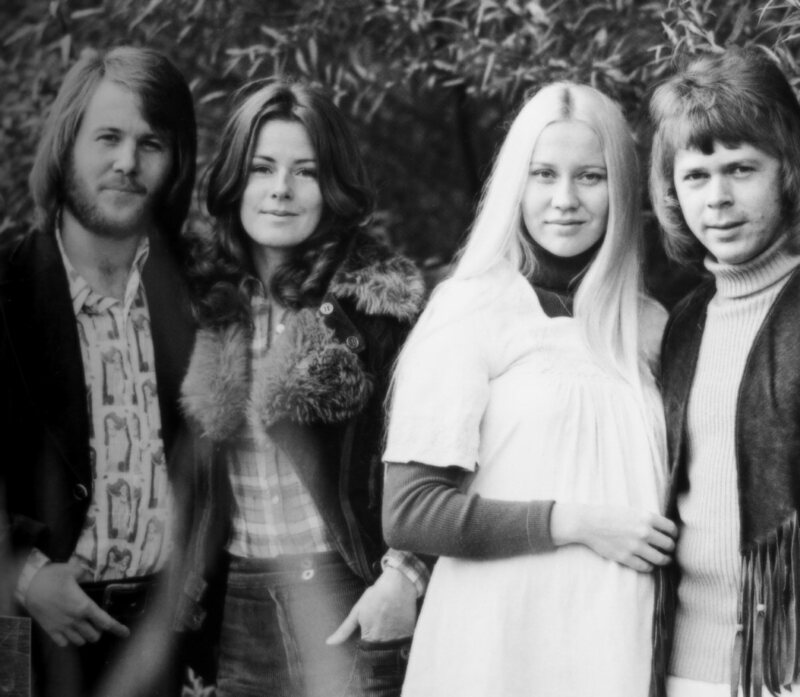 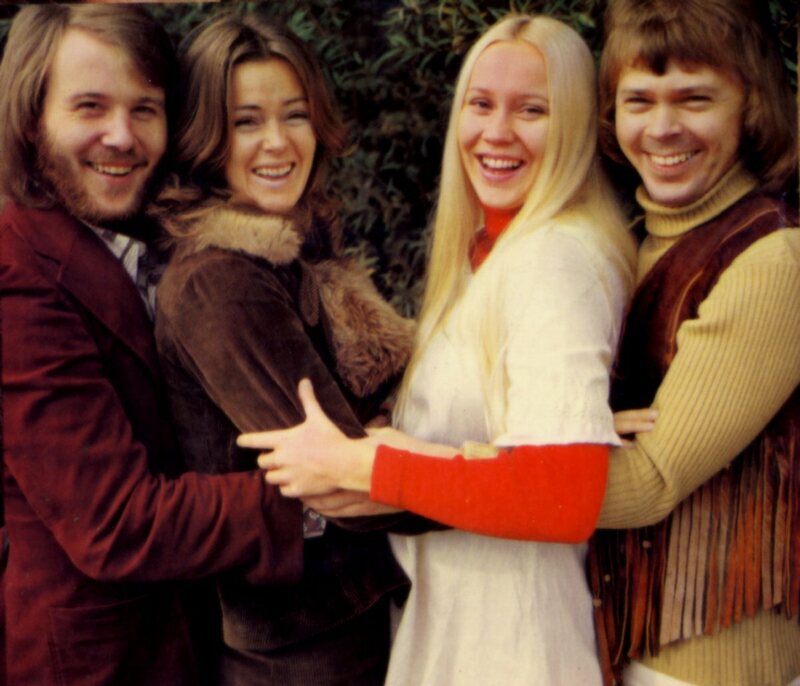 Björn, Benny, Agnetha and Frida participated for the first time in 1973 in the Swedish "Melodifestivalen" - the outtake for the Eurovision Song Contest. 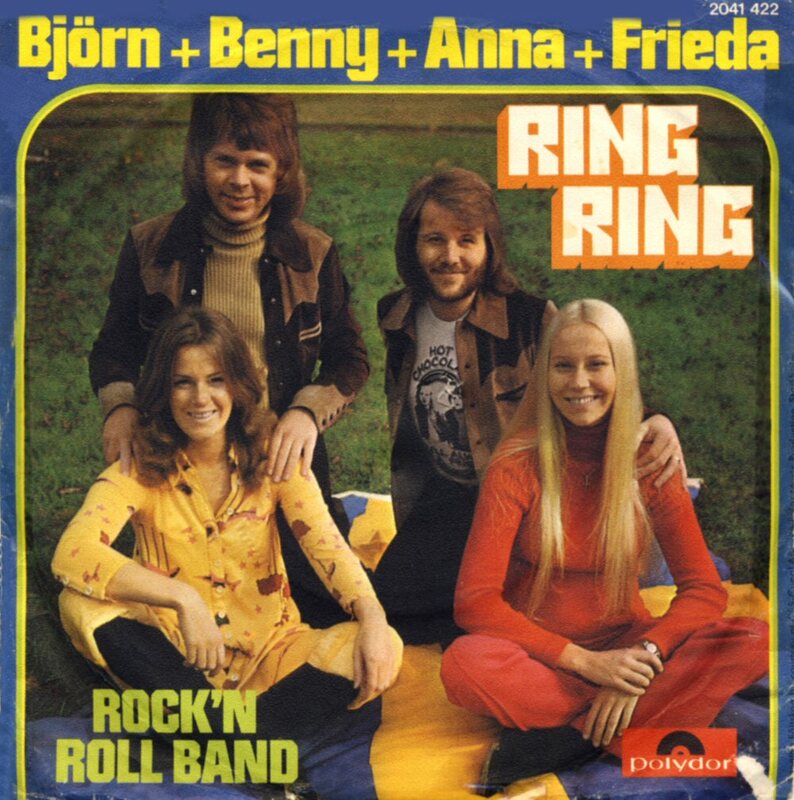 They performed "Ring Ring". 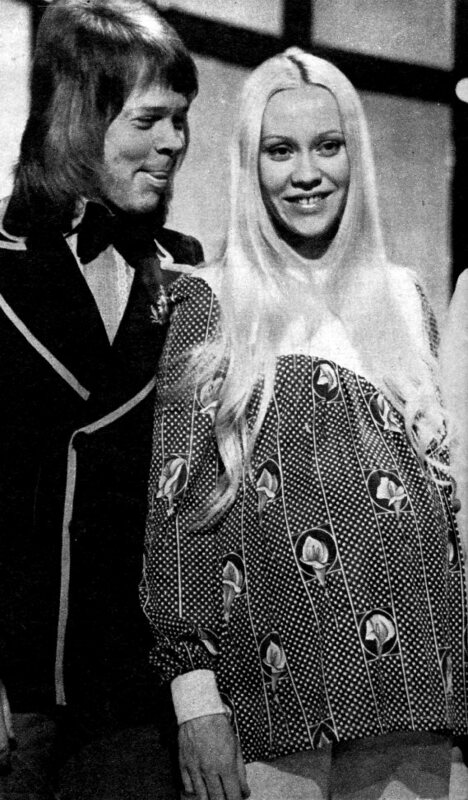 Agnetha was there although she was pregnant in ninth month. 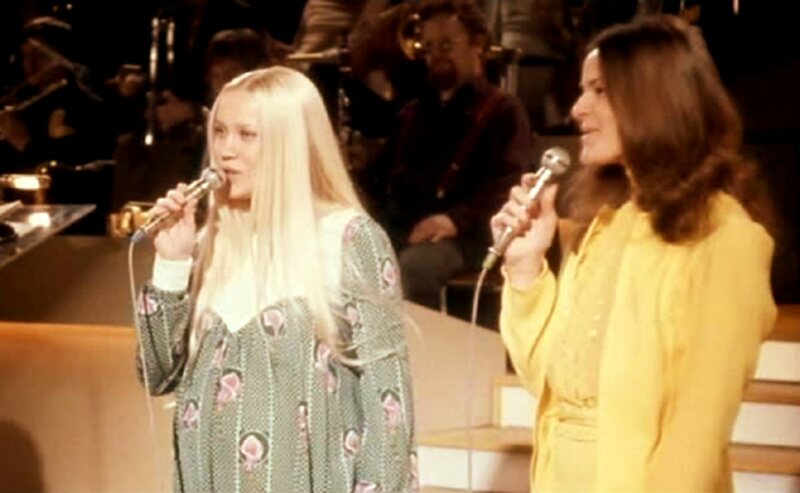 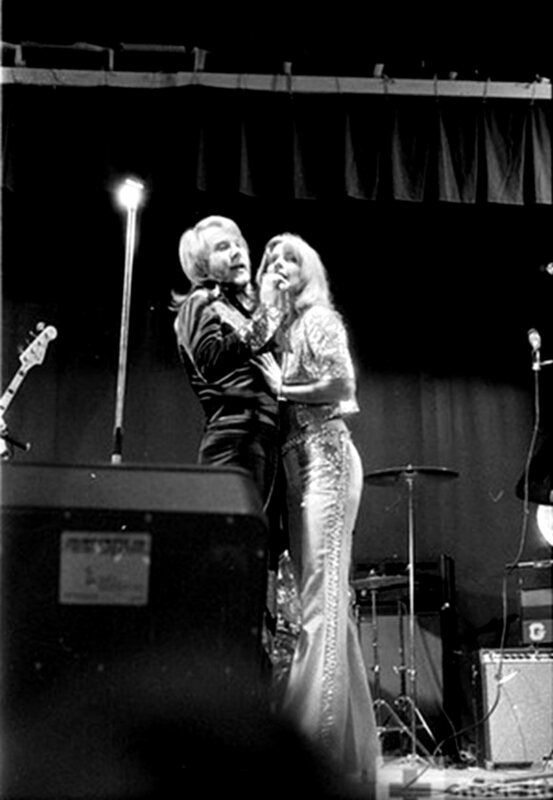 The Song Festival was held in Stockholm on 10 February 1973. 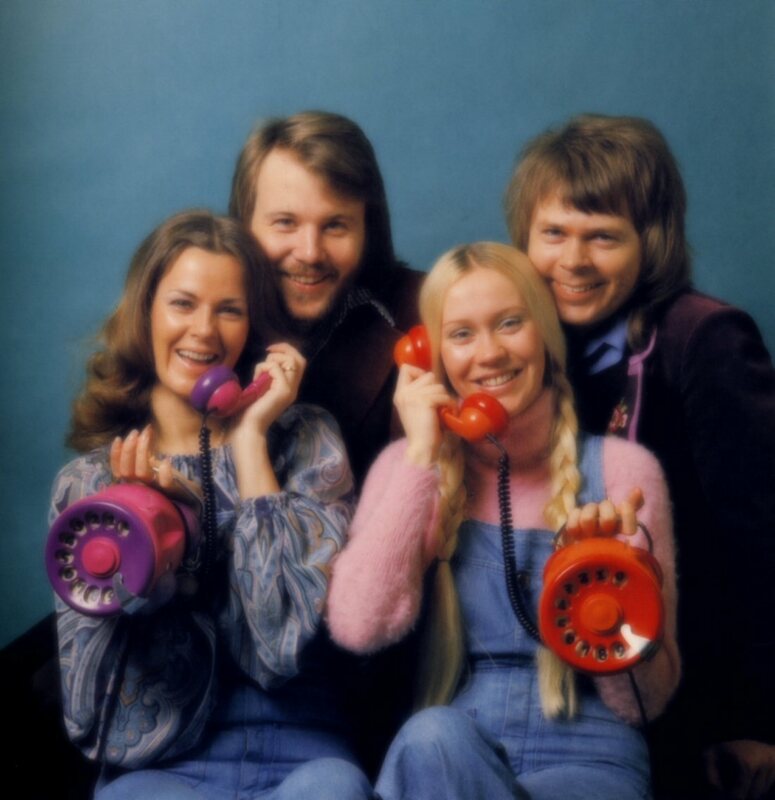 "Ring Ring" did not win and ending on #3 but it became a big hit in Scandinavia and a lot of countries in Europe. 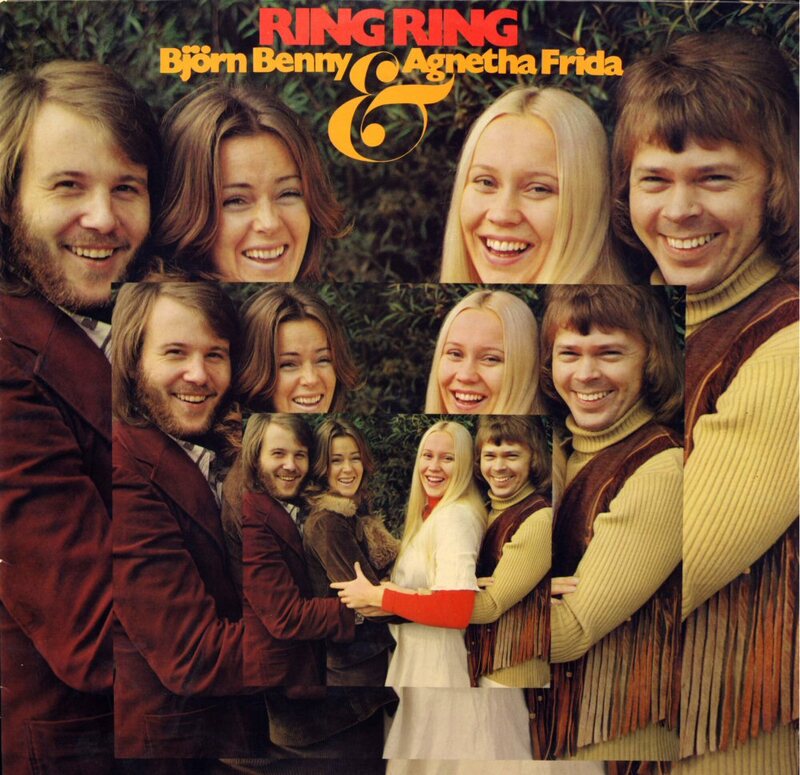 One of the most famous early photo sessions made especially for promotion of the single "Ring Ring". 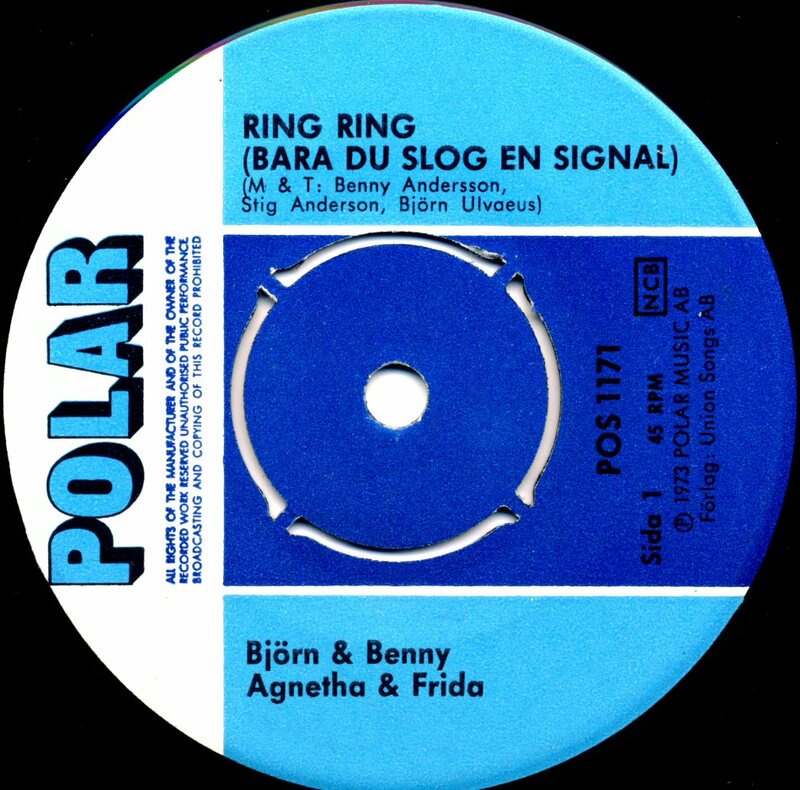 Polar Music released the single "Ring Ring" (Swedish version)/"Åh vilka tider" on February 14th, 1973 in Sweden. 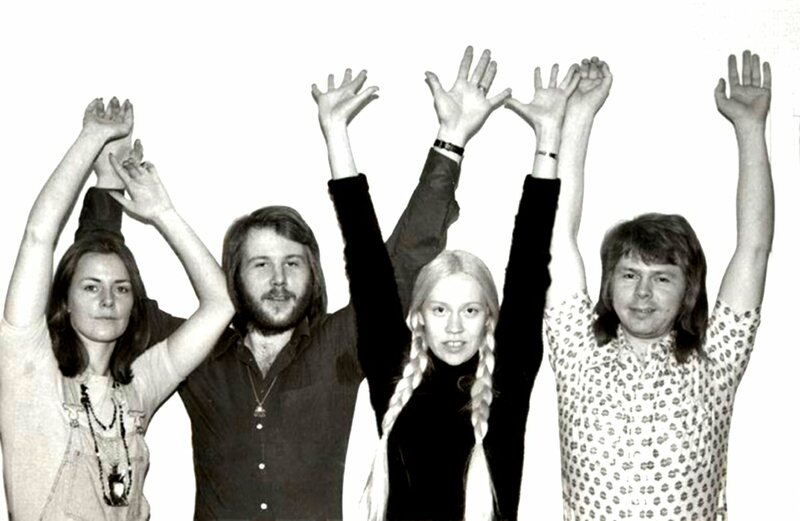 The single entered Svensktoppen on March 11th, 1973 at #1 where it stayed for 9 weeks. 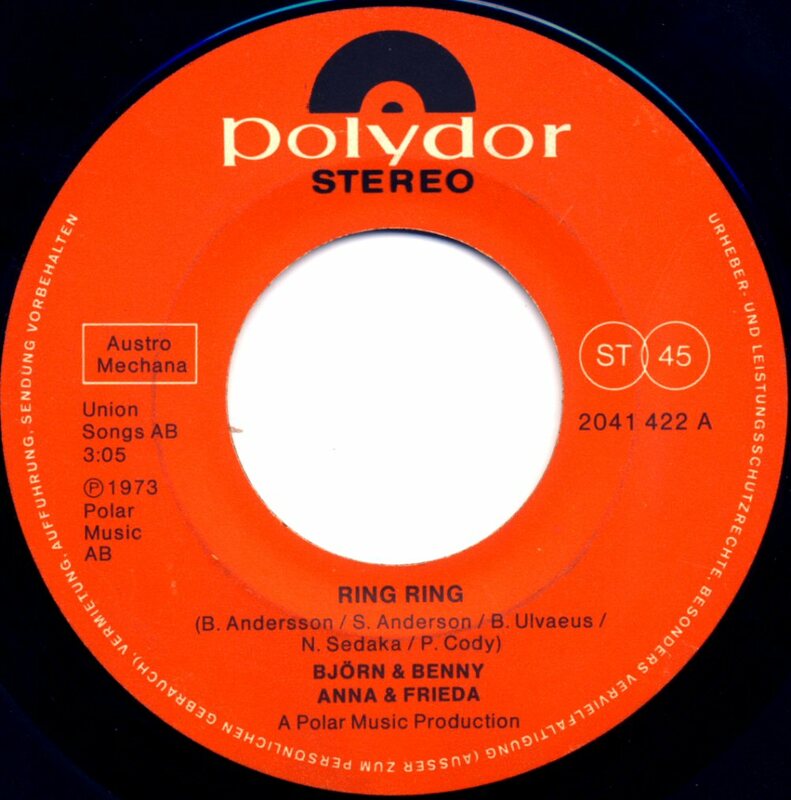 Totally "Ring Ring" stayed on the chart for 17 weeks (until July 8th, 1973). 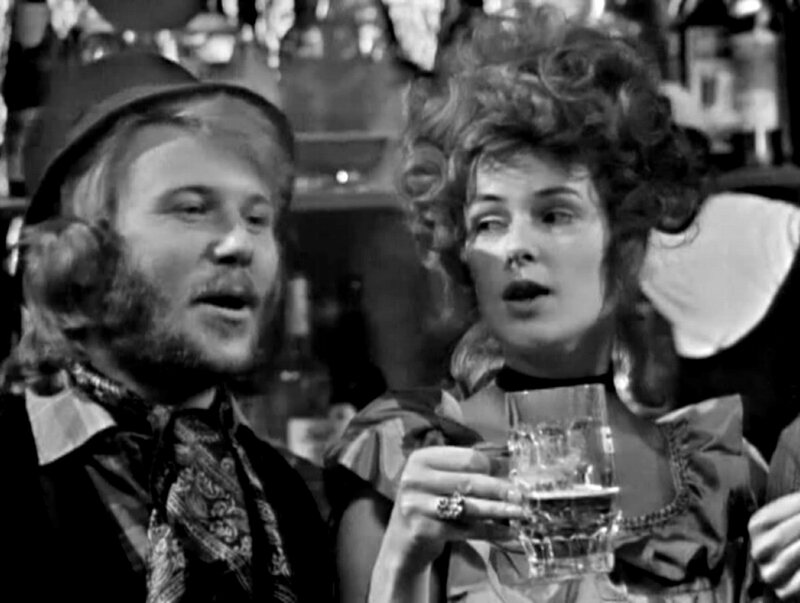 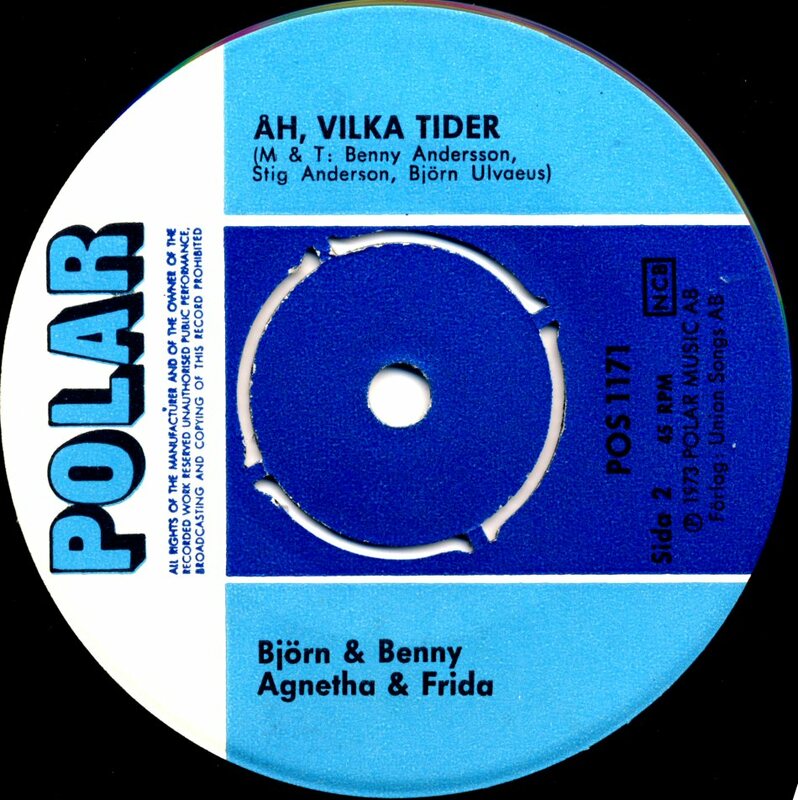 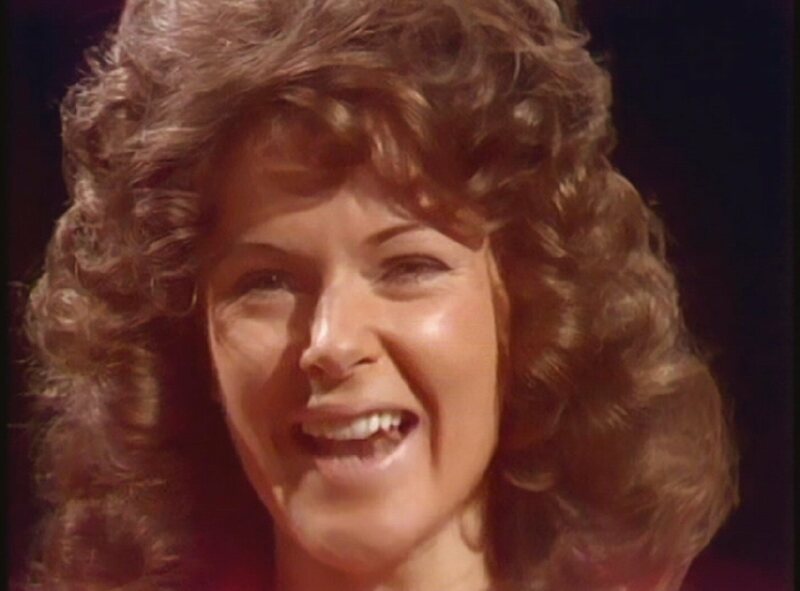 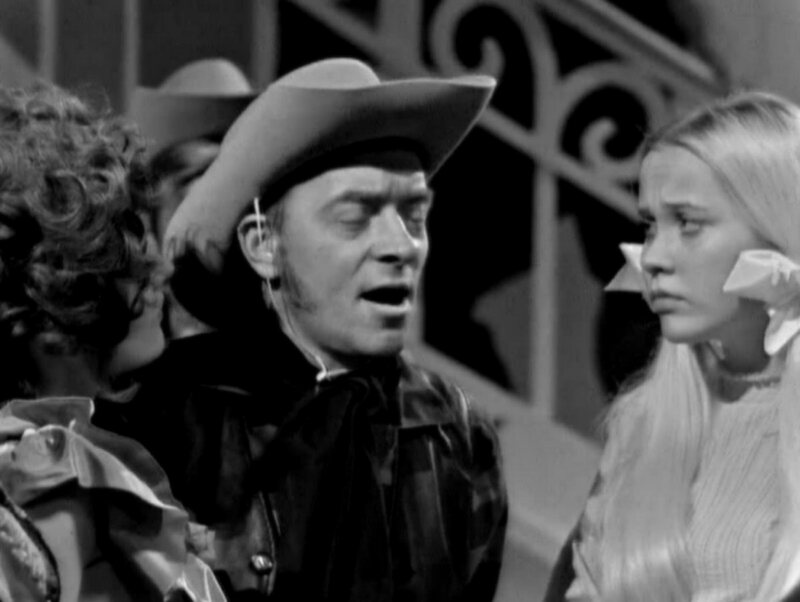 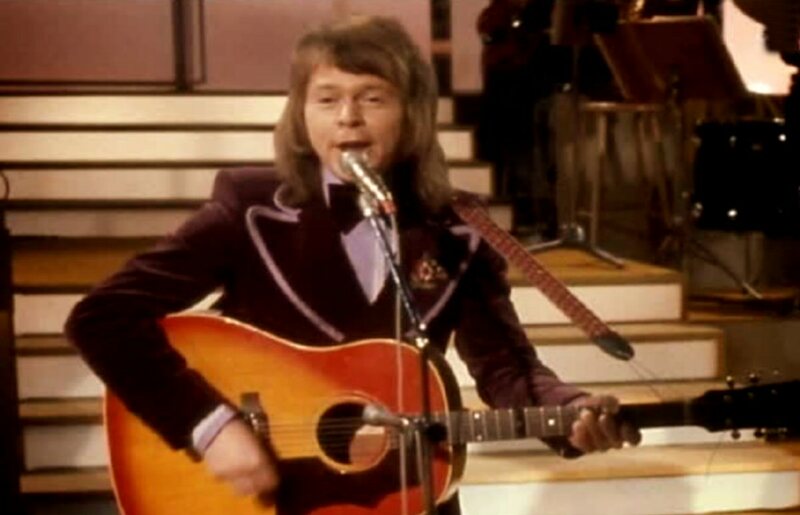 Even "Åh vilka tider" entered Svensktoppen on April 29th, 1973 and stayed there for 5 weeks. 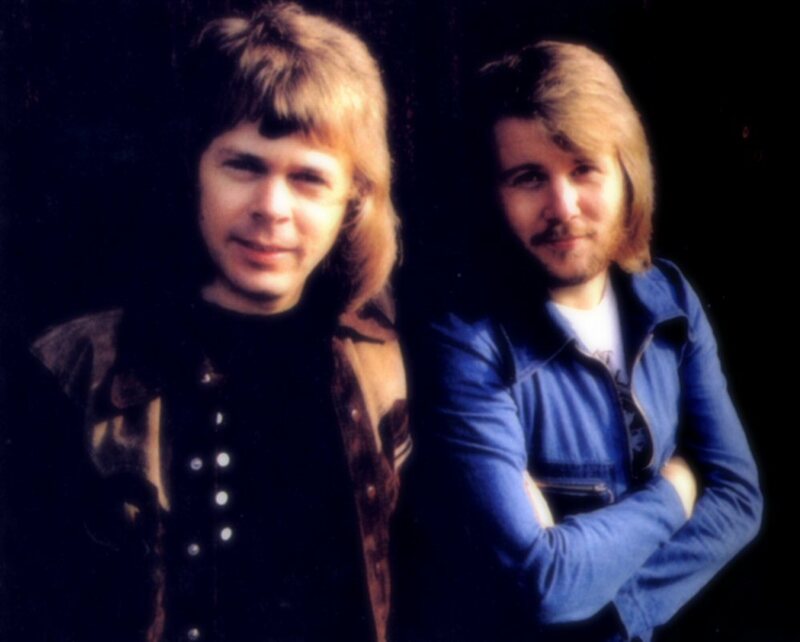 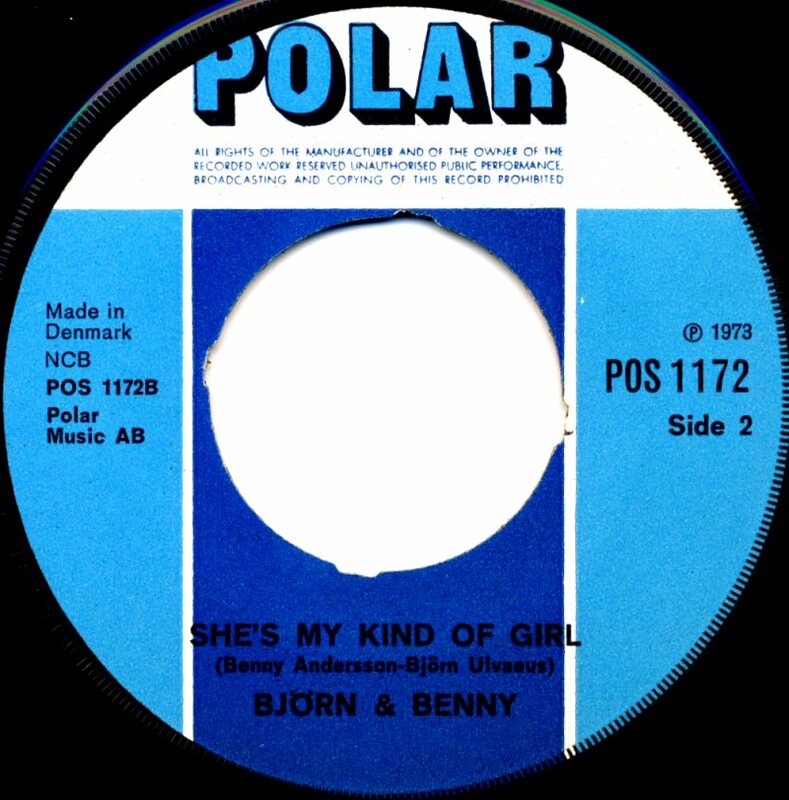 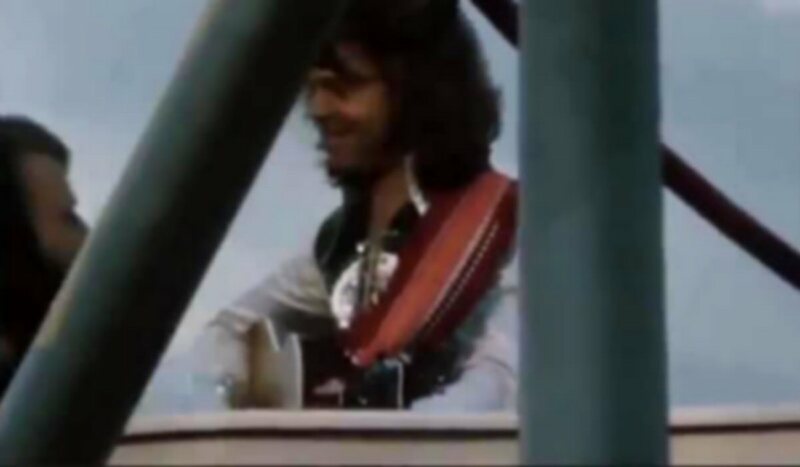 The English version of "Ring Ring" with "She's My Kind Of Girl" credited only to Björn and Benny on the B-side was released on February 19th, 1973 in Sweden and other Scandinavian countries. 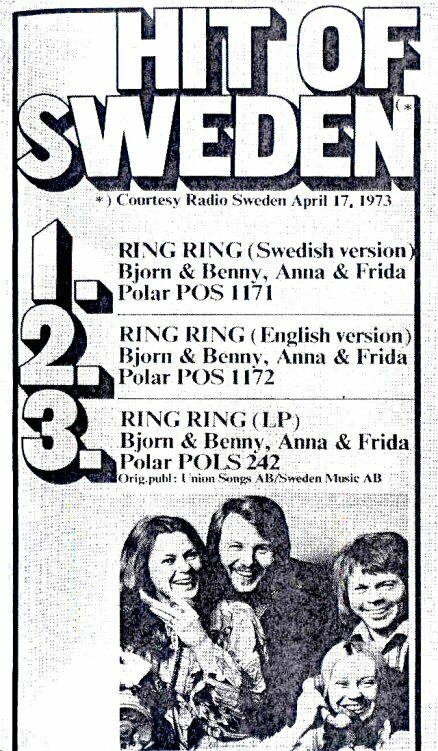 In Sweden the English version of "Ring Ring" entered the chart on March 20th, 1973 where it stayed for 8 weeks peaking at #2. 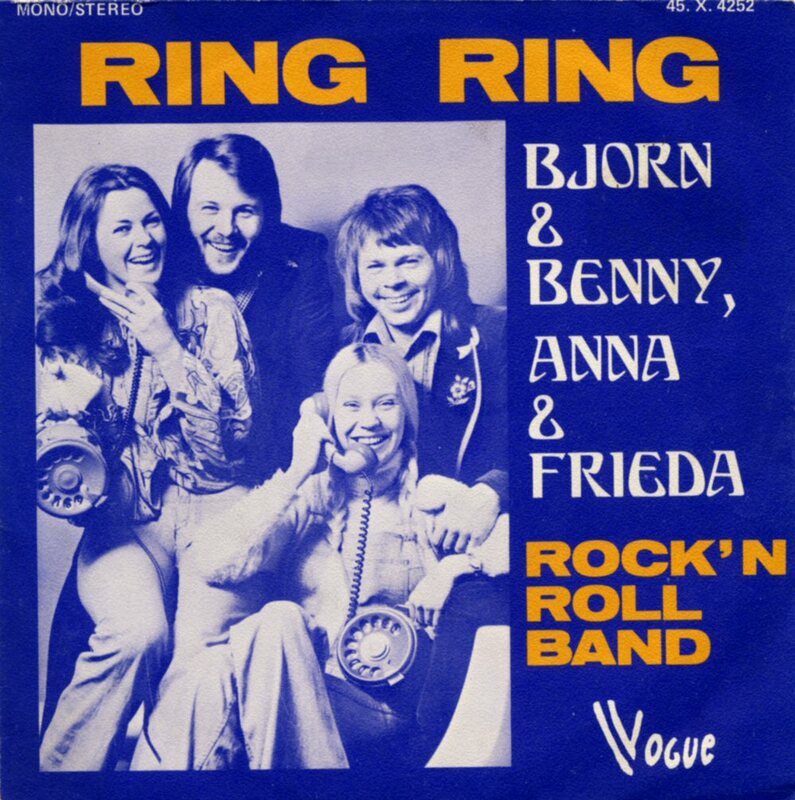 In Norway "Ring Ring" started its chart life on April 11th, 1973 and stayed there for 19 weeks peaking at #2. 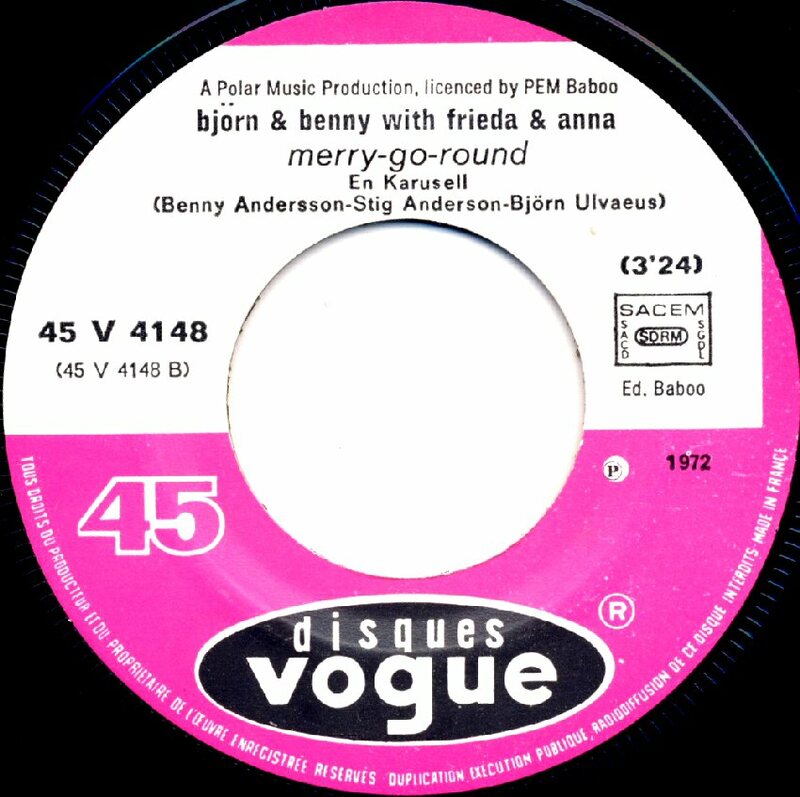 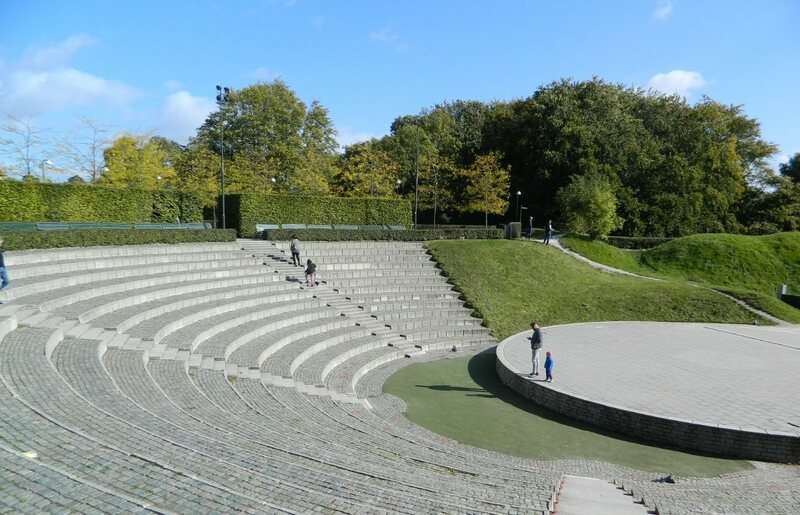 The single was successful in Denmark as well. 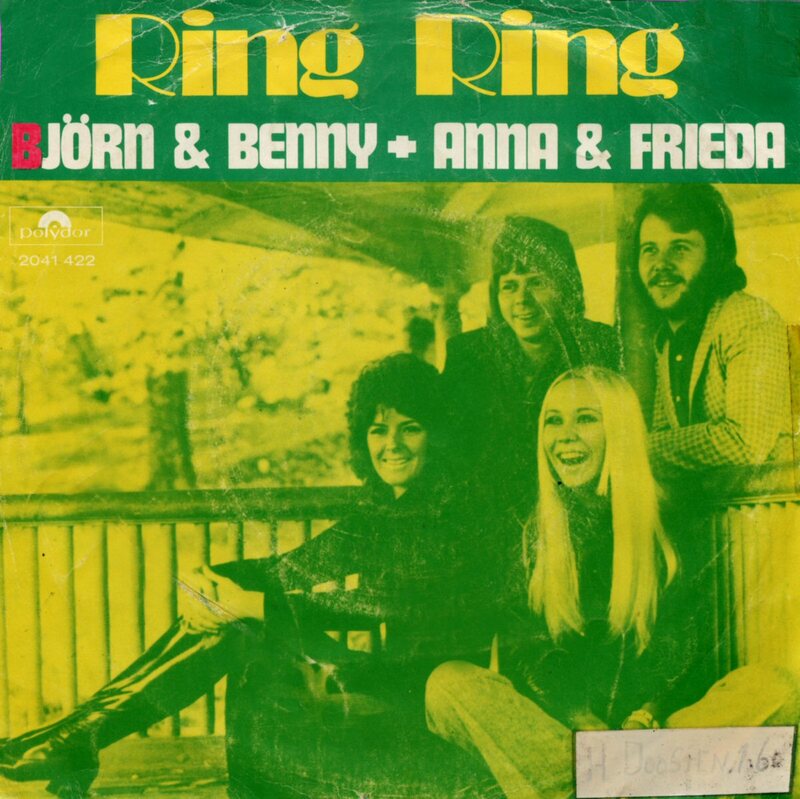 "Ring Ring" did not manage to enter the West German chart but it became #2 in Austria. 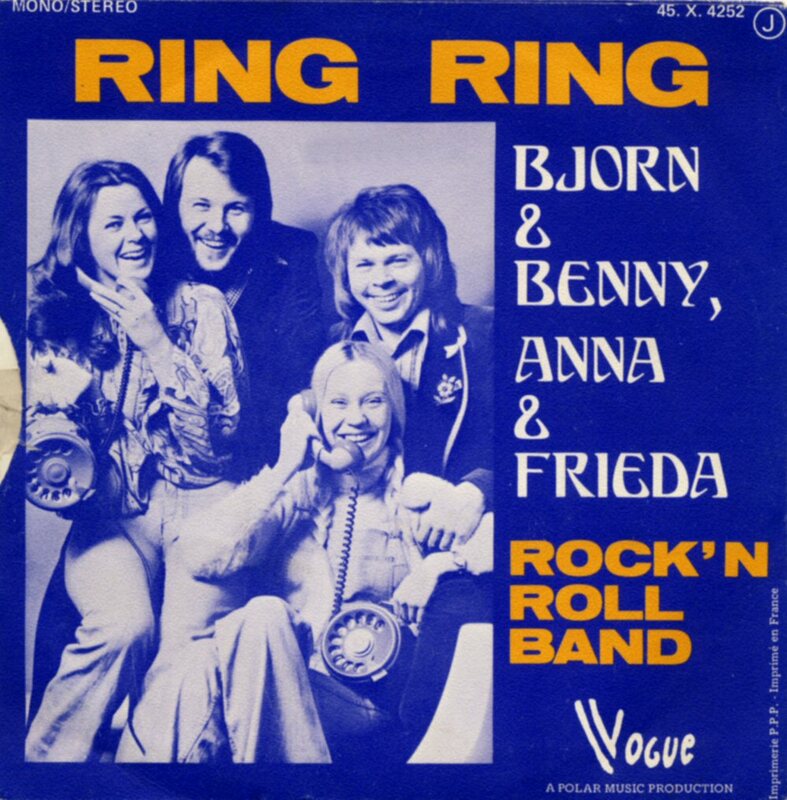 In Holland "Ring Ring" entered the single chart on June 23rd, 1973 where it stayed for 8 weeks peaking at #5. 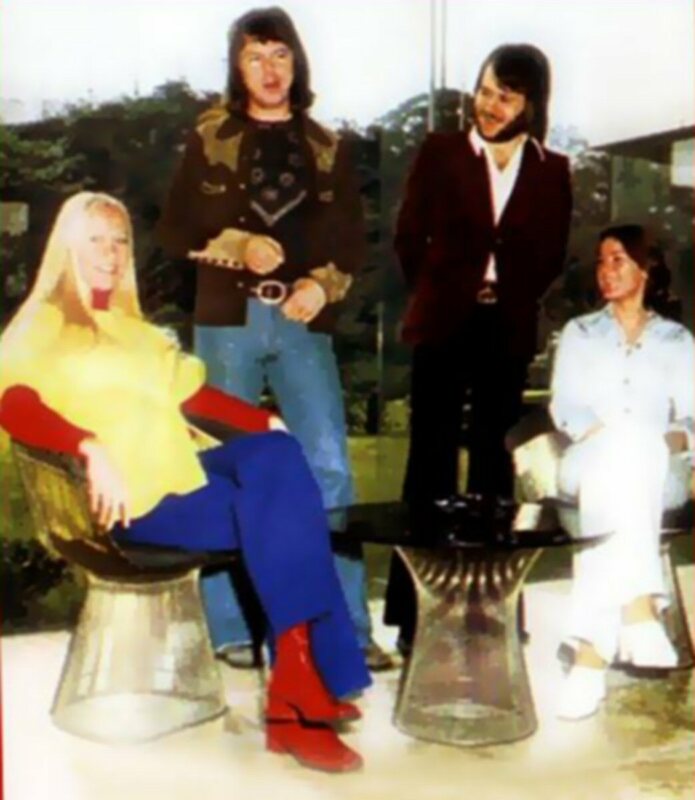 The single was released even in Mexico but it did not enter the chart there. 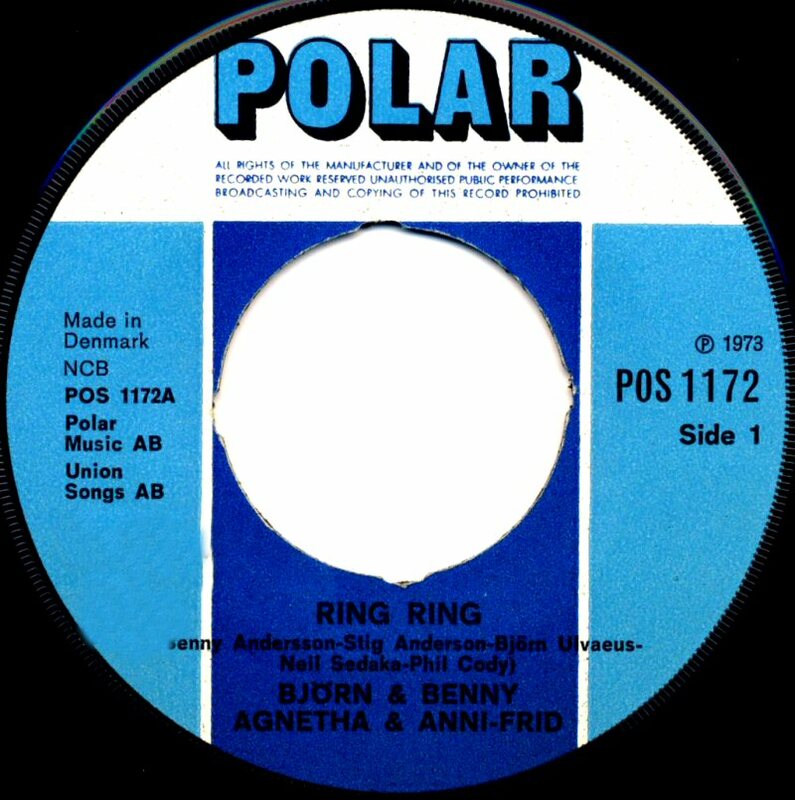 In South Africa "Ring Ring" was #3 and in Zimbabwe #12. 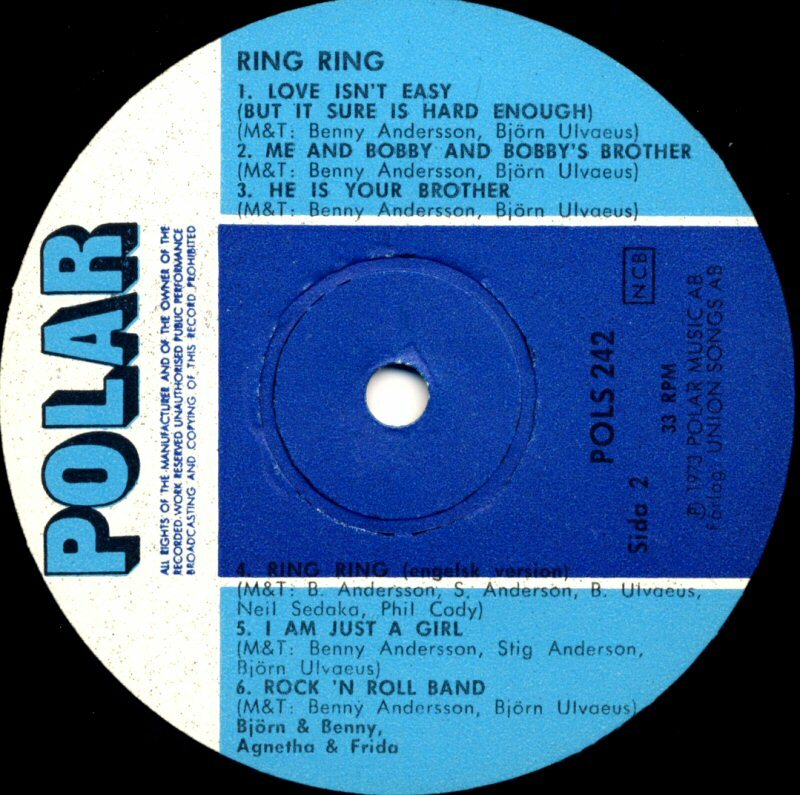 The Japanese release of "Ring Ring" with "I Am Just A Girl" on the flipside did not enter the single chart. 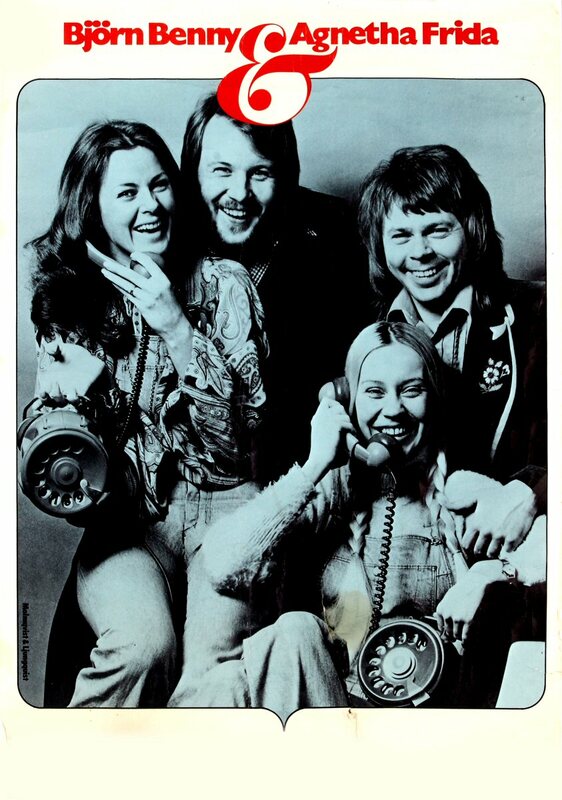 Even Australia was not ready for the group yet and "Ring Ring" ended at #92. 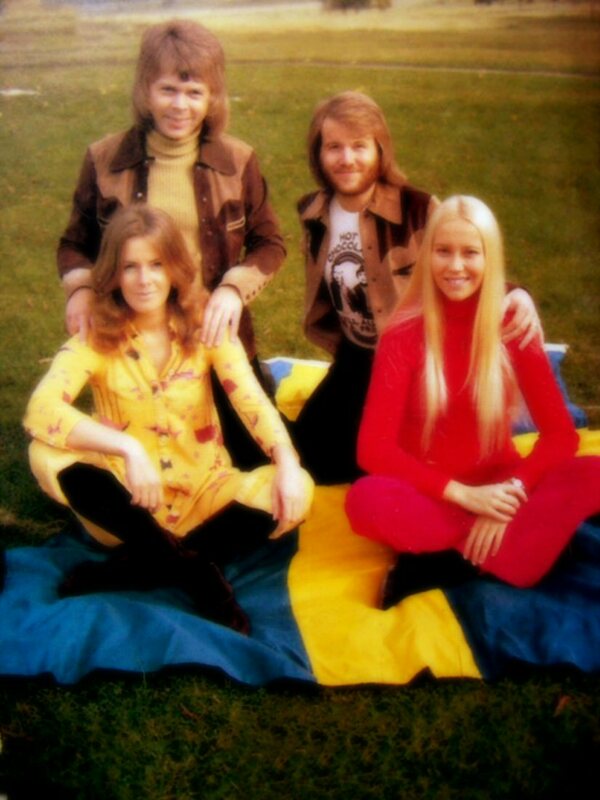 The Polydor cover featured the photo from the session taken outside the TV tower "Kaknästornet" in Stockholm. 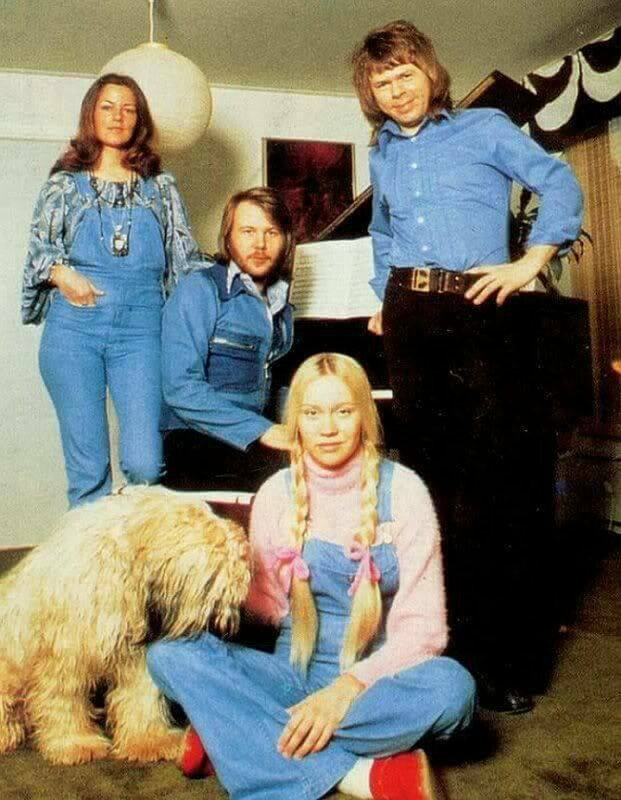 One of the early ABBA sessions taken in 1972. 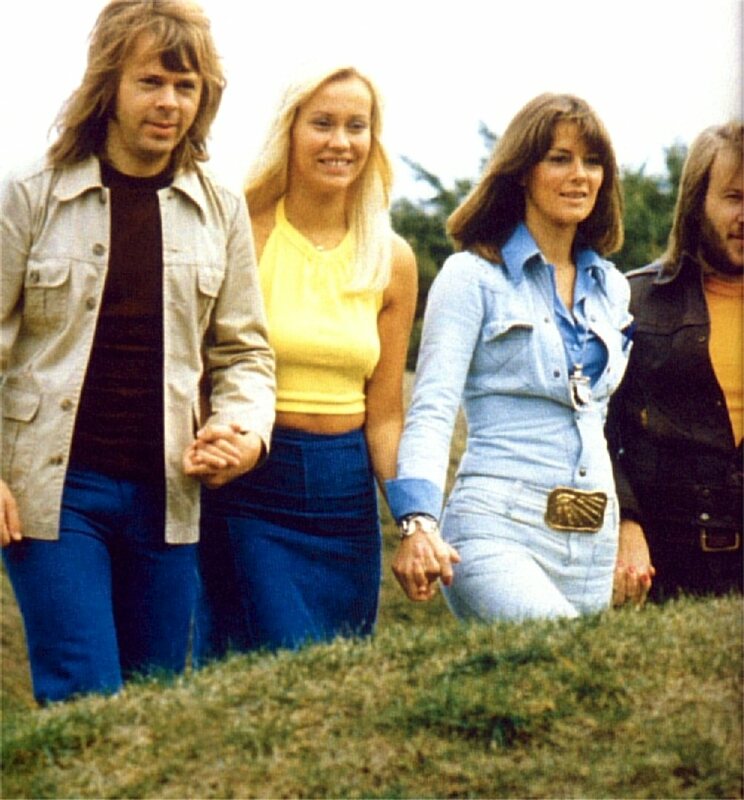 See even ABBA related places. 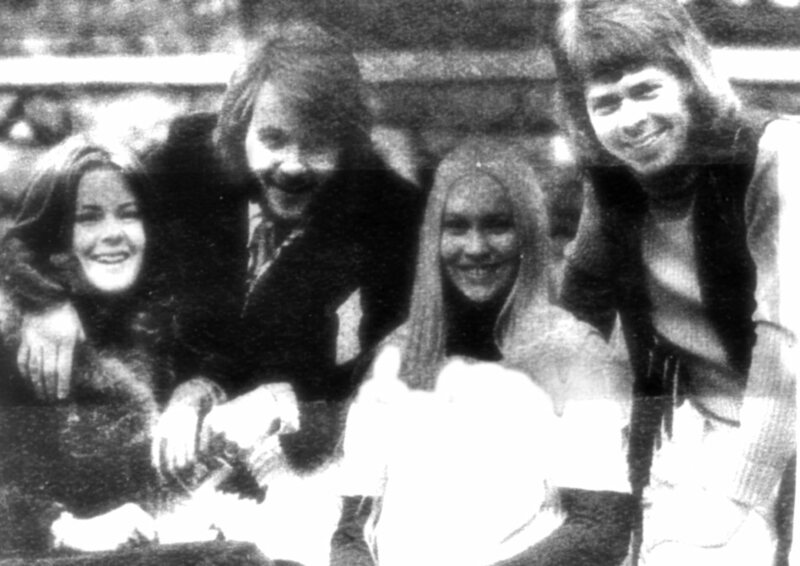 Björn, Benny, Frida and... Inger Brundin went on the promotional tour in the middle of March 1973. 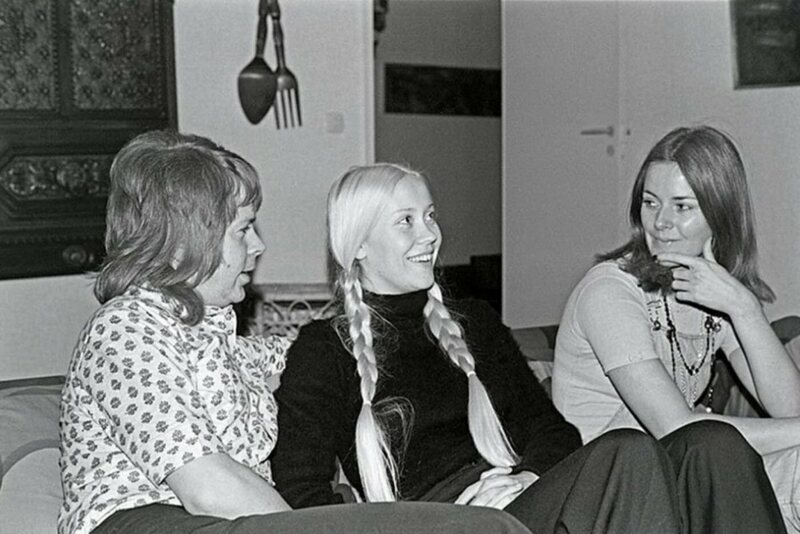 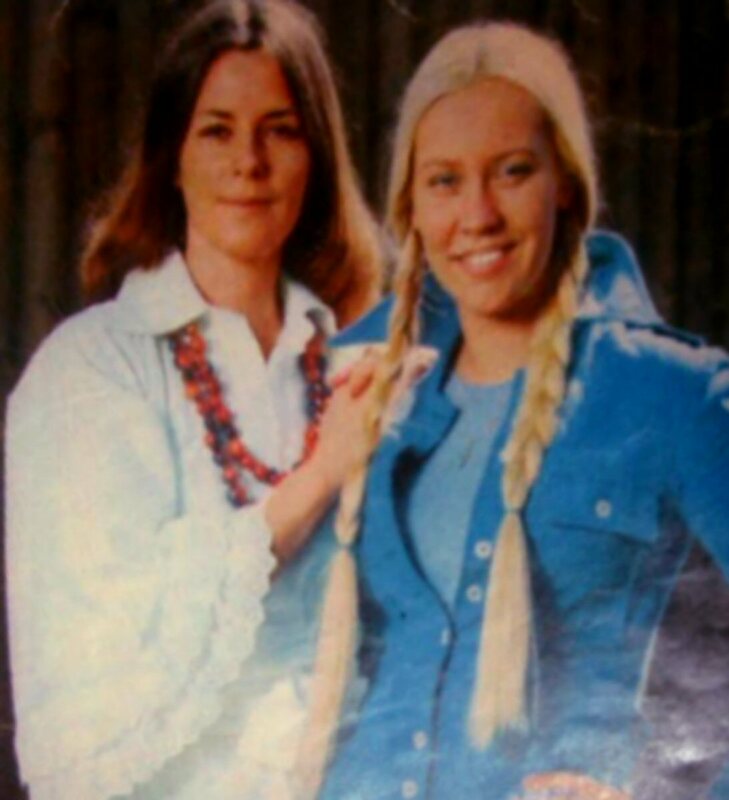 Agnetha did not participate because of her first days as mother to little Linda. 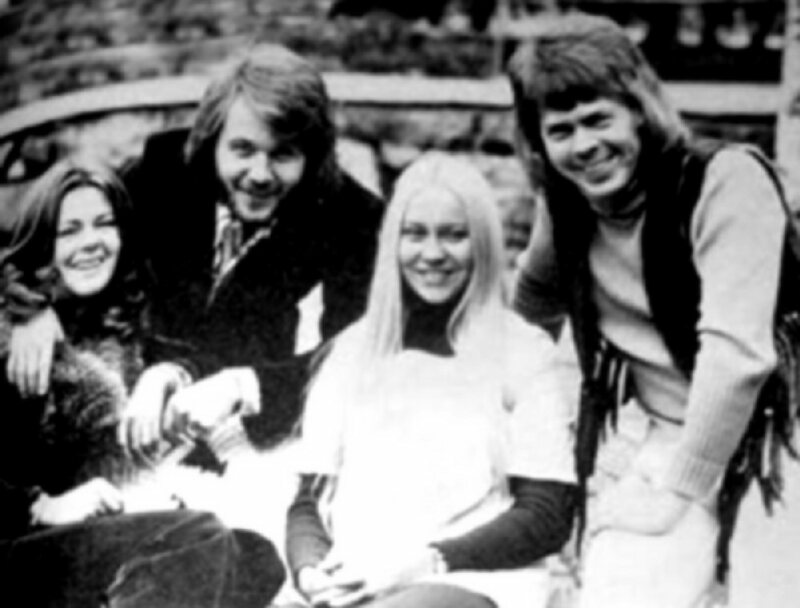 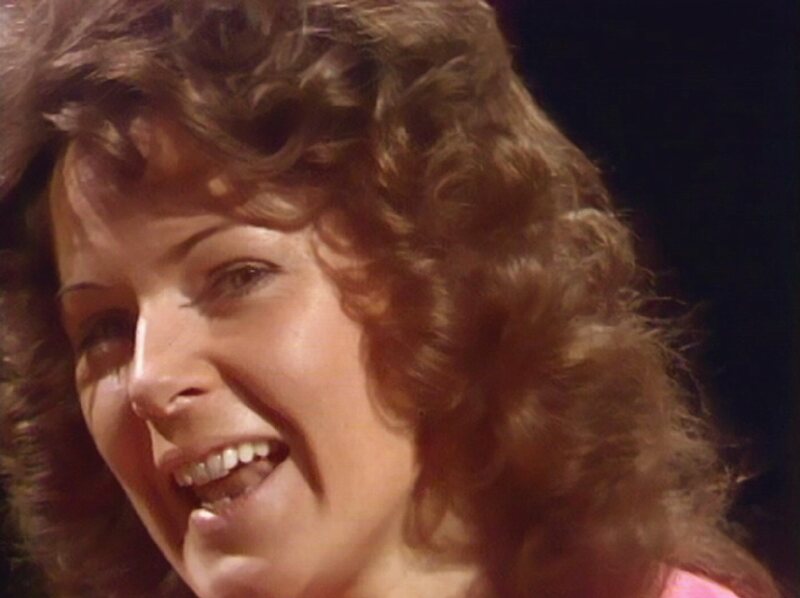 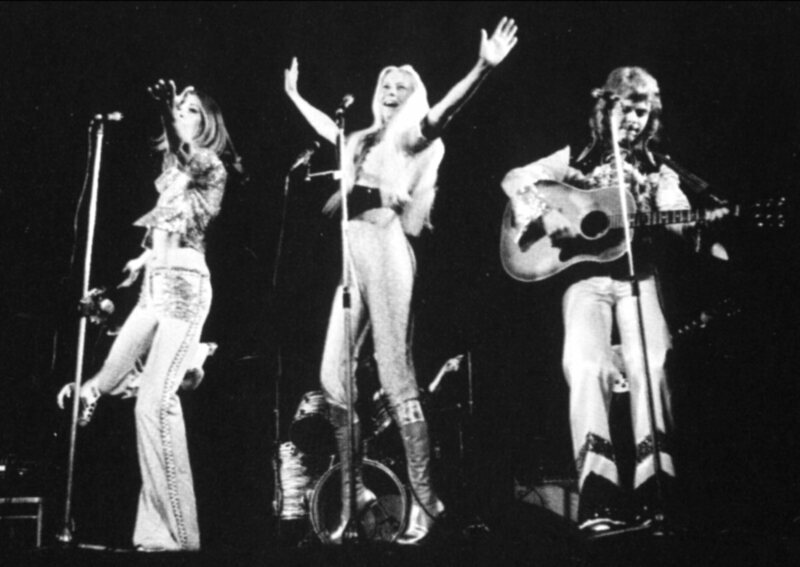 The group was unknown in Europe and it was not so big problem to have a stand-in for Agnetha so Inger pretended to be the other female singer in the group. 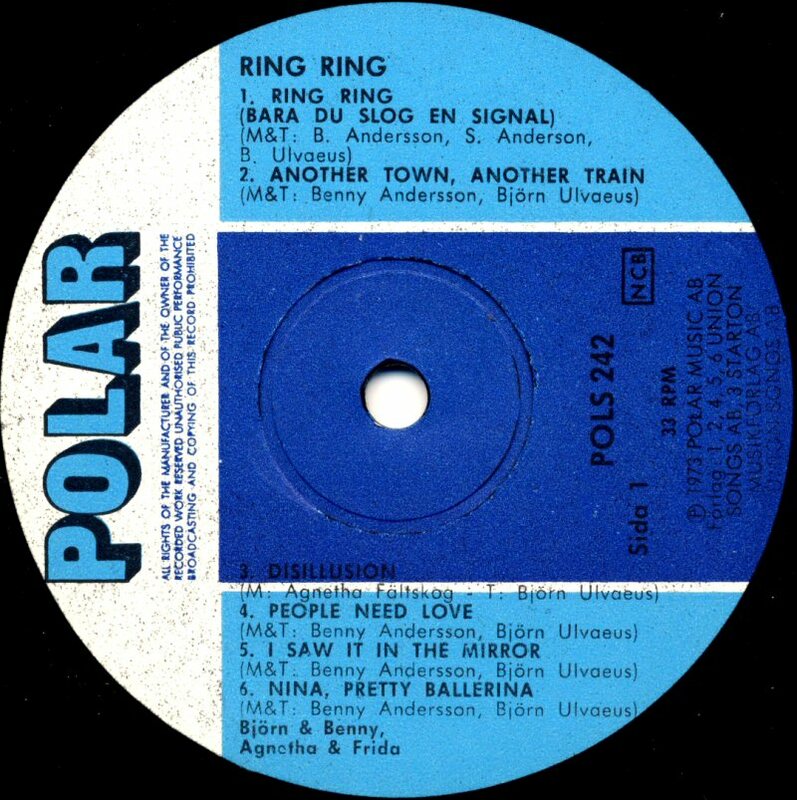 They did promotion for their forthcoming album performing (of course not live) "People Need Love" and "Ring Ring". 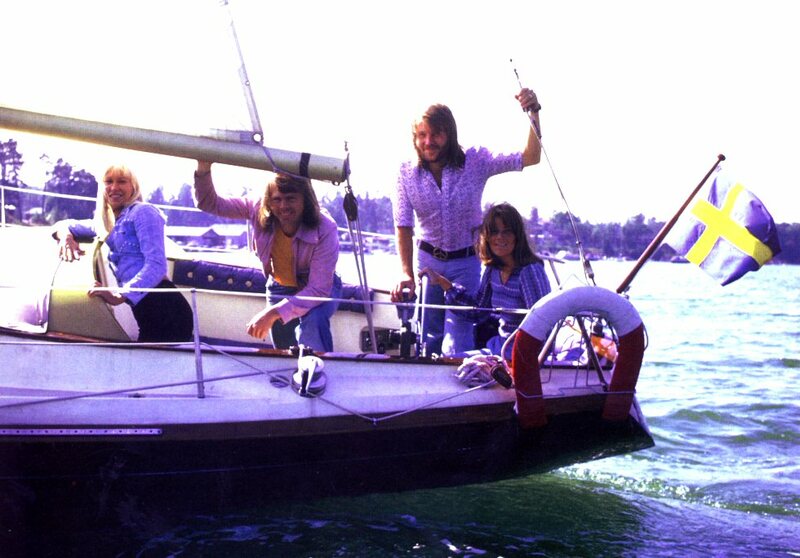 The trip went through West Germany, Austria, Holland and Belgium. 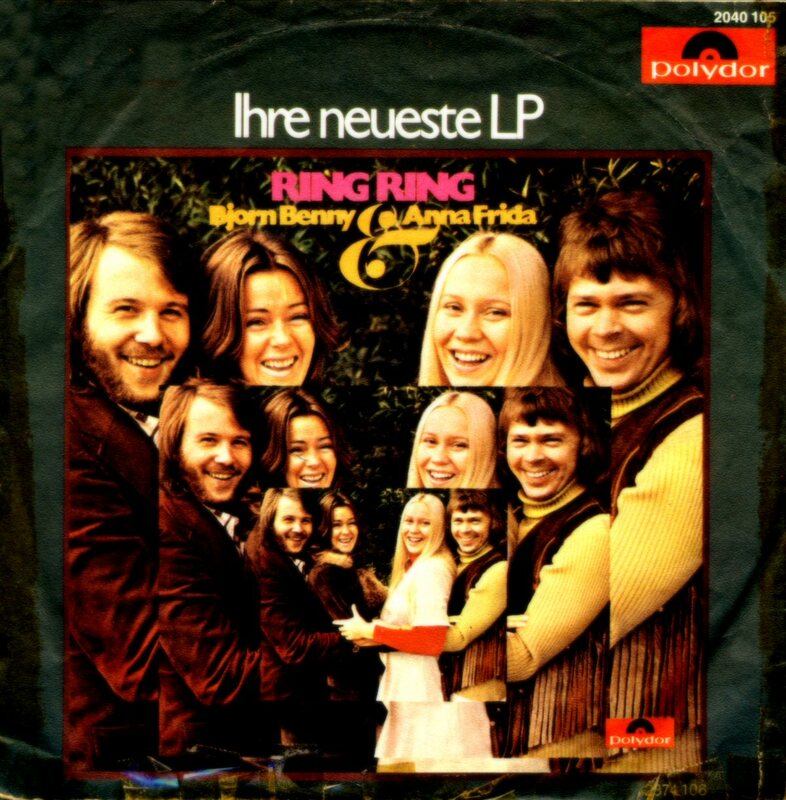 The first album entitled "Ring Ring" was released by Polar Music on 26 March 1973. 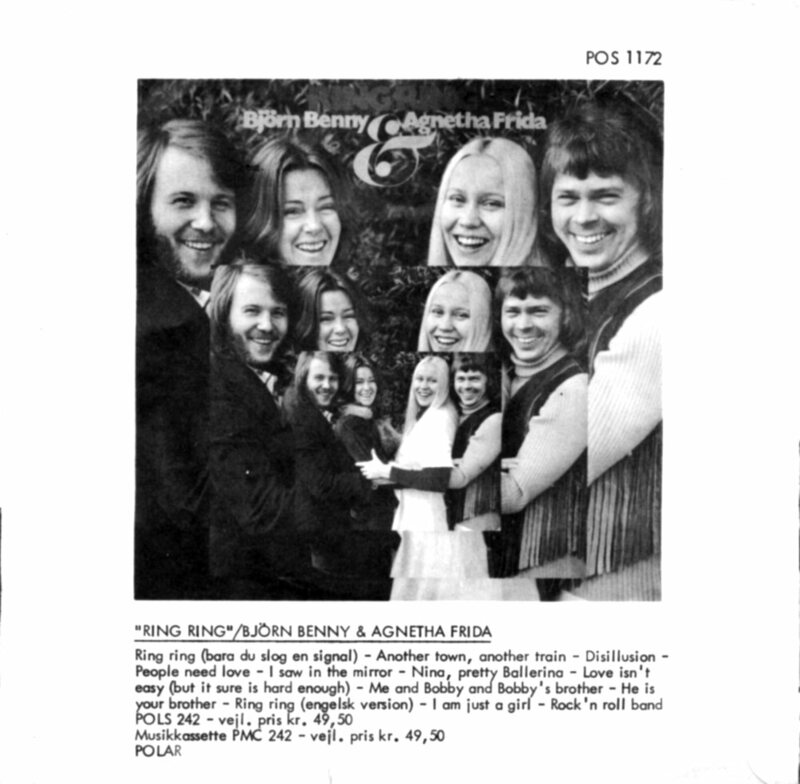 It included some already well-known hits as "People Need Love" and "He Is Your Brother" as well as some upcoming singles "Love Isn't Easy", "Nina Pretty Ballerina" and of course the title song "Ring Ring" in two language versions: Swedish and English. 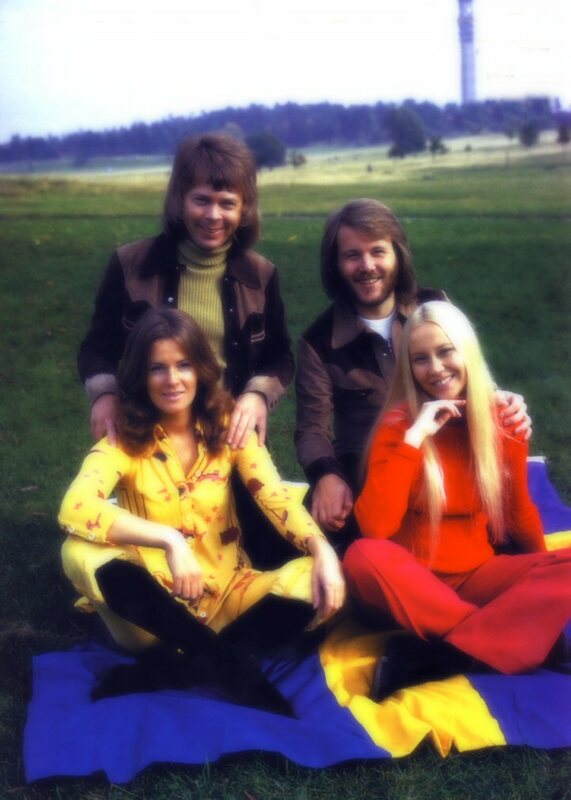 The album was good enough to be promoted internationally but it was no "real" ABBA yet. 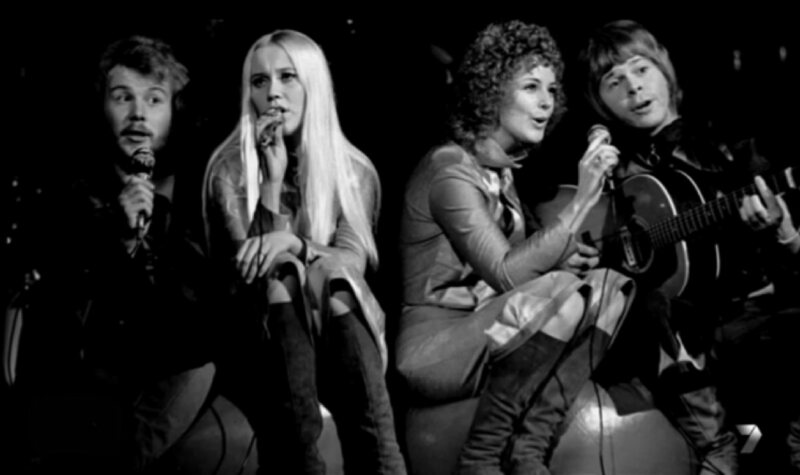 The songs were a mixture of all possible trends. 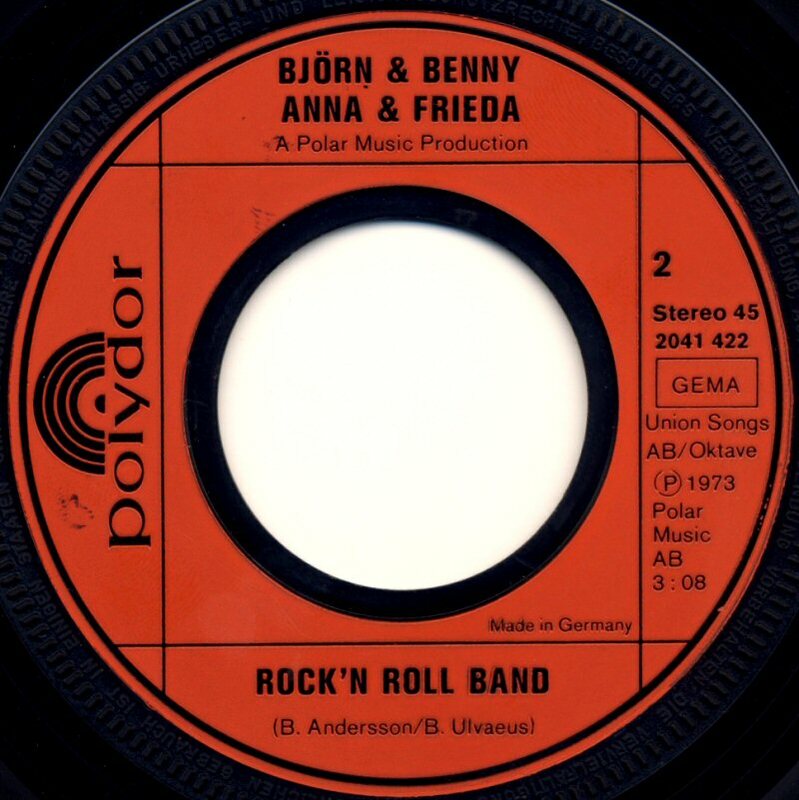 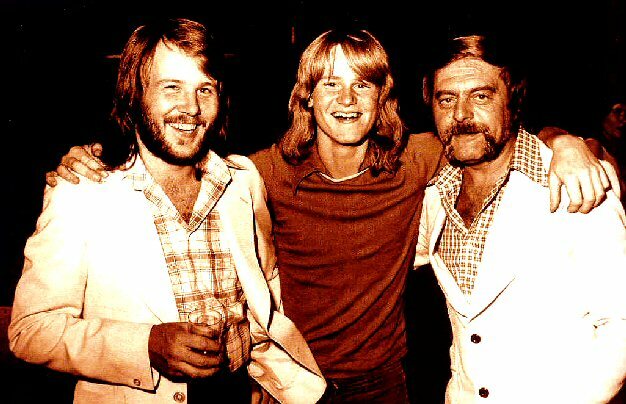 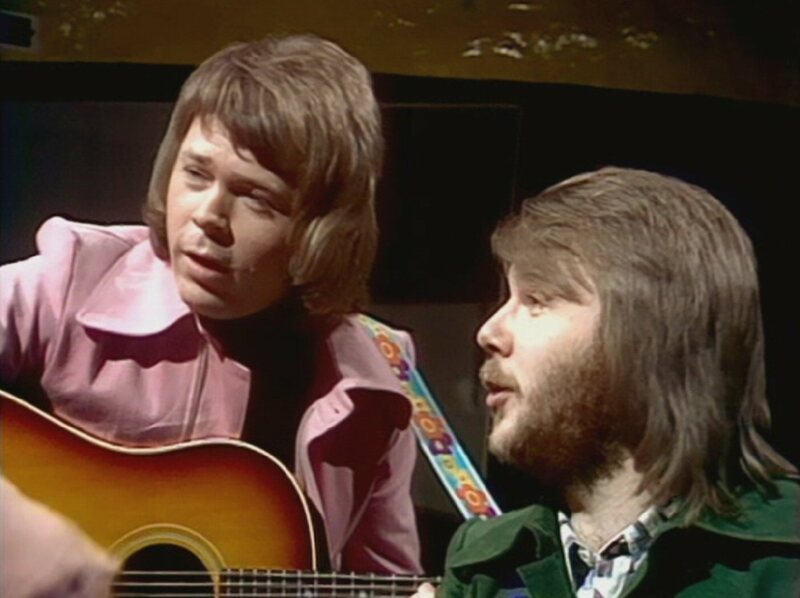 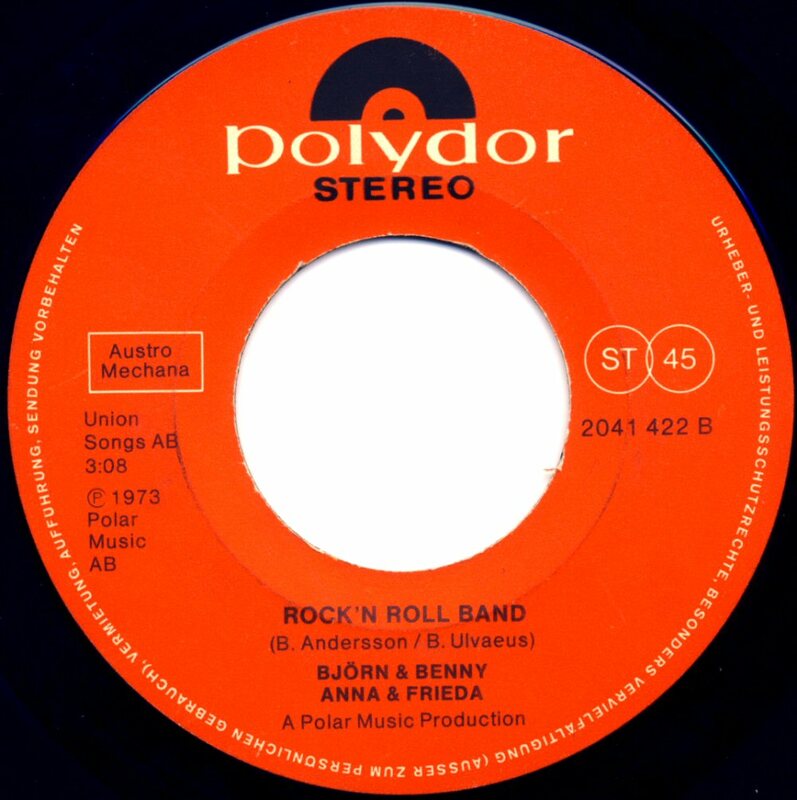 It was quite easy to recognize which songs had been planned for Björn and Benny's second album if you listen to "I Saw It In The Mirror" or "Rock'n'Roll Band". 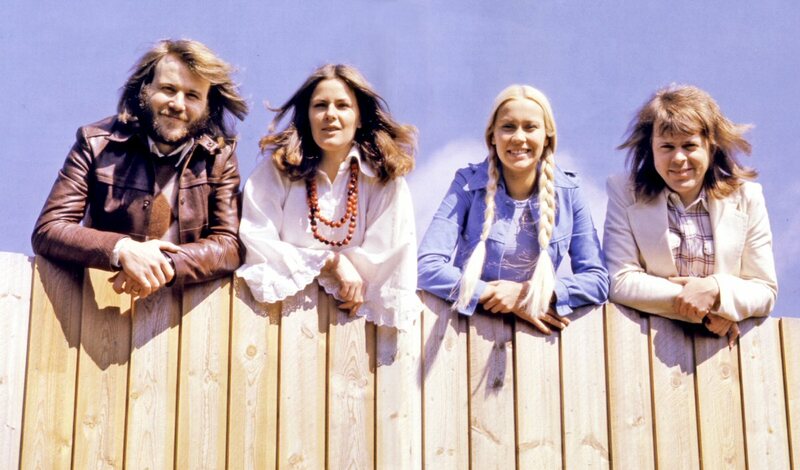 The latter one was in fact performed live on their tours with lead vocals sung by Frida. 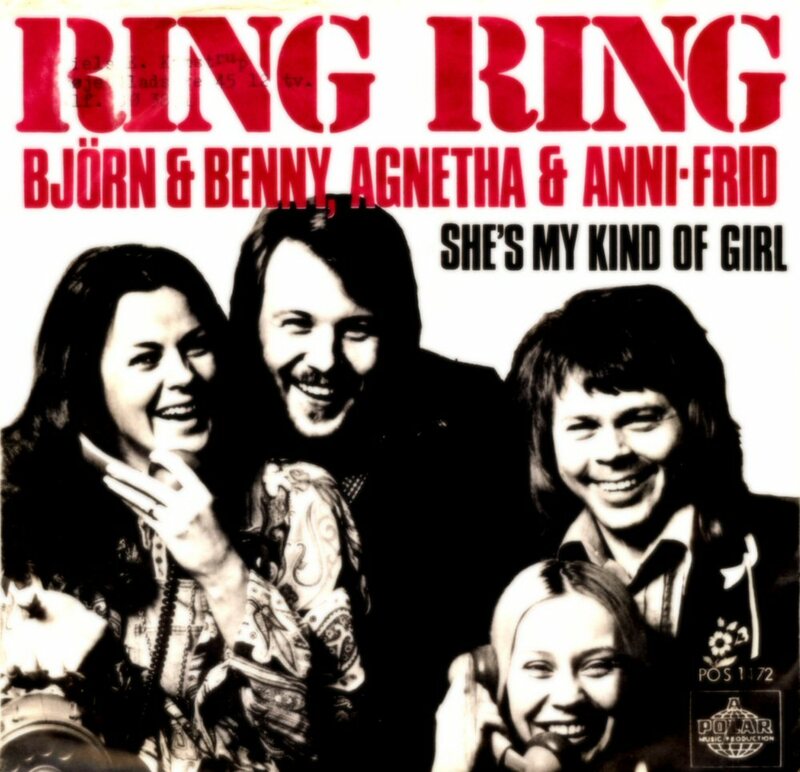 The old-fashioned sounding "I Am Just A Girl" was maybe an early version of the future success tunes as "I Do I Do I Do...", "Hasta Manana" and "I've Been Waiting For You". 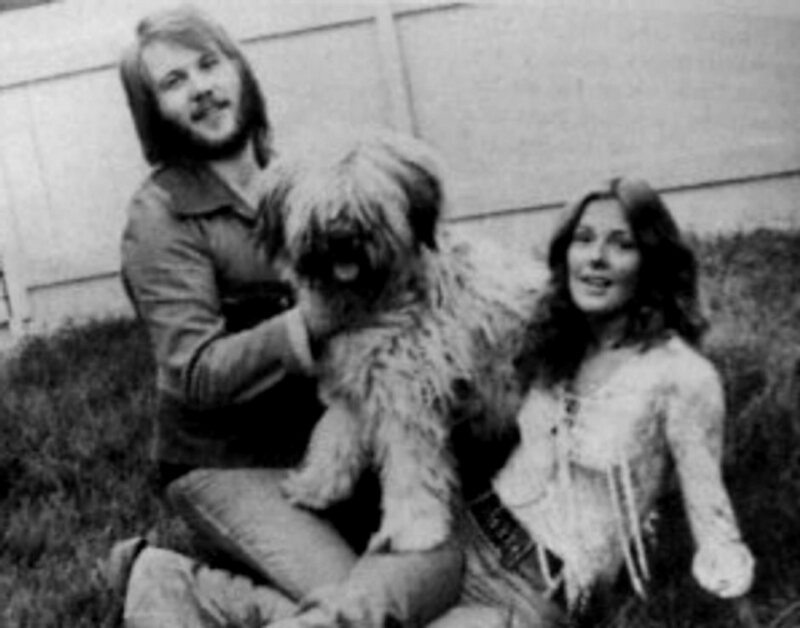 Three songs that had a big potential were "Nina, Pretty Ballerina", "Another Town Another Train" and "Love Isn't Easy" and they would be released as singles in other countries in Europe. 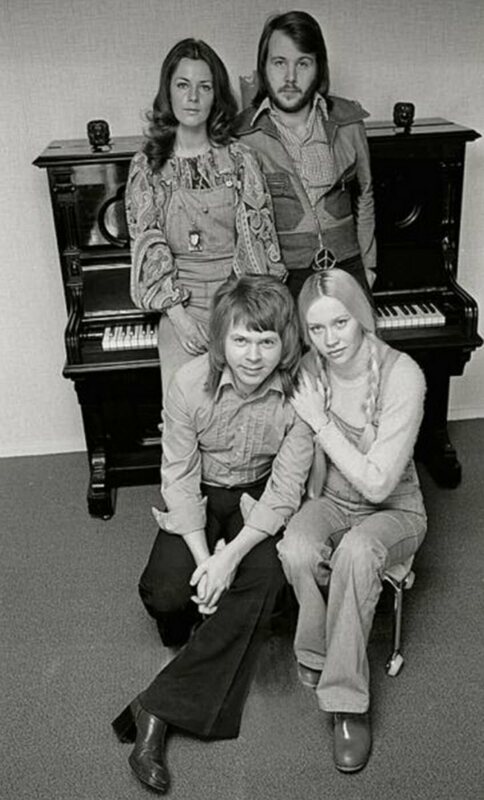 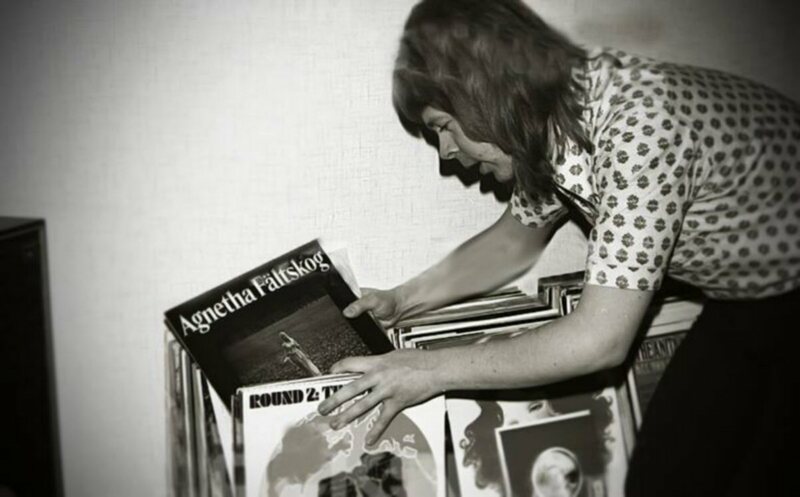 Agnetha contributed for the first and last time during the ABBA period with her own composition "Disillusion" (released as "Mina ögon" earlier on one of her solo LPs) and Frida sang leadvocal on the quite underestimated "Me And Bobby And Bobby's Brother". 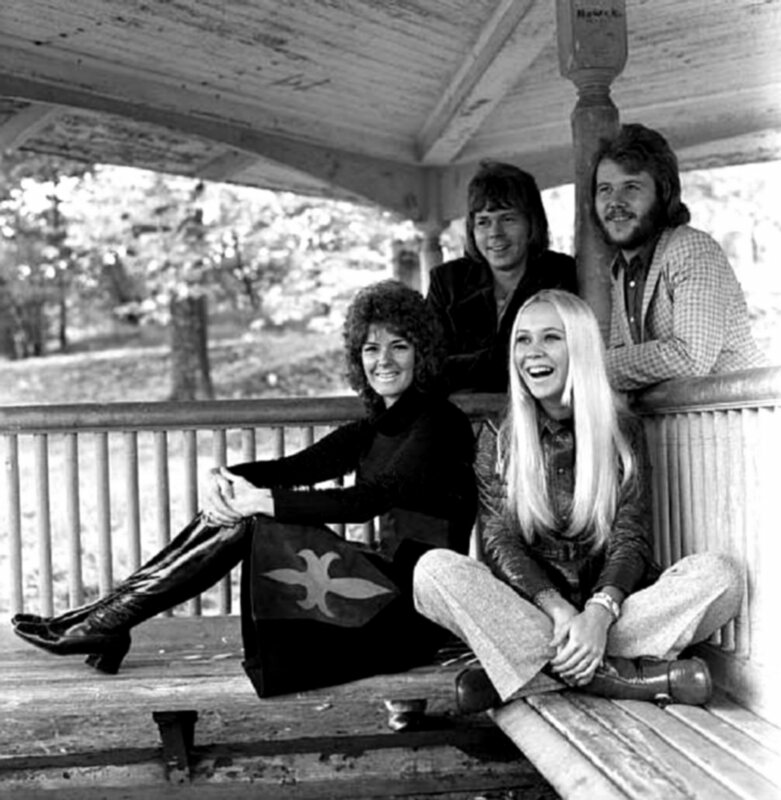 The new single release featured "Love Isn't Easy" with "I Am Just A Girl" on the B-side. 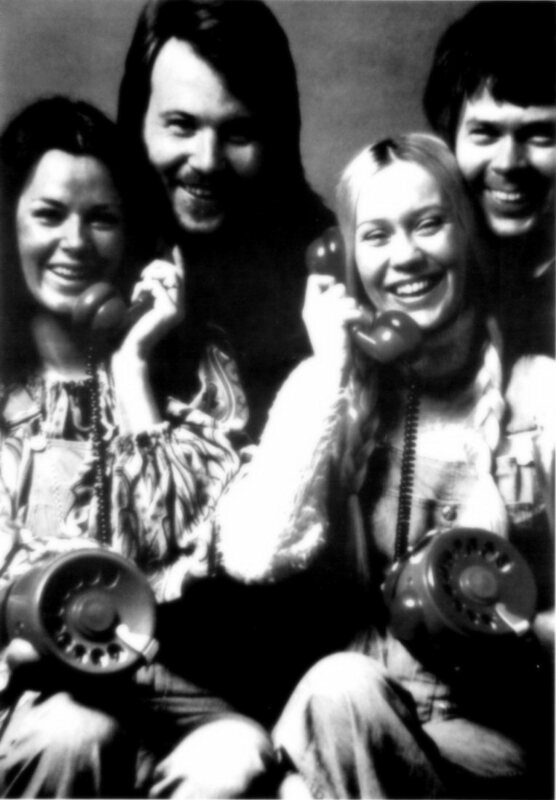 The SP was released in Sweden in April 1973 and in the other Scandinavian countries in June. 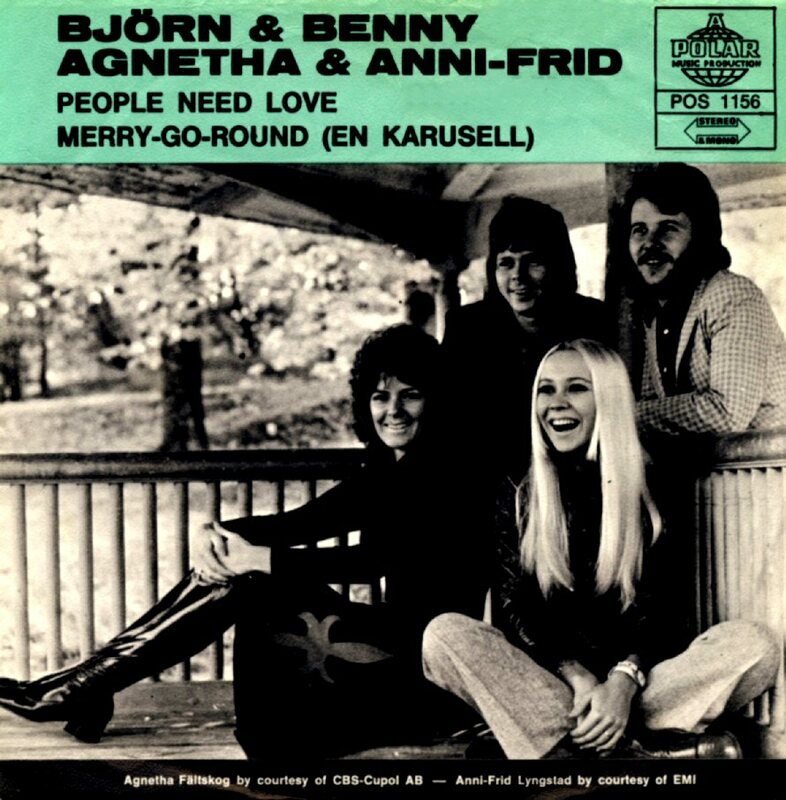 The single reached #3 on the Swedish chart. 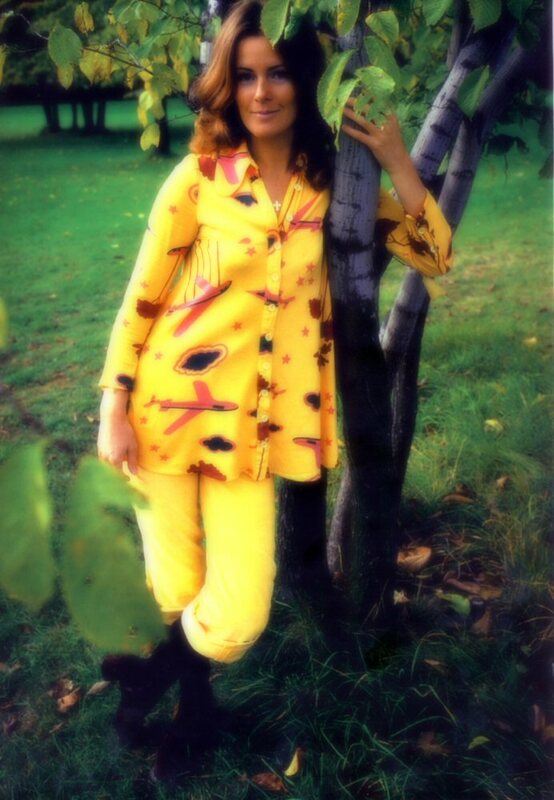 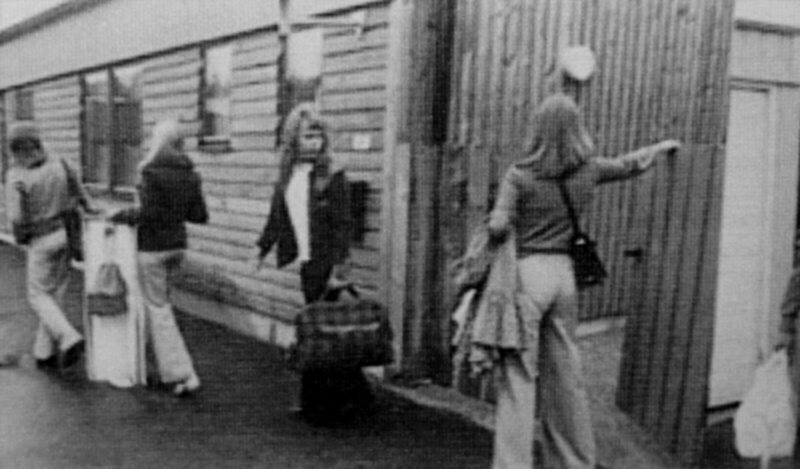 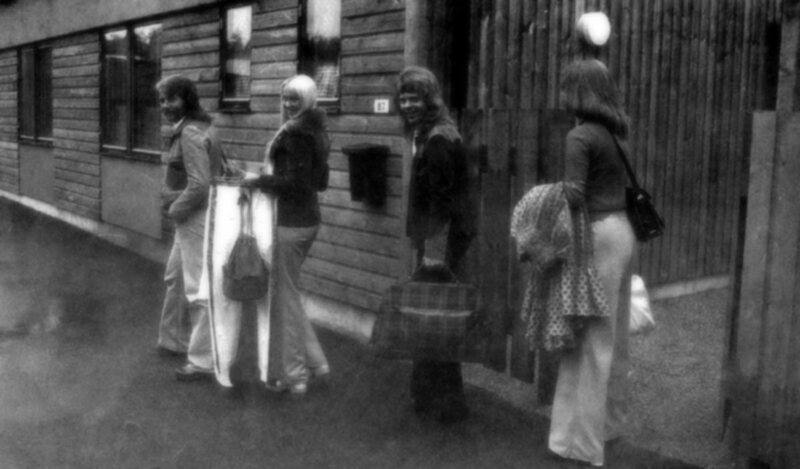 Several photo sessions were taken during different periods in 1972-1973 in Vallentuna outside Stockholm where the ABBA members lived by that time. 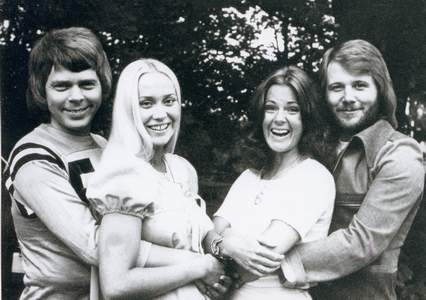 Stikkan tried to promote the album in Scandinavia and in Europe. 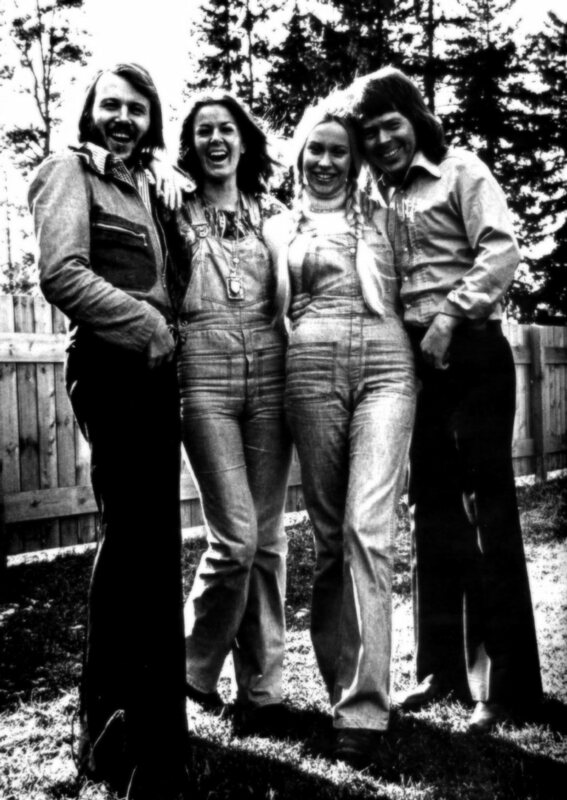 One of the first countries that ABBA made a promotional trip to was Denmark. 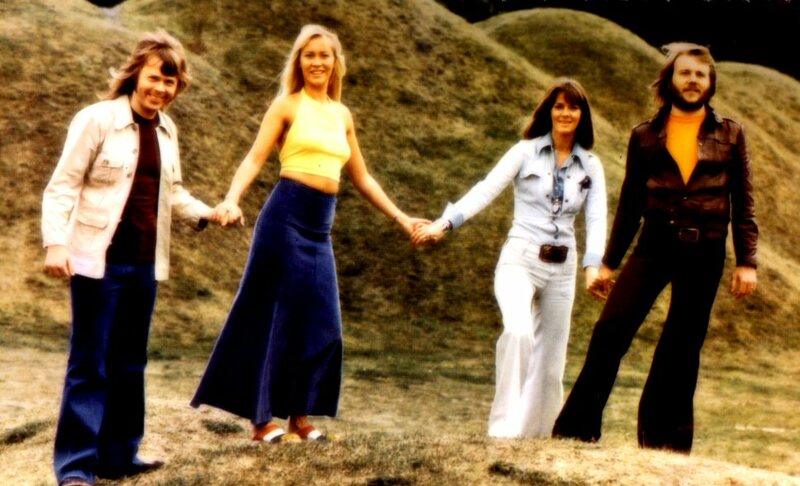 The foursome went to Denmark in June 1973. 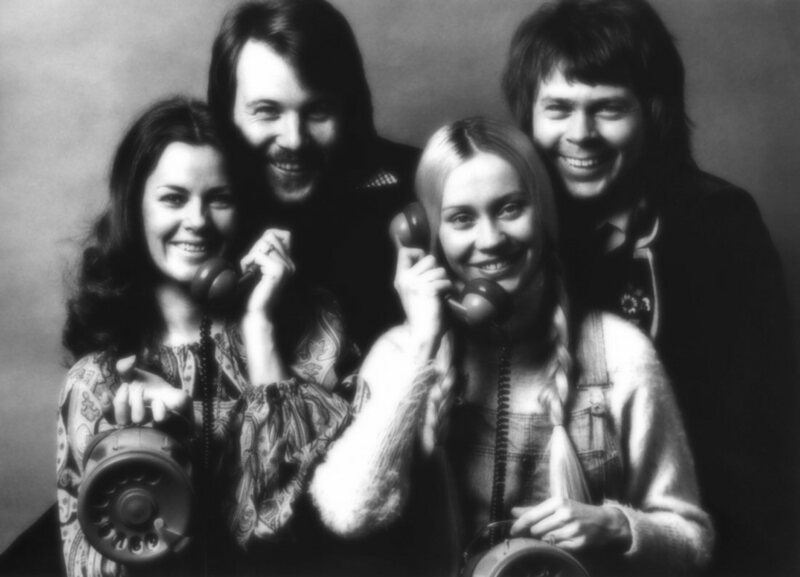 They appeared in the TV-show "Sommerlördag" (The Summer Saturday) where they performed "Love Isn't Easy" (the latest single release) and "Ring Ring". 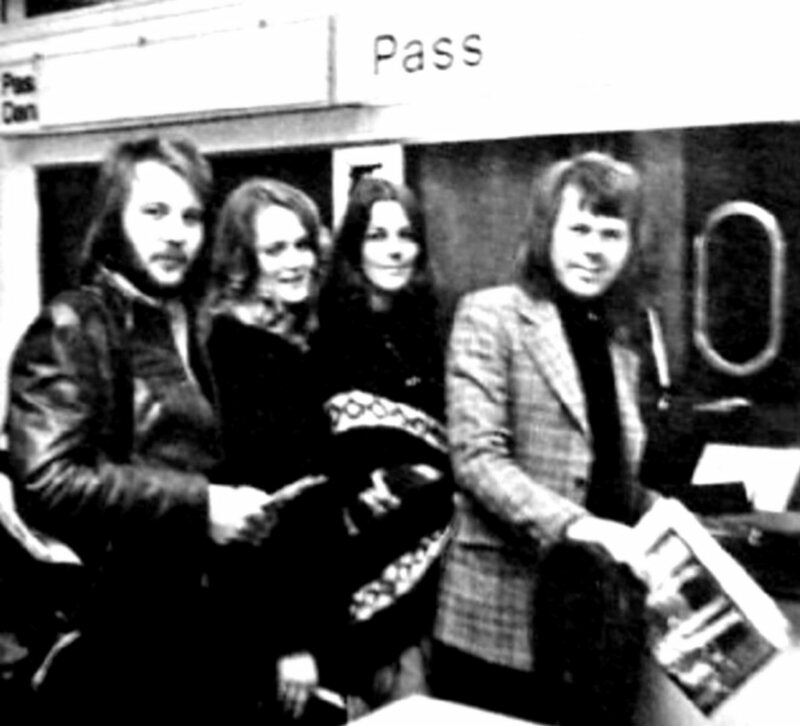 They signed their LP in the "Fona" music shop on Ströget in Copenhagen but the interest for the group was very low... 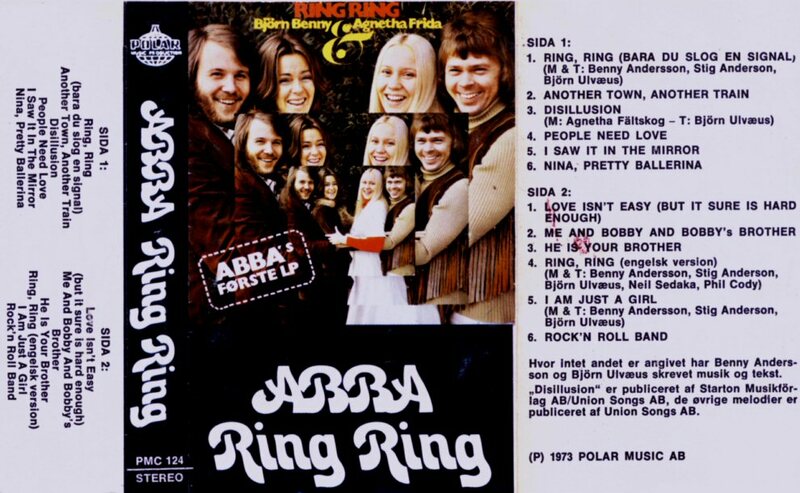 Both the single and the album "Ring Ring" were though released in Denmark with slightly different layout. 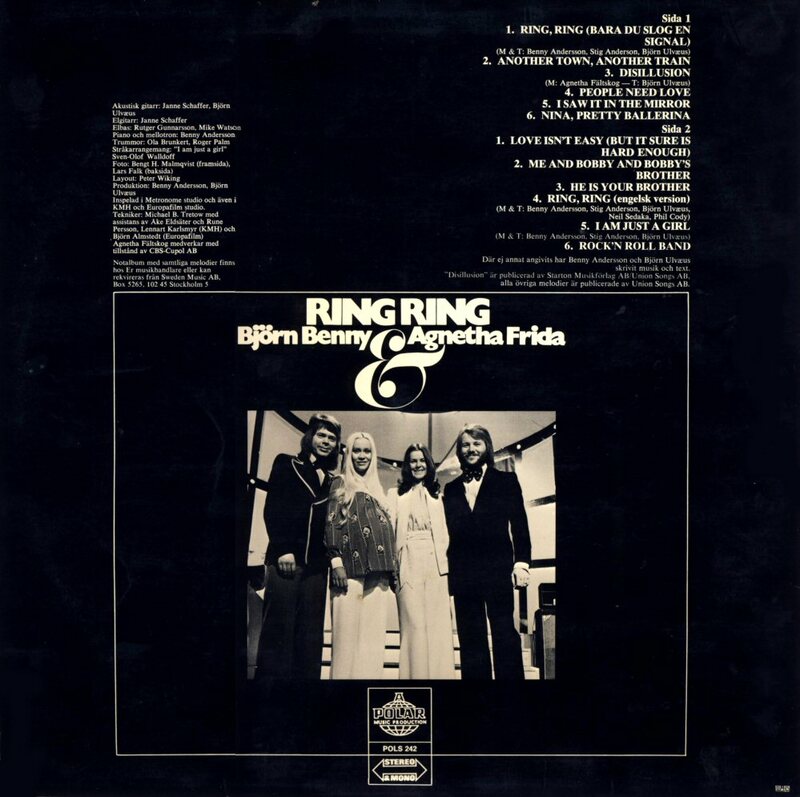 In France "Ring Ring" was released on May 11th, 1973 reached only #82. 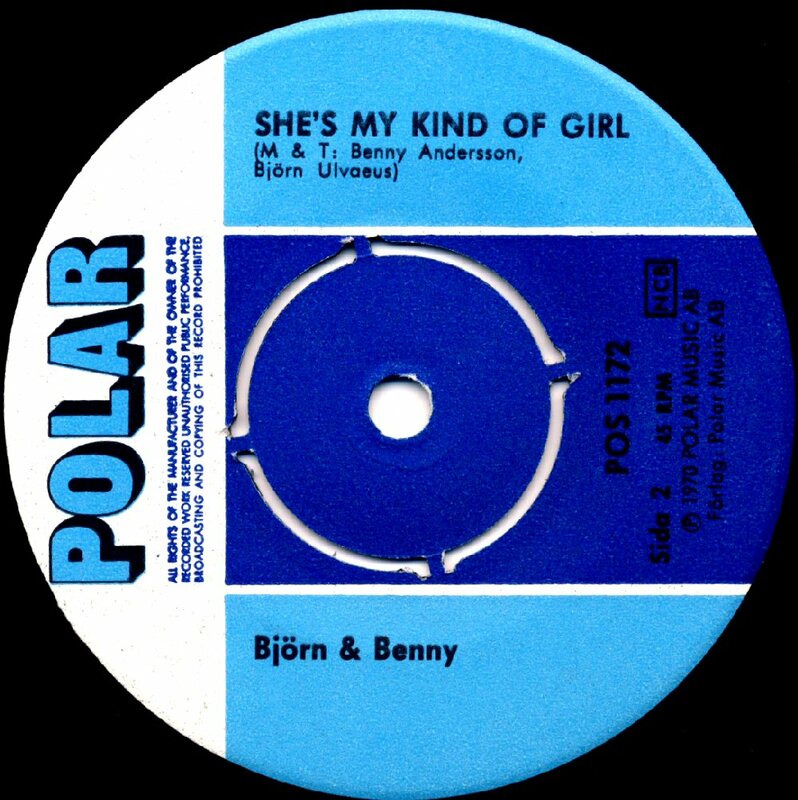 In Belgium the single entered the chart top in June 1973. 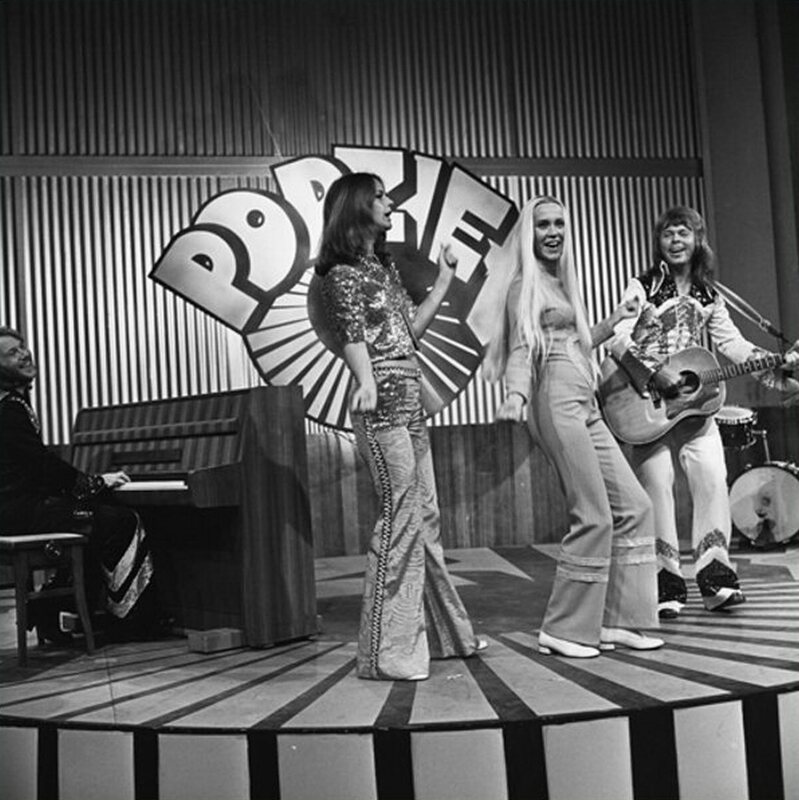 The group promoted "Ring Ring" on Belgian TV in May 1973. 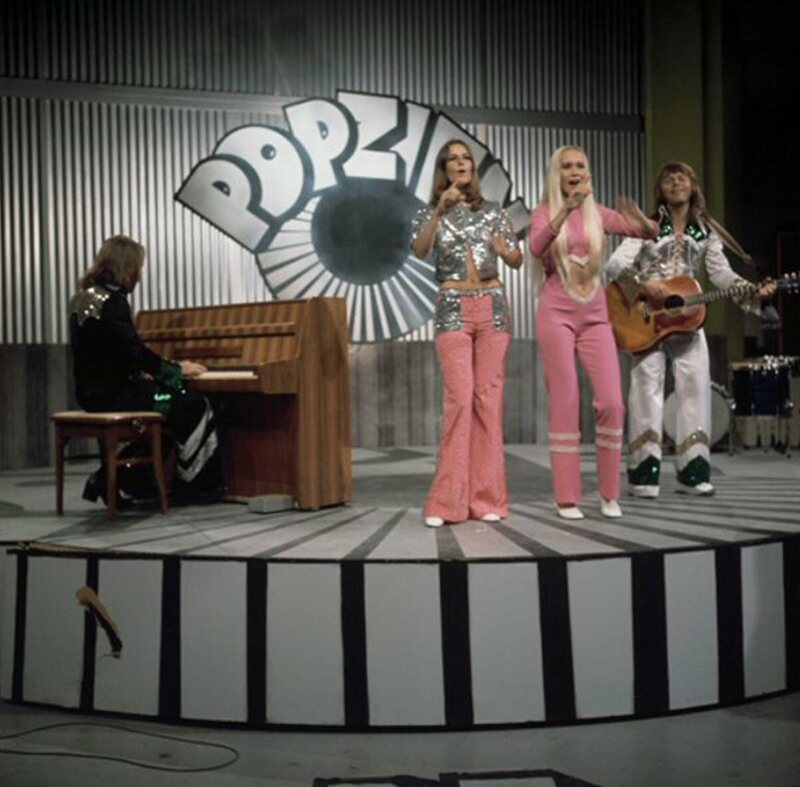 They even appeared in Holland in the TV show "Popzien" in May. 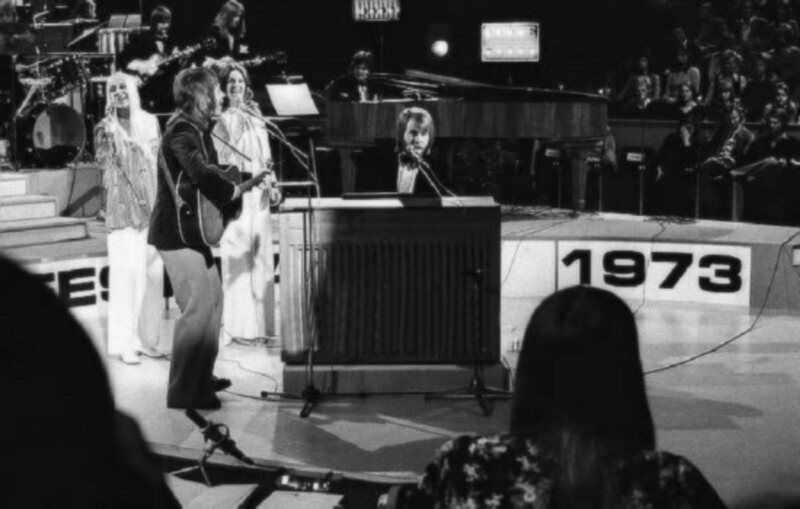 The show was broadcasted on June 8th, 1973. 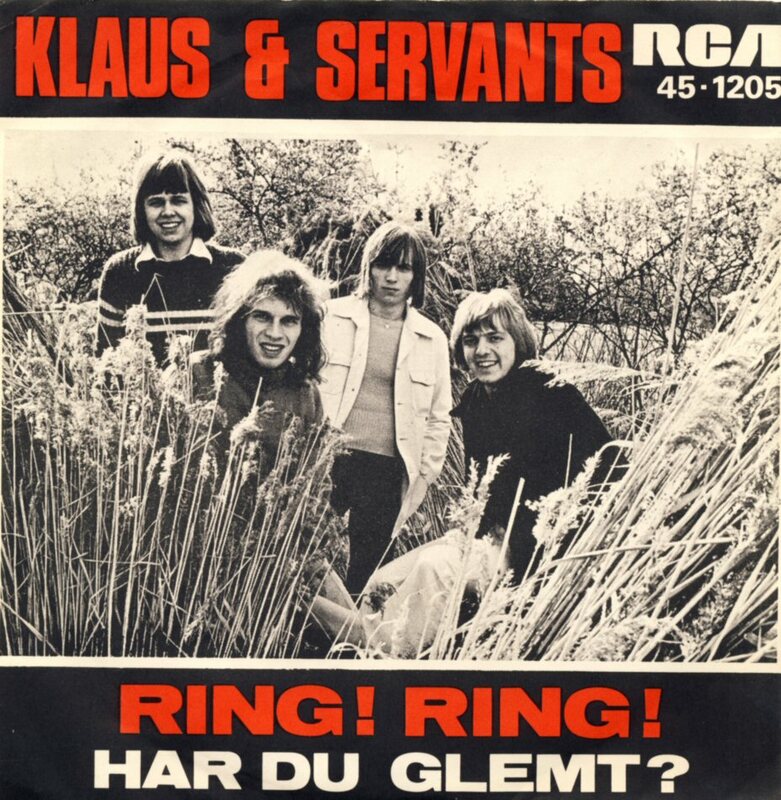 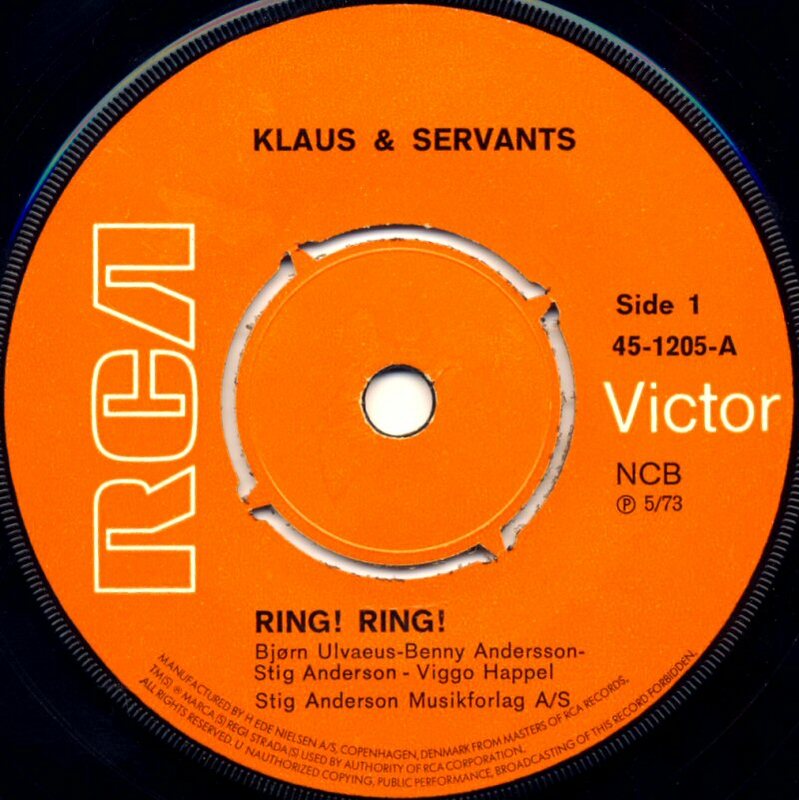 The Danish group "Klaus & Servants" recorded "Ring Ring" in Danish and released as a single in the early summer 1973. 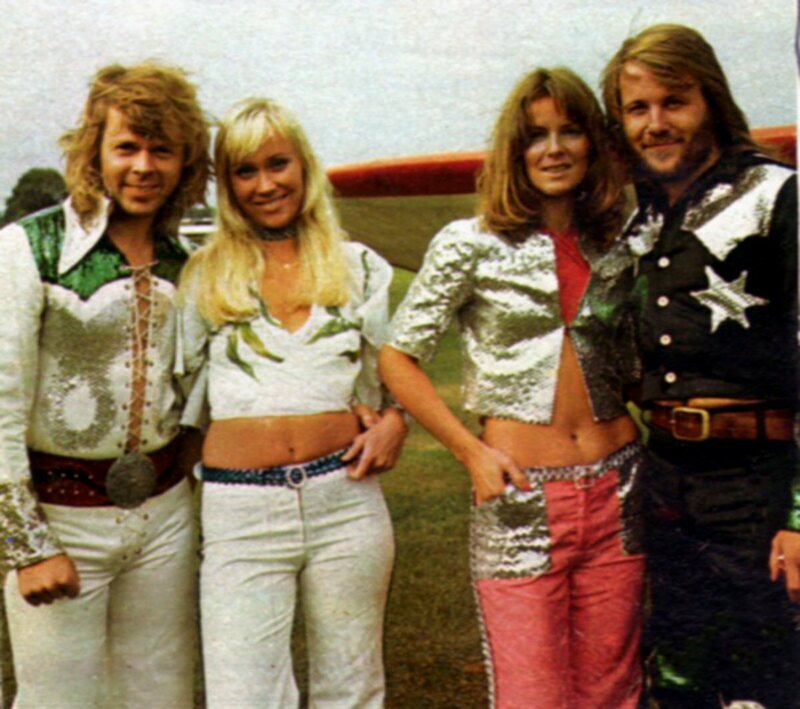 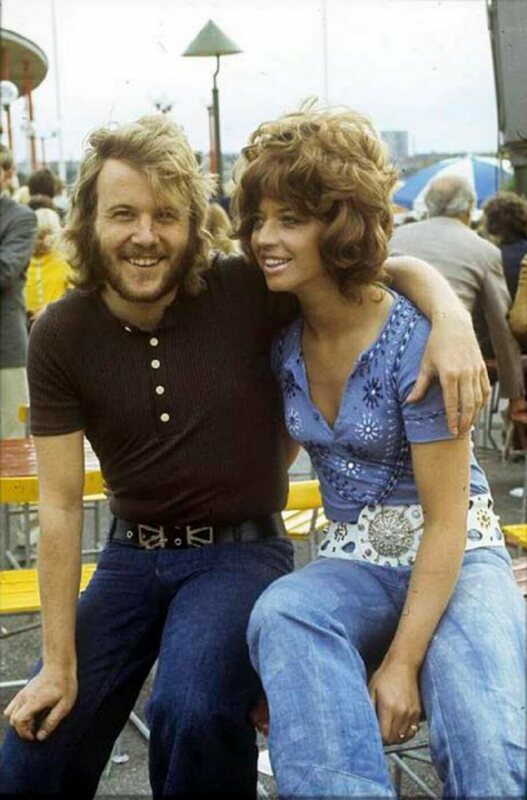 ABBA wanted to be known in West Germany. 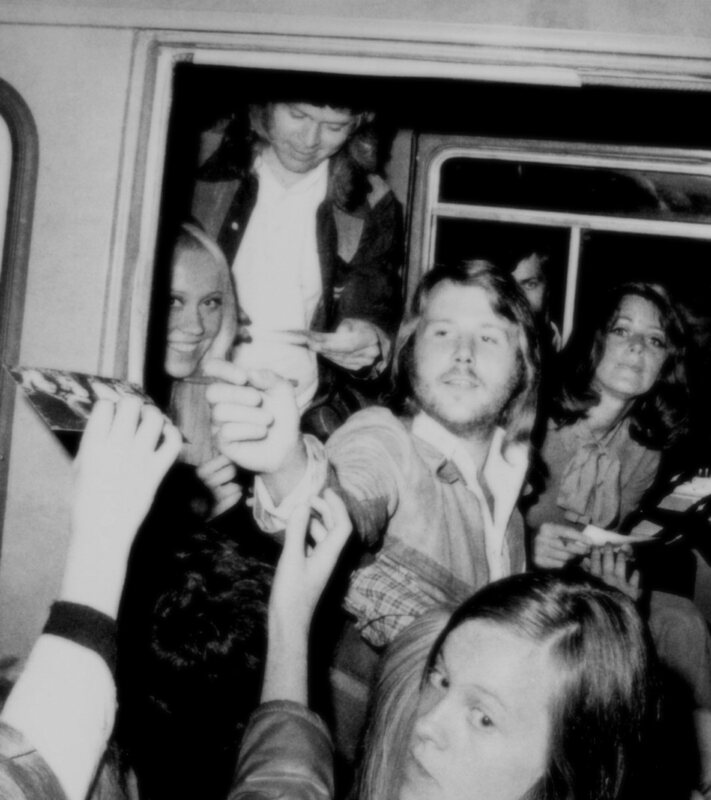 The mini promotional tour was made in March 73 in West Germany and Austria. 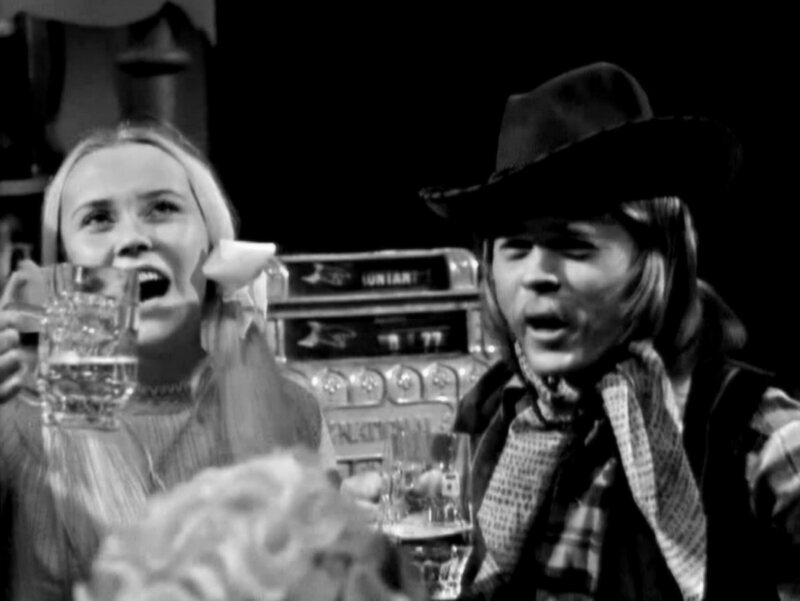 Now it was time to do a new attack on the German market. 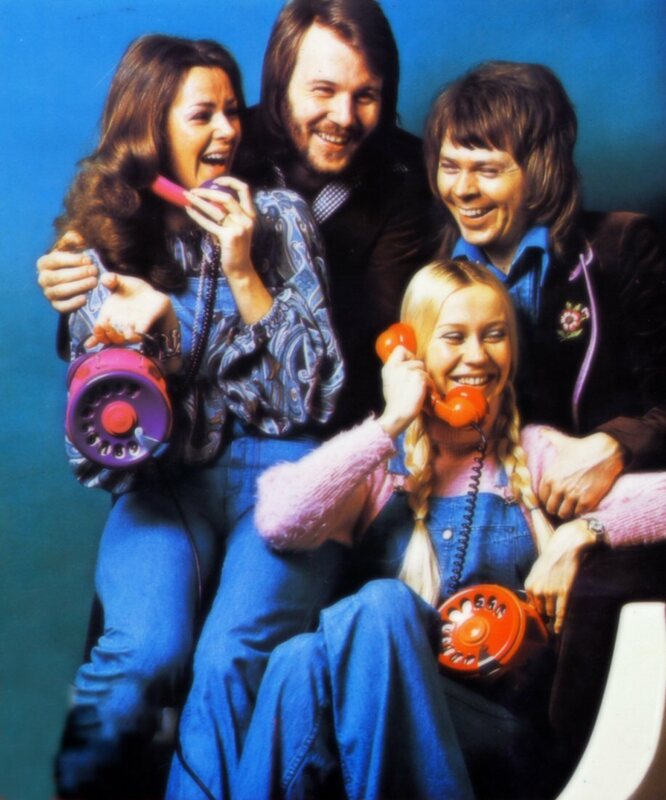 On July 23rd 1973 ABBA recorded "Ring Ring" and "Another Town Another Train" in German language for a single release along with the "Ring Ring" album release in West Germany. 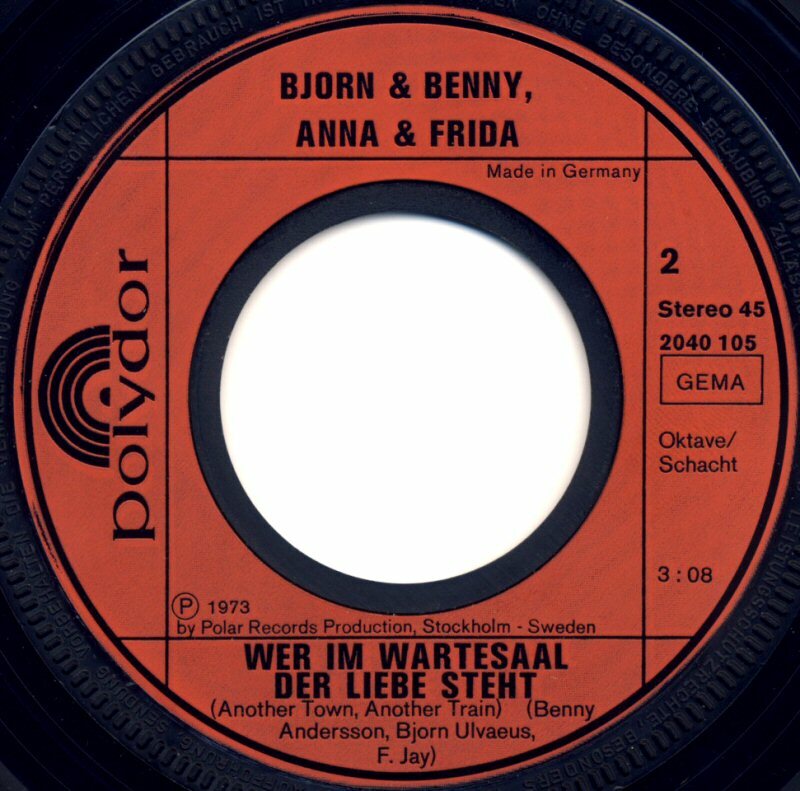 The German title of "Another Town Another Train" was "Wer im Wartesaal der Liebe steht". 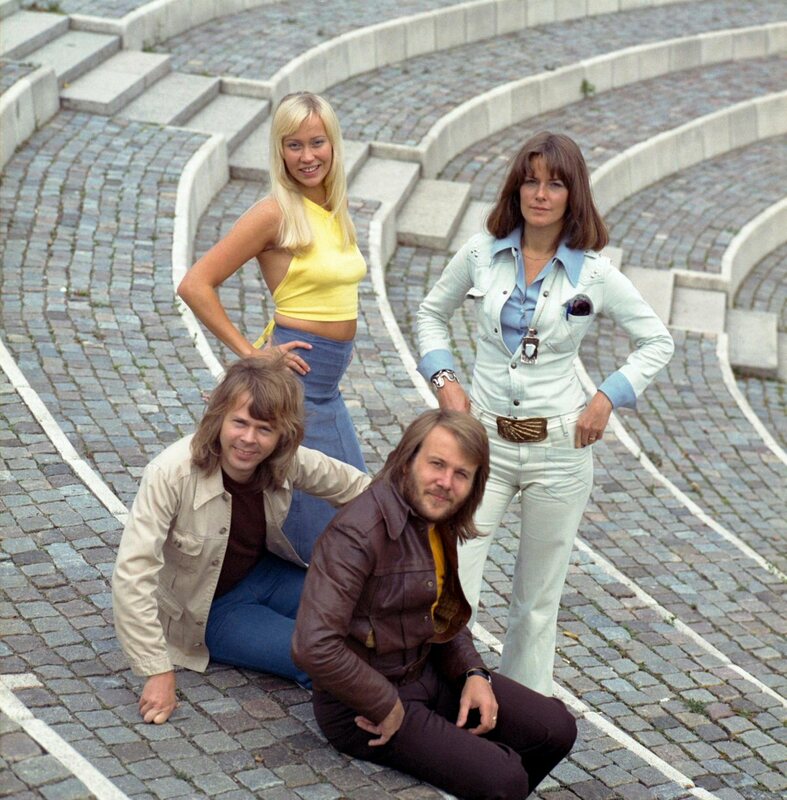 As the group was totally unknown the Germany the single did not make the single chart and today remains as a one of the rarest ABBA singles. 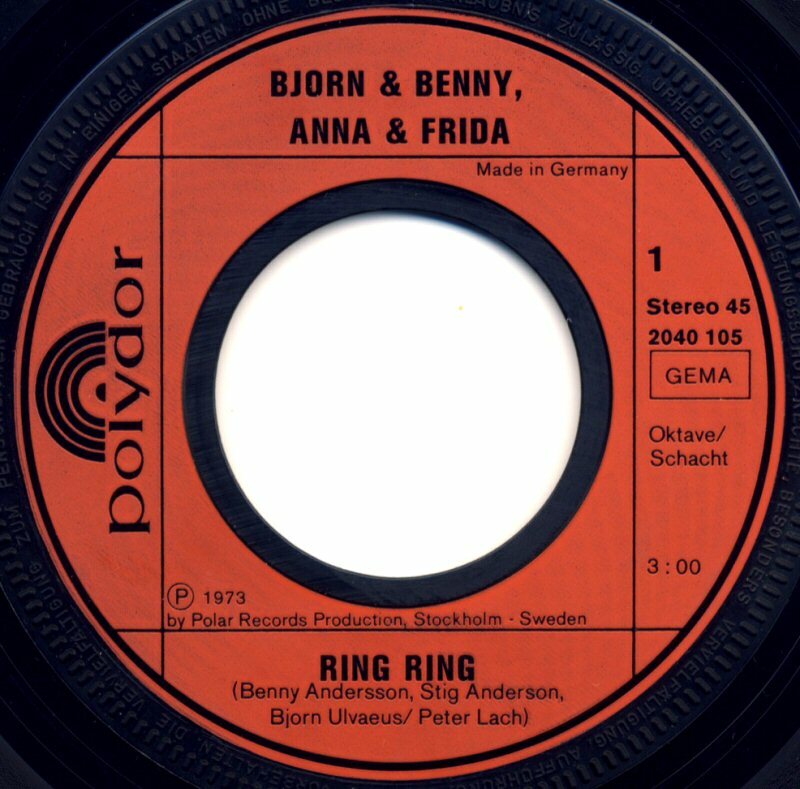 The single "Ring Ring" saw its release in Austria in July 1973. 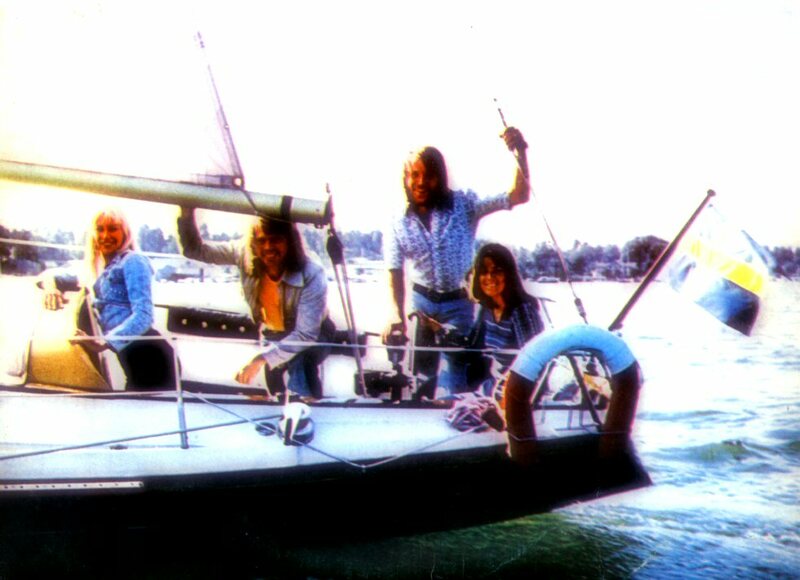 It stayed on the chart for 4 months peaking at #2. 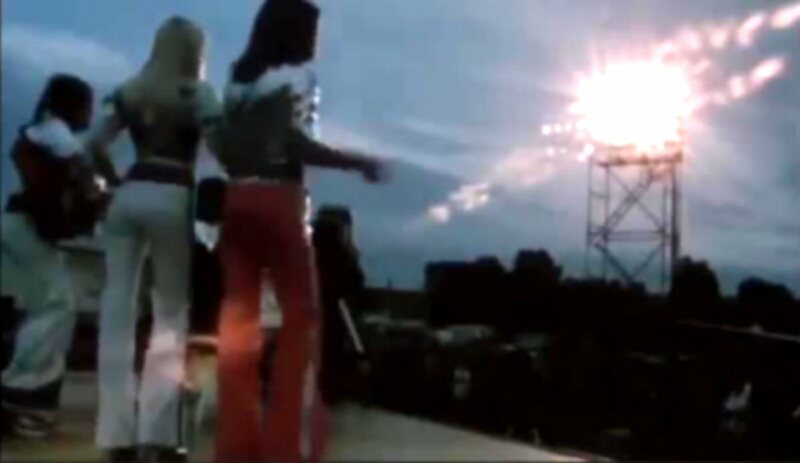 Their big summer tour started on 15 June 1973 in Göteborg and after 58 shows ended in Malmö on September 9, 1973. 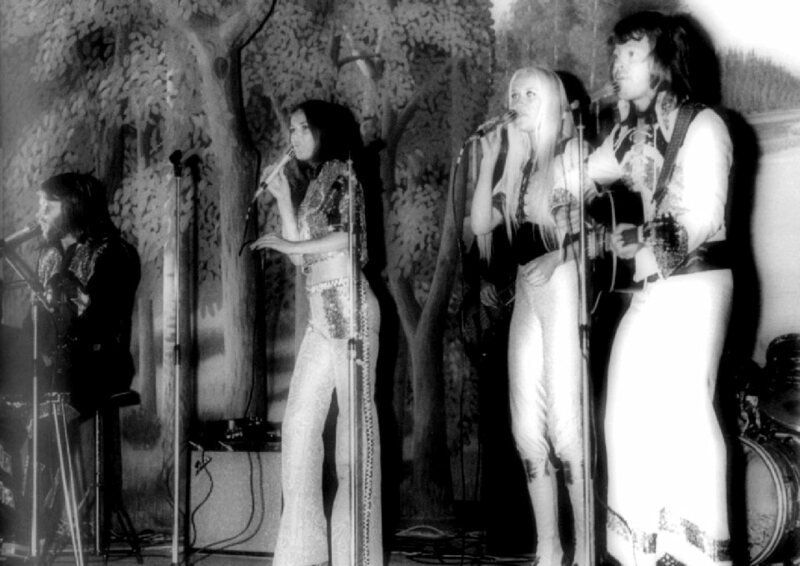 The show included several songs and lasted for approximetely 30 minutes. 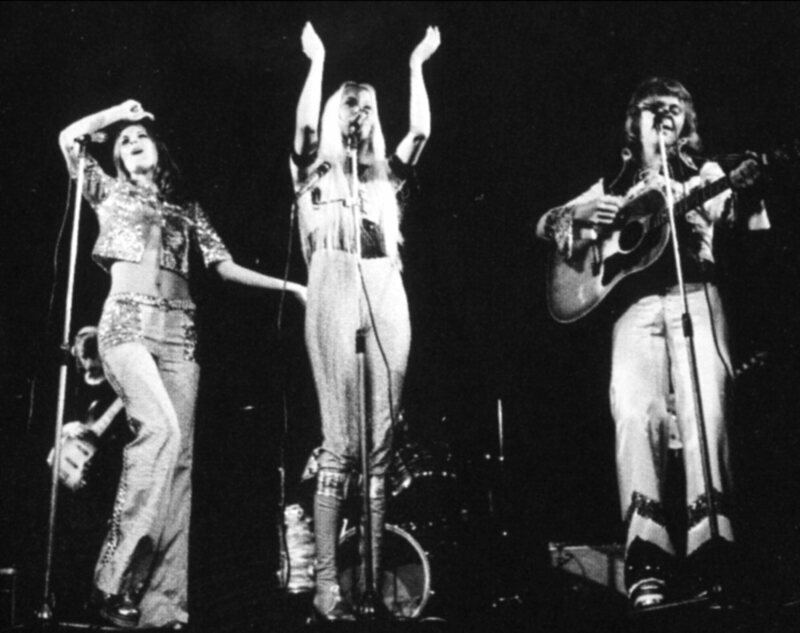 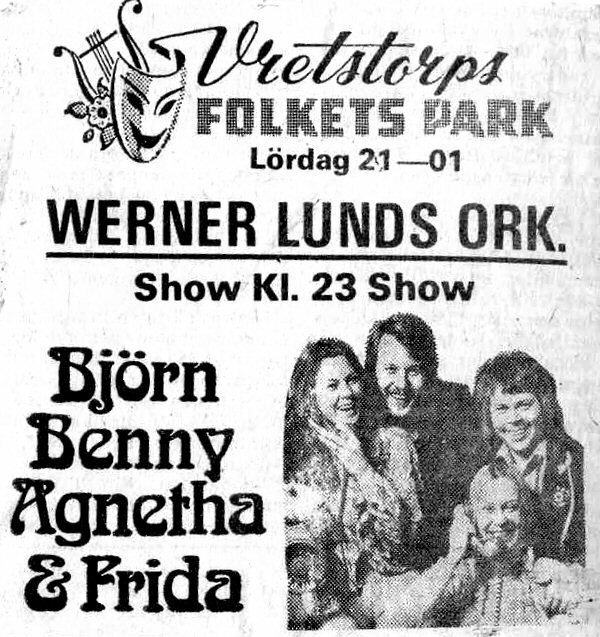 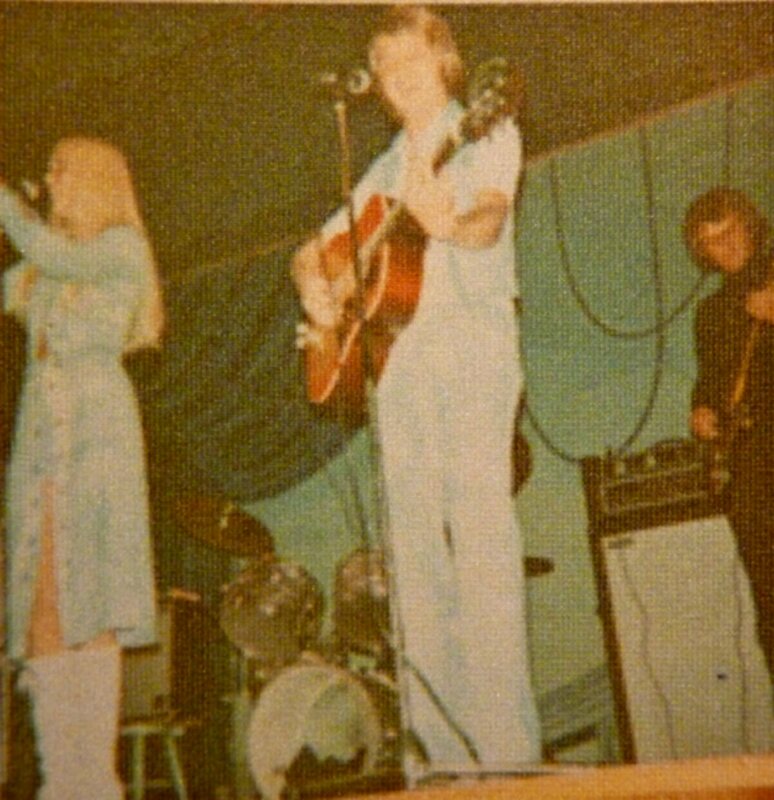 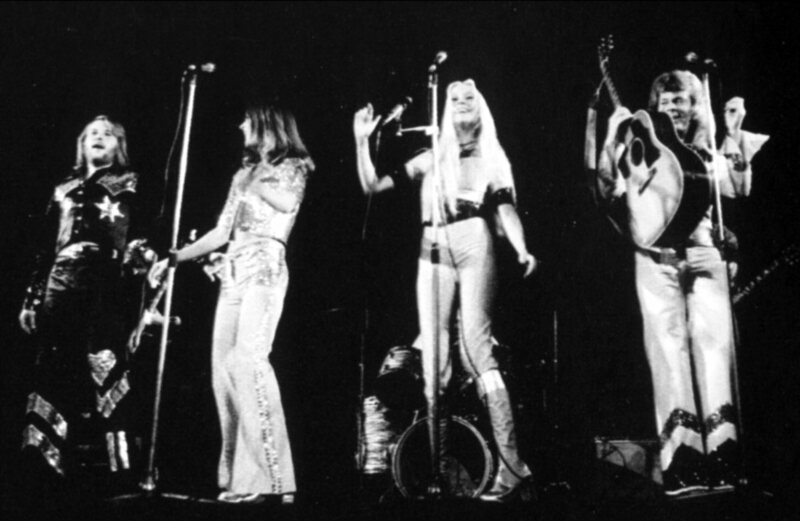 On September 1st, 1973 ABBA performed in Vretstorps Folkets park. 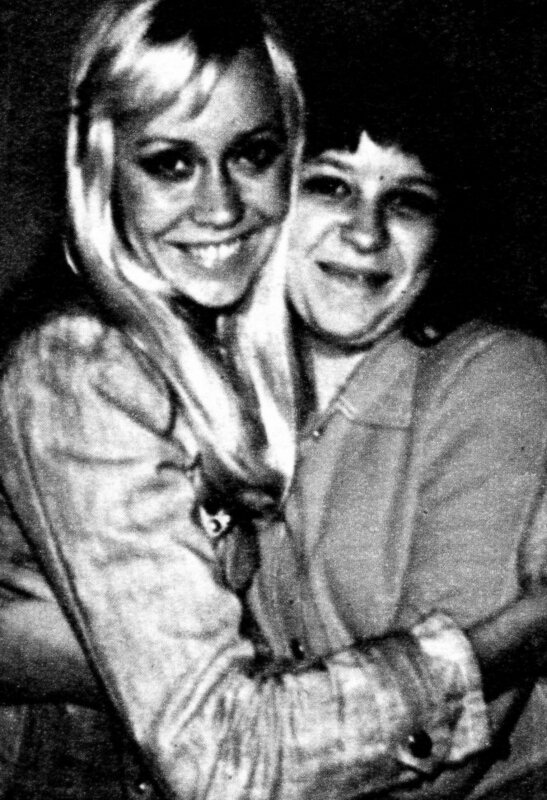 After the show Agnetha posed for photos with her fans. 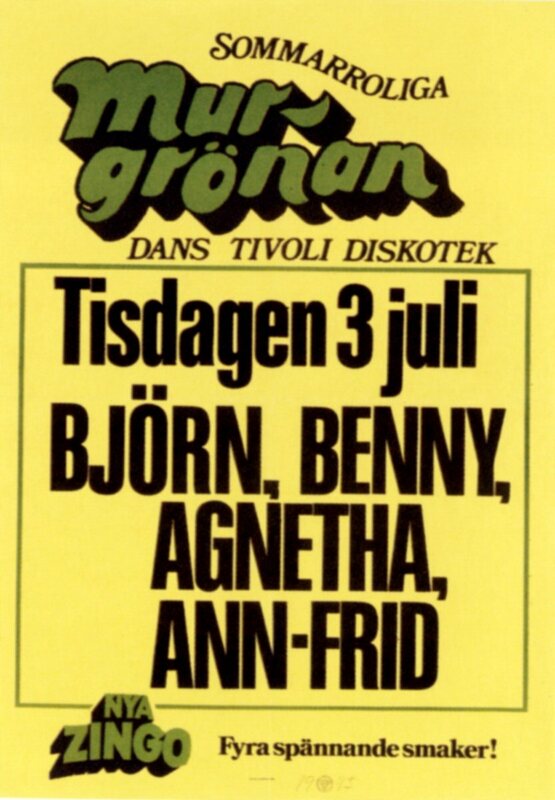 One of them was published 3 years later in Swedish gossip magazine "Hänt i veckan". 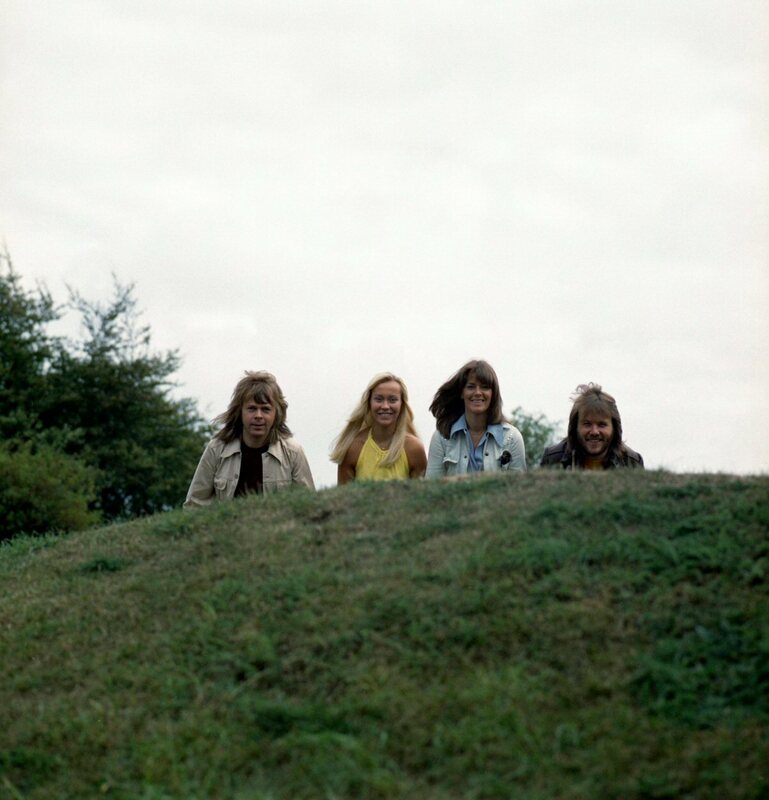 This photo session was taken in the Pildammsparken in Malmö in September 1973 during the tour. 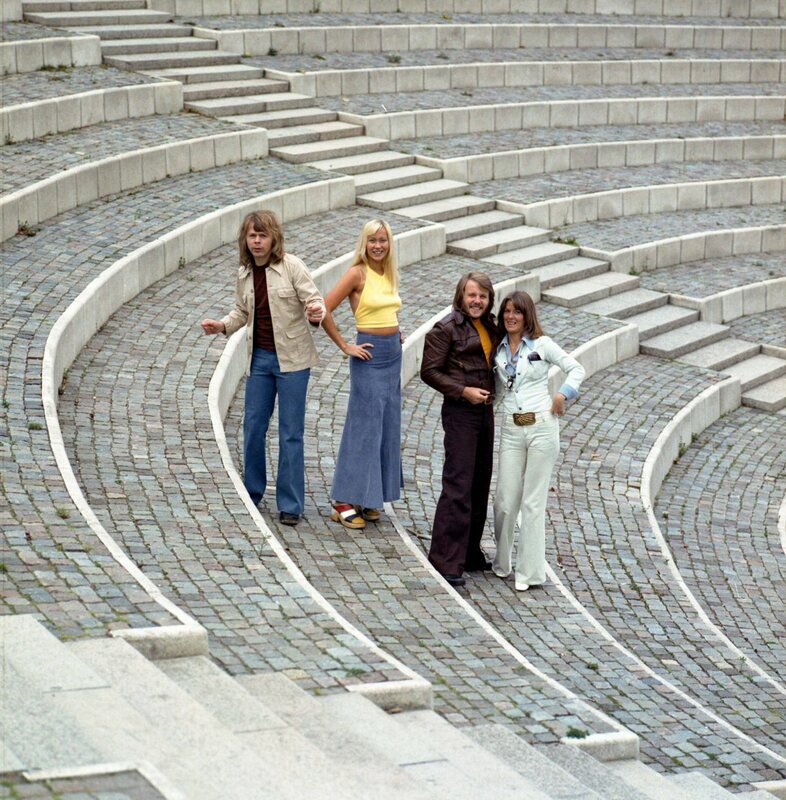 In August 1973 ABBA performed "Ring Ring" in the show "Momarkedet" in Oslo, Norway. 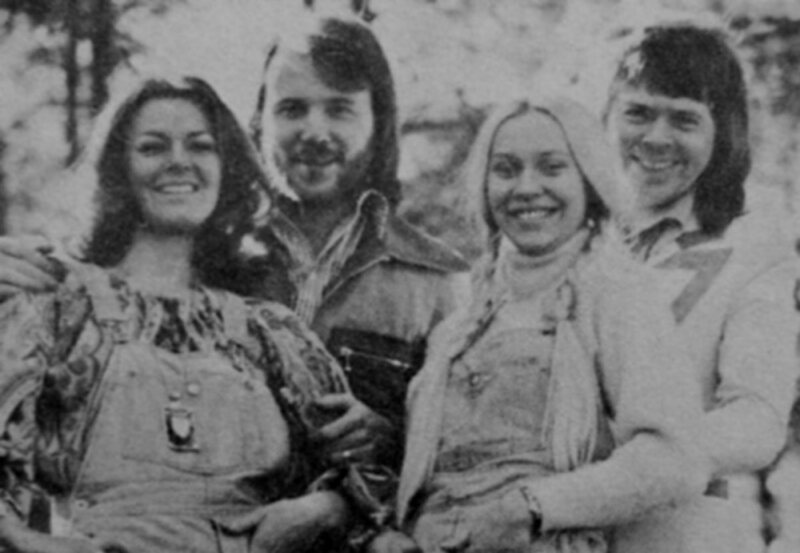 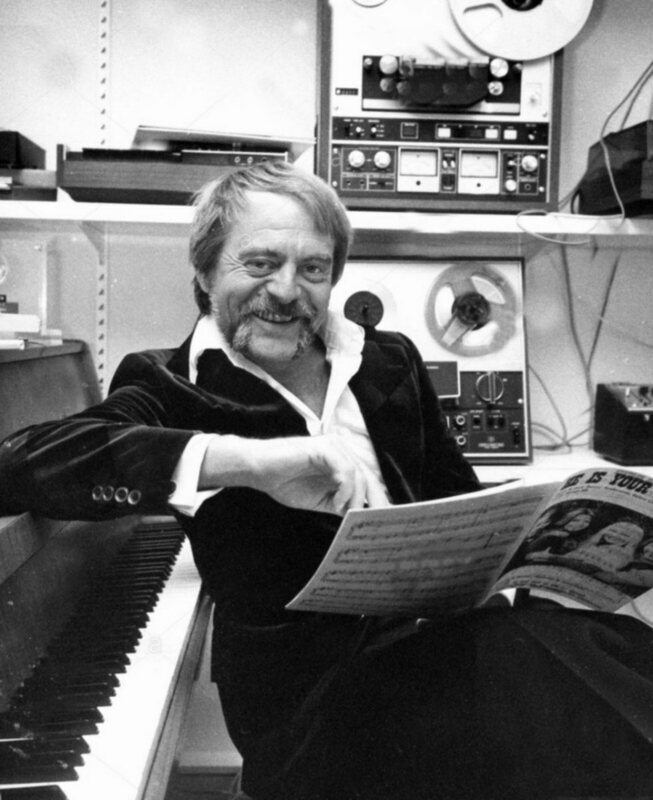 Polar Music AB celebrated the first ten years as a company in the summer 1973. 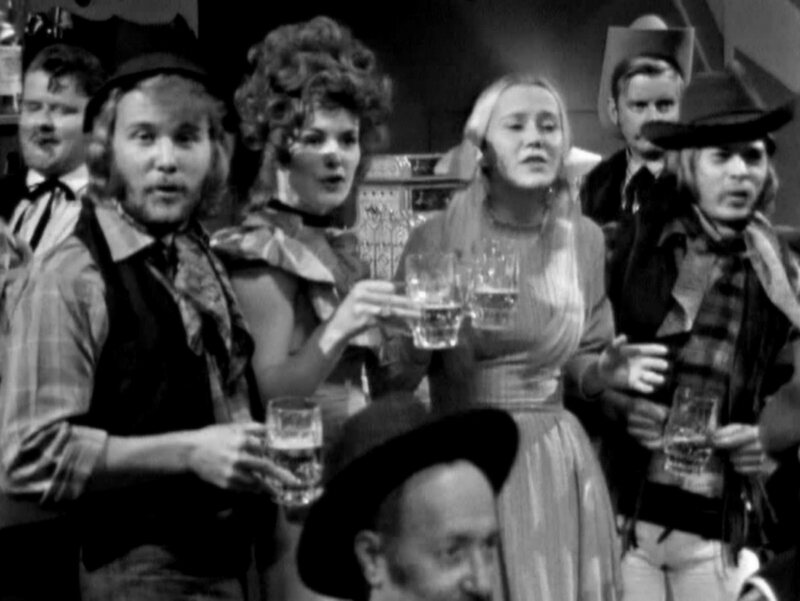 A big party was arranged by Stikkan Anderson. 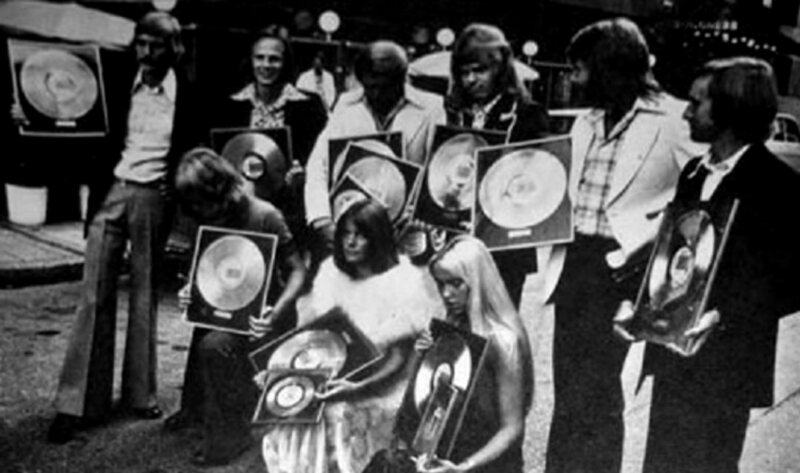 Agnetha, Björn, Frida, Benny, Ted Gärdestad and Hootenanny Singers received gold discs for their latest albums. 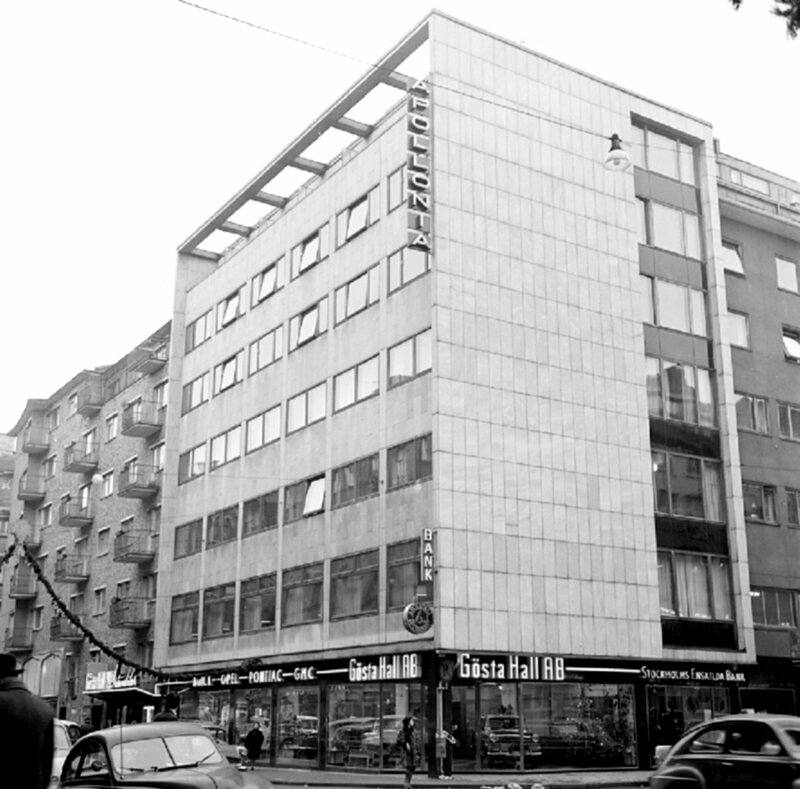 The award ceremony took place at the hotel "Apollonia" in Nybrogatan 53 in Stockholm. 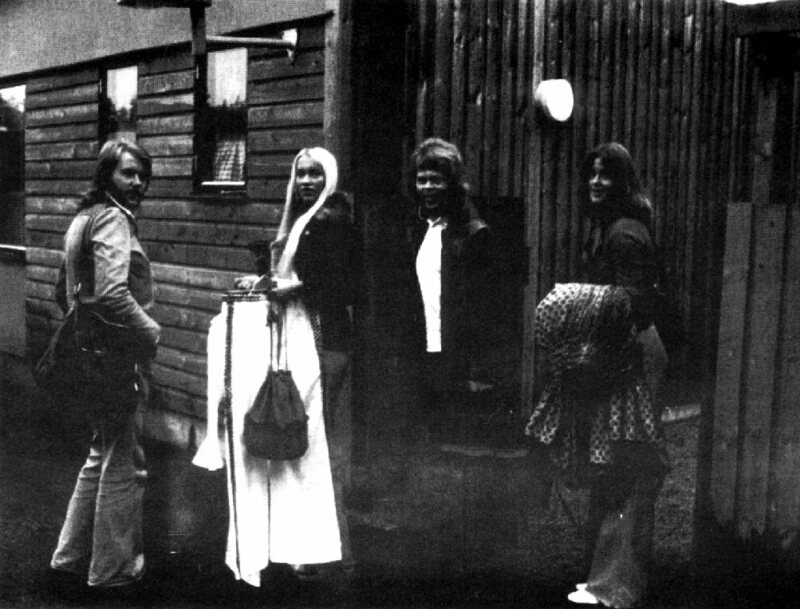 The party continued in Nacka outside Stockholm in Stikkan's house. 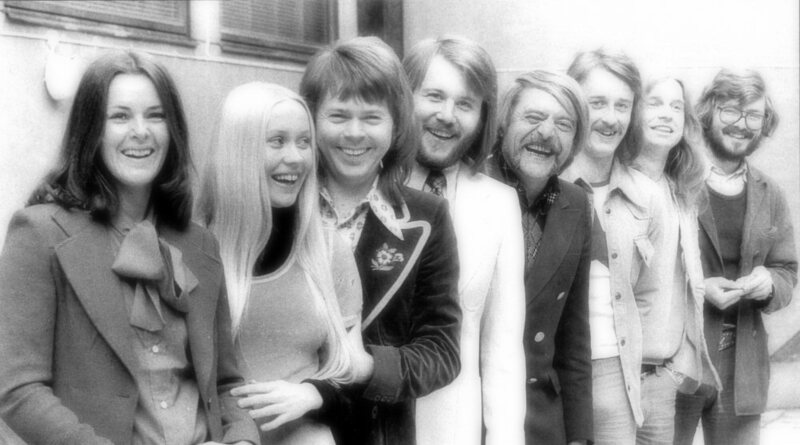 An anniversary album "Sånt som slog" (Stuff that became hits) featuring the greatest hits recorded by the Polar artists was released at the same time. 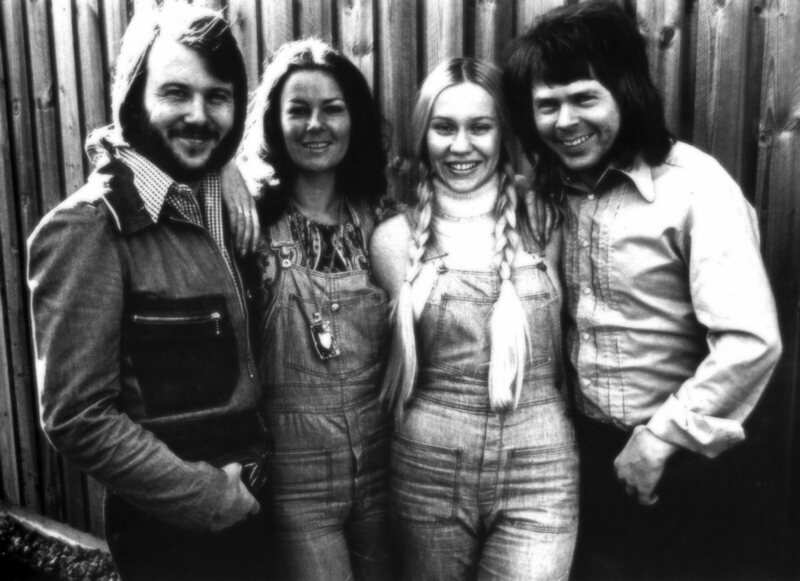 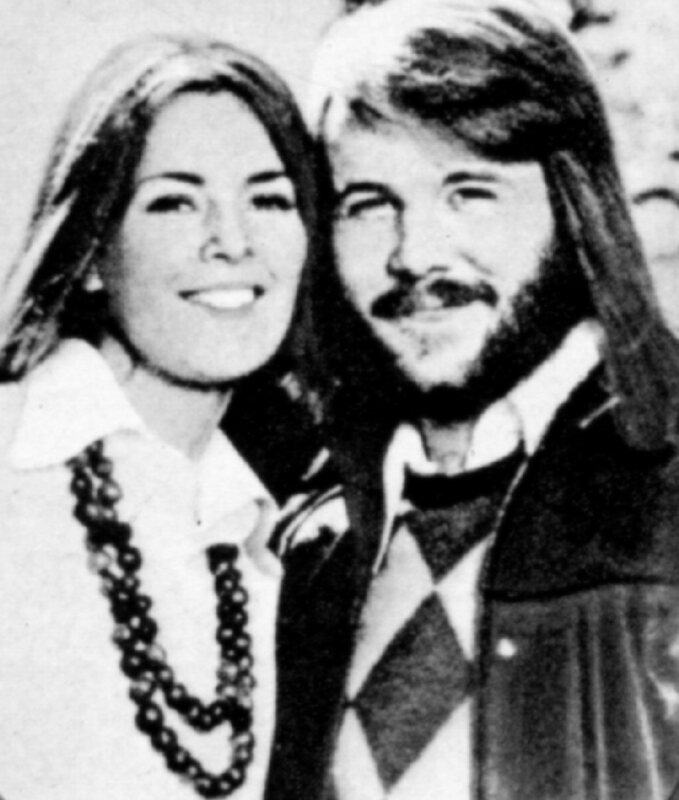 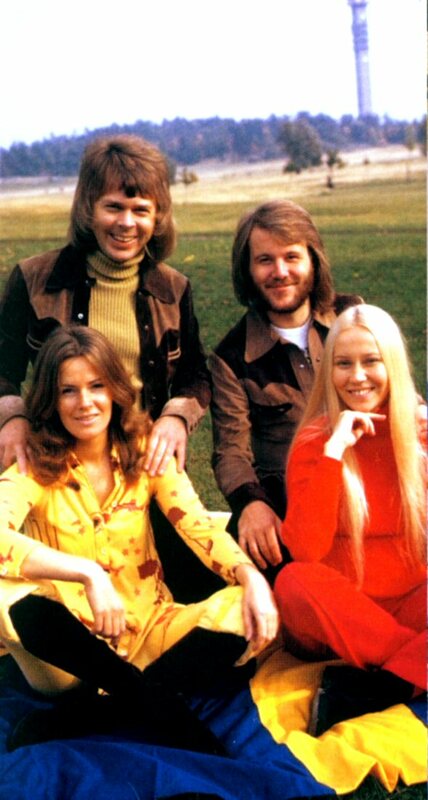 The album contained several songs directly related to the forthcoming ABBA family. 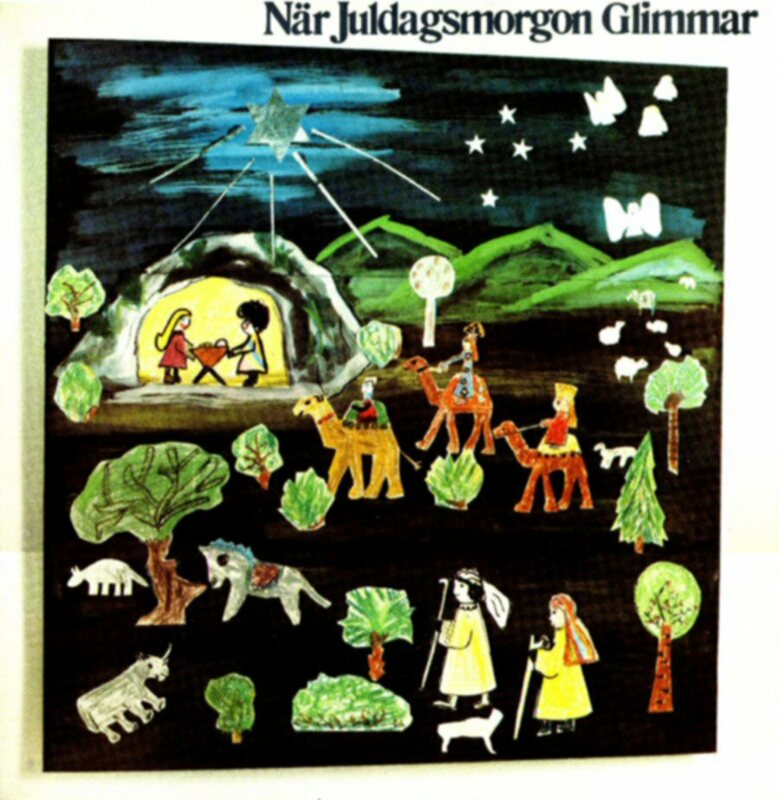 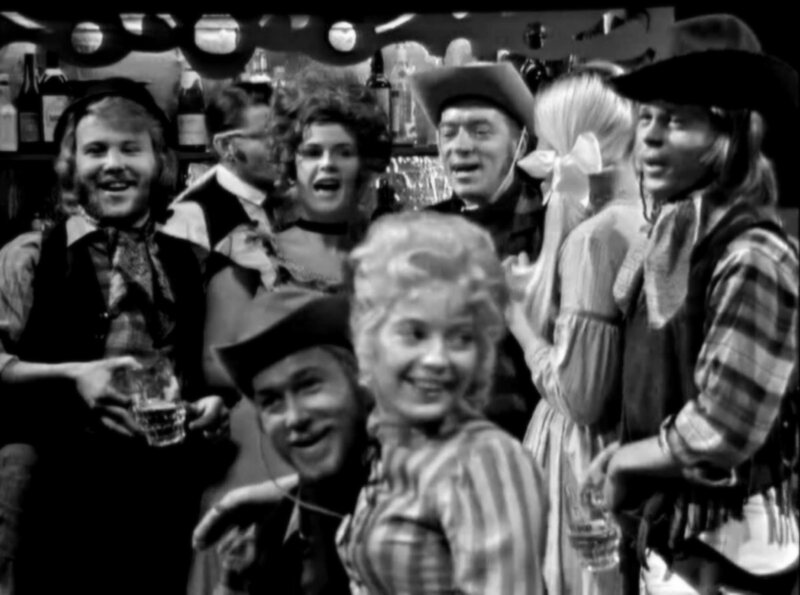 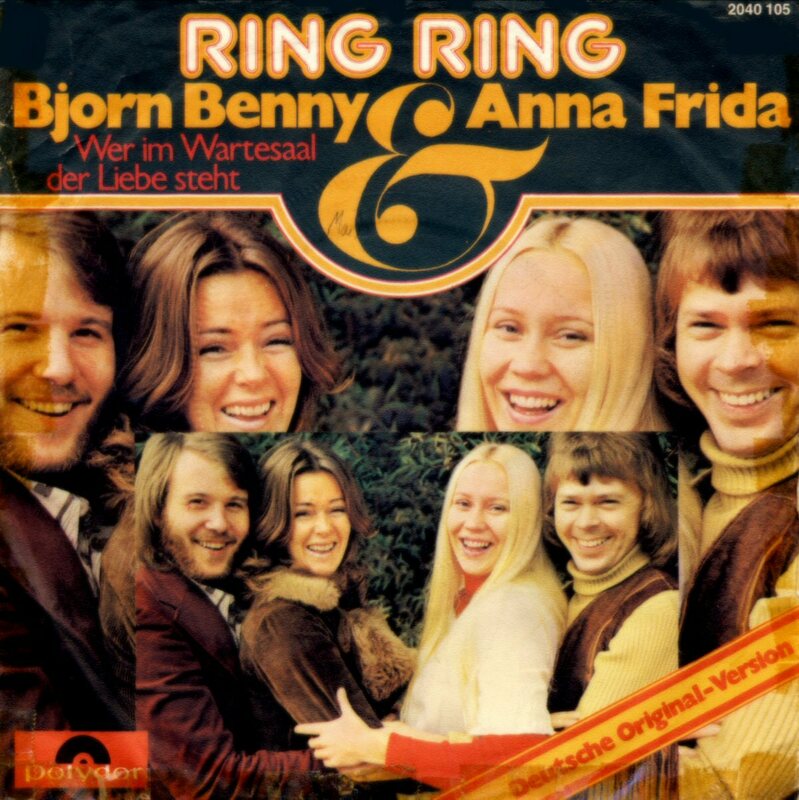 The opening track was "Ring Ring" performed by B & B and A & A and it was followed by among others: Hej Gamle Man (B & B), Aldrig mer (Hootenanny Singers), Björkens visa (Hootenanny Singers), Ljuva sextital (written by B & B and Stikkan, performed by Brita Borg), Säj det med en sång (written by Björn, Stikkan and Benny, performed by Lena Andersson) and Gabrielle (Hootenanny Singers). 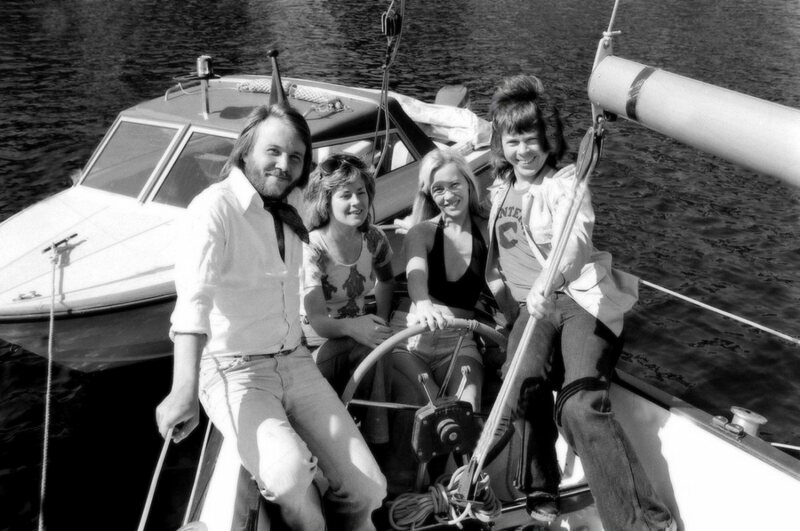 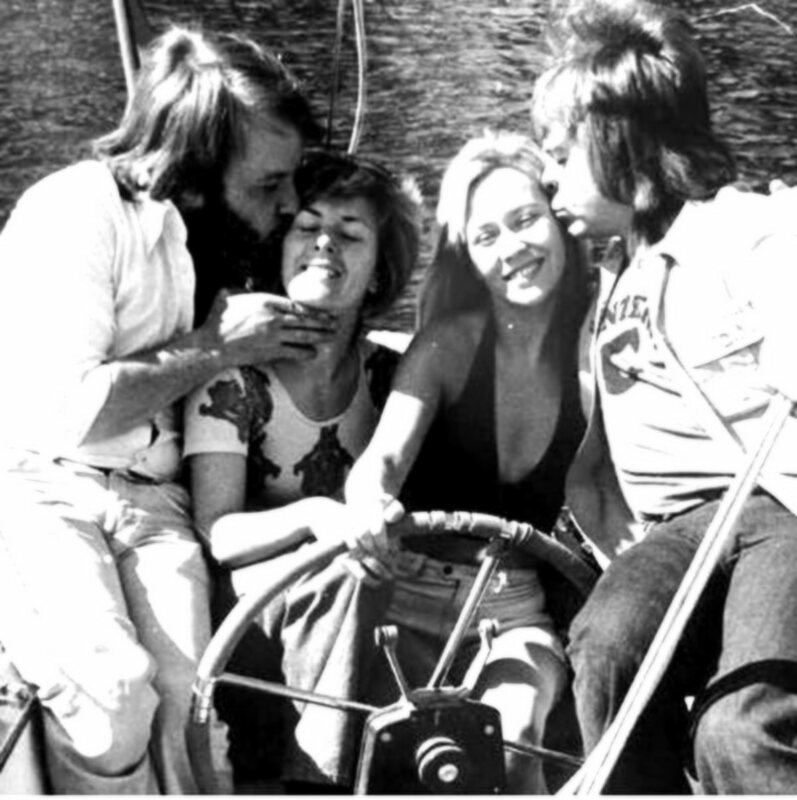 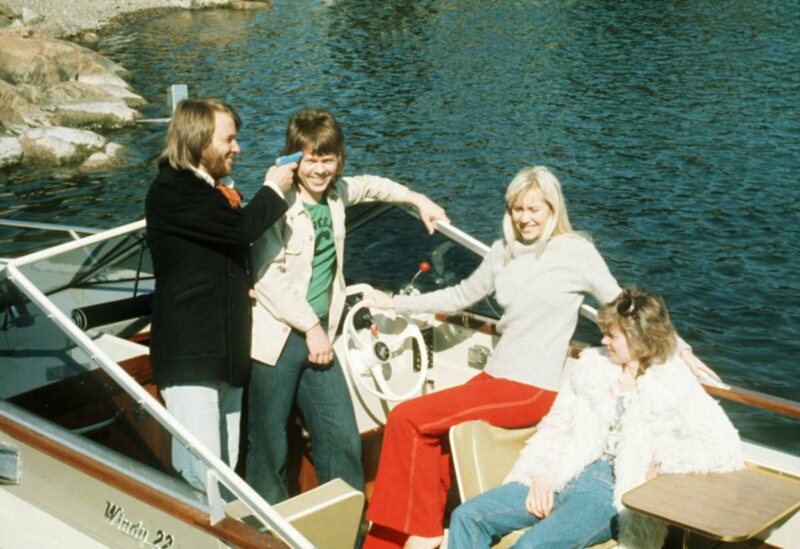 The ABBA members relaxed in the Stockholm archipelago. 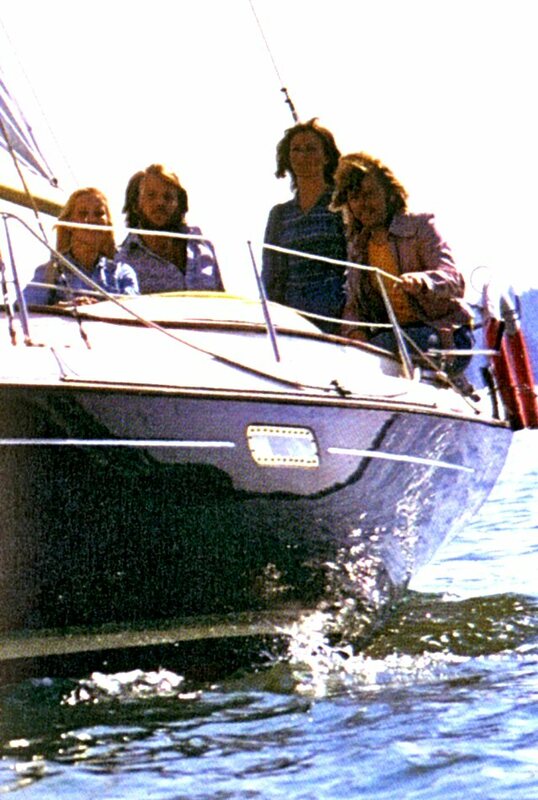 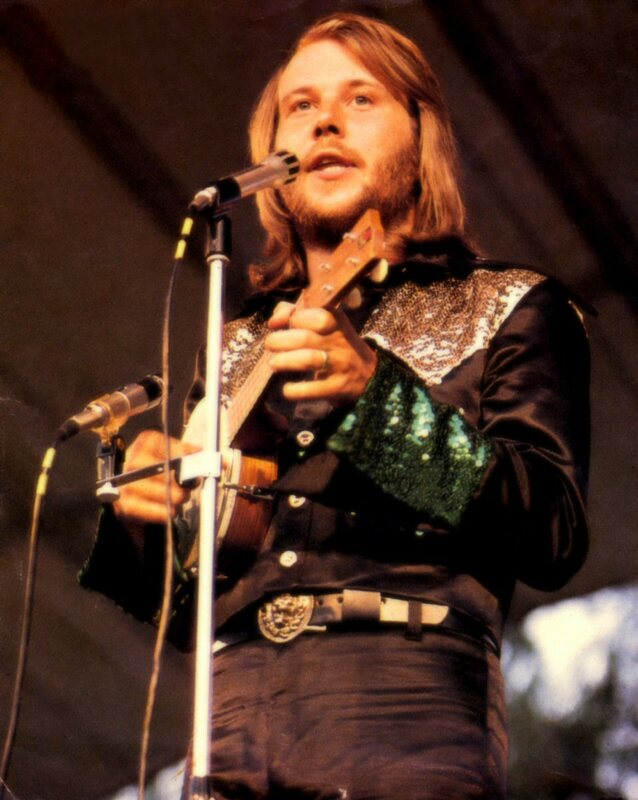 Bengt Malmkvist took several photos in the summer 73. 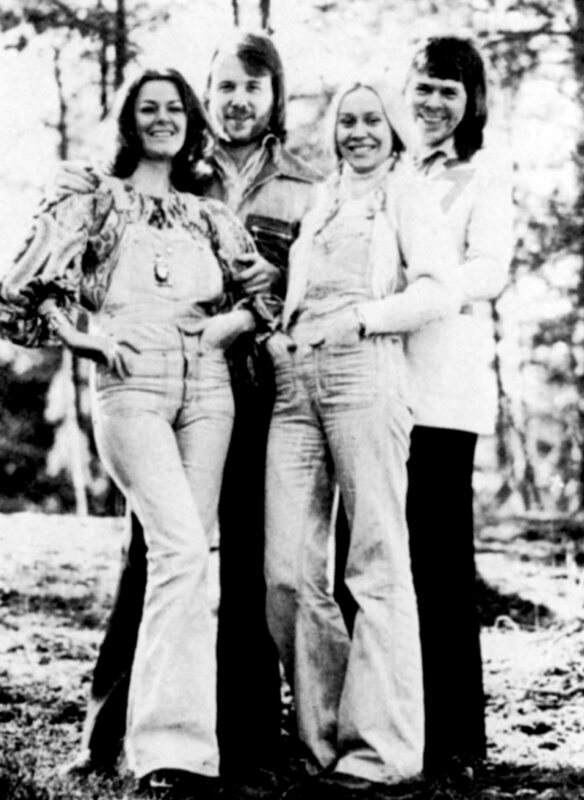 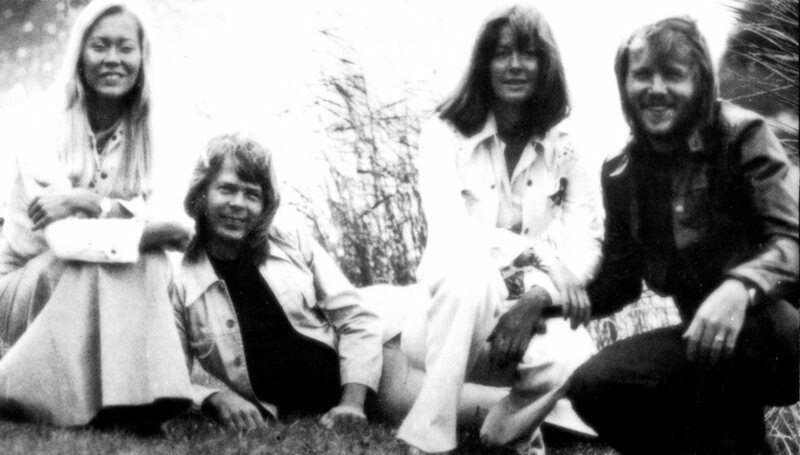 In the autumn 73 ABBA worked in the studio preparing material for a new album. 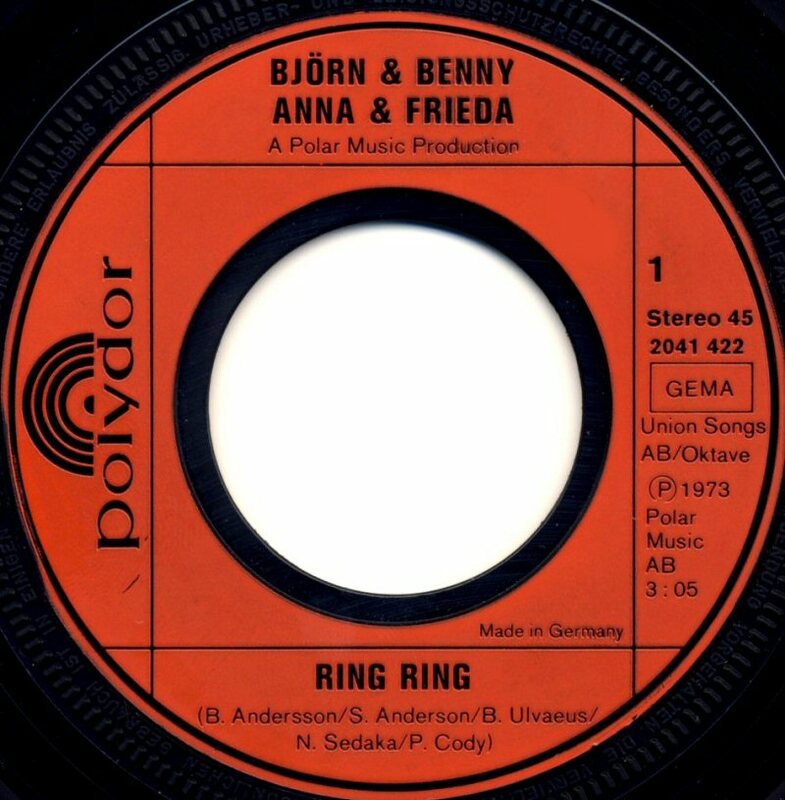 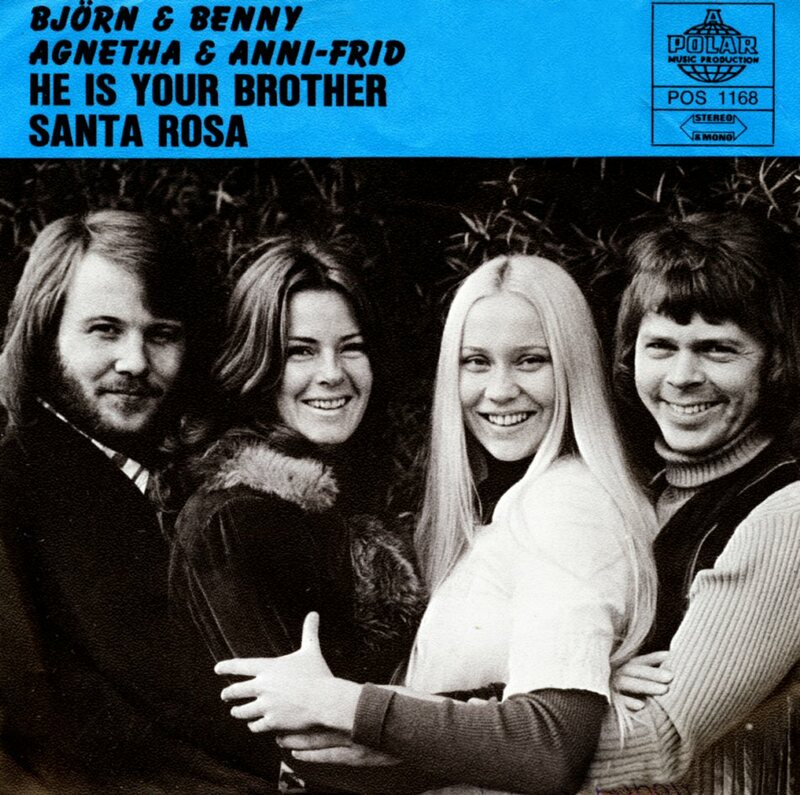 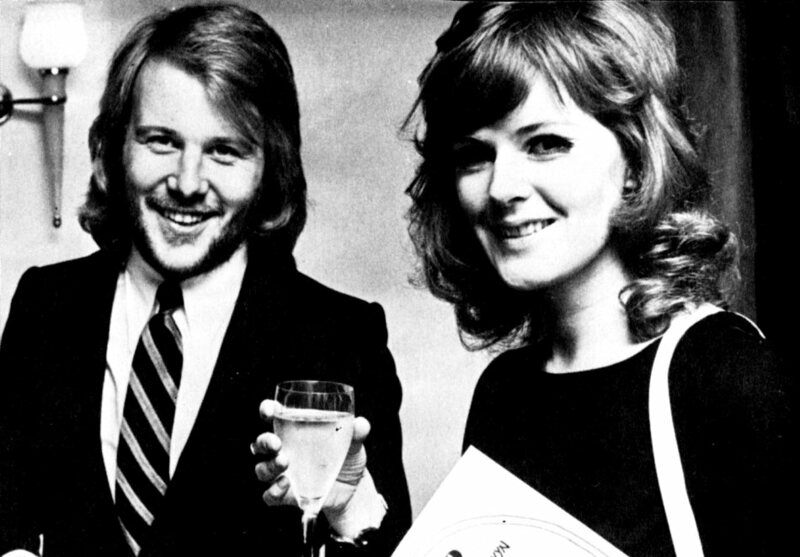 "Ring Ring" credited to Björn & Benny, Anna & Frida appeared on the international compilation album "20 Original Tophits" in West Germany at the end of 1973. 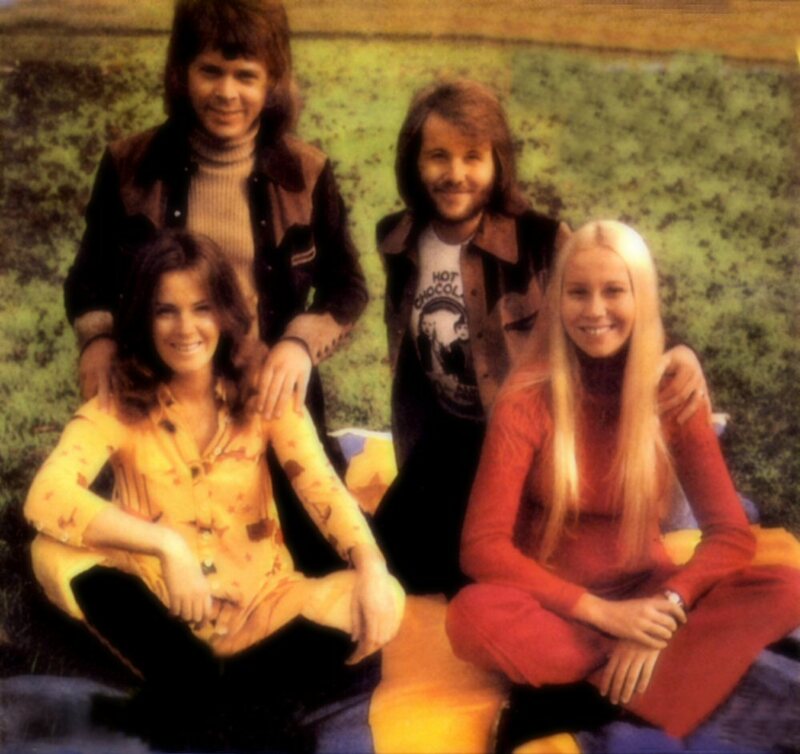 It was probably the very first appearance of an ABBA song on an international compilation album.